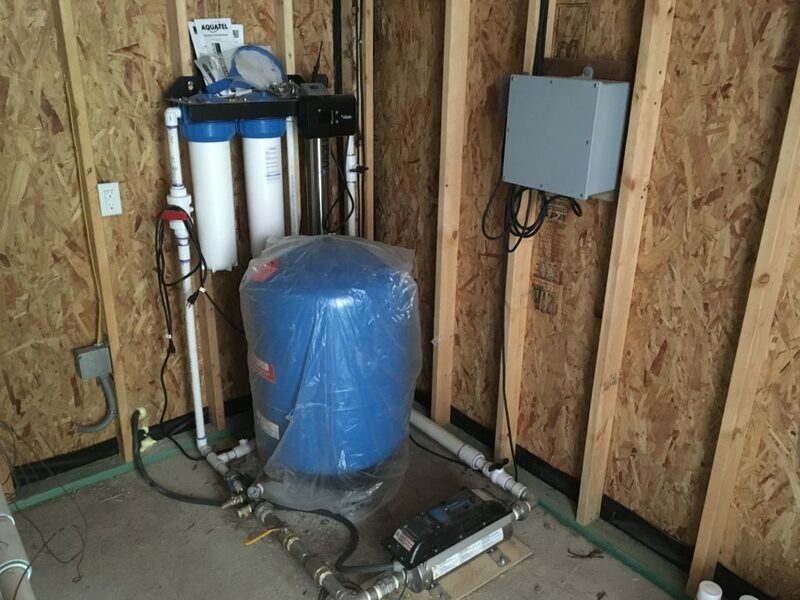 Every system we install has its own unique differences while the outcome is always the same... FREE WATER!!! 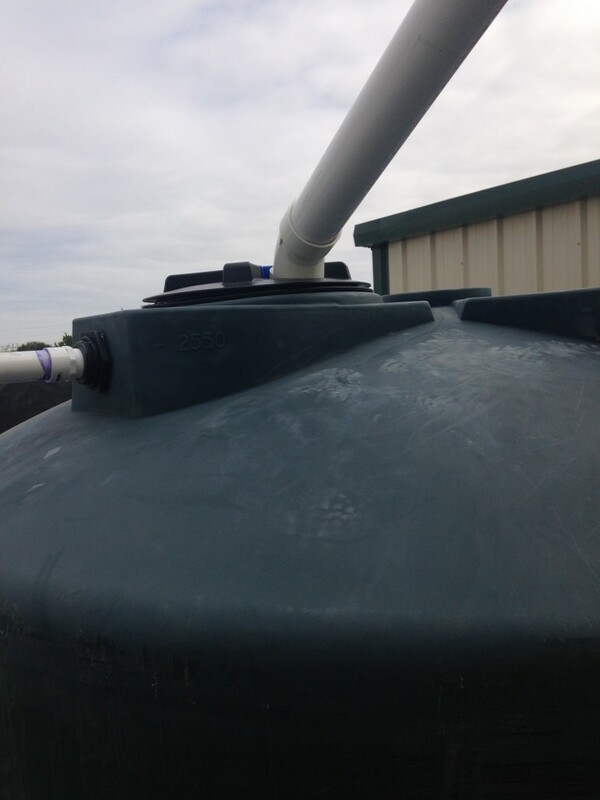 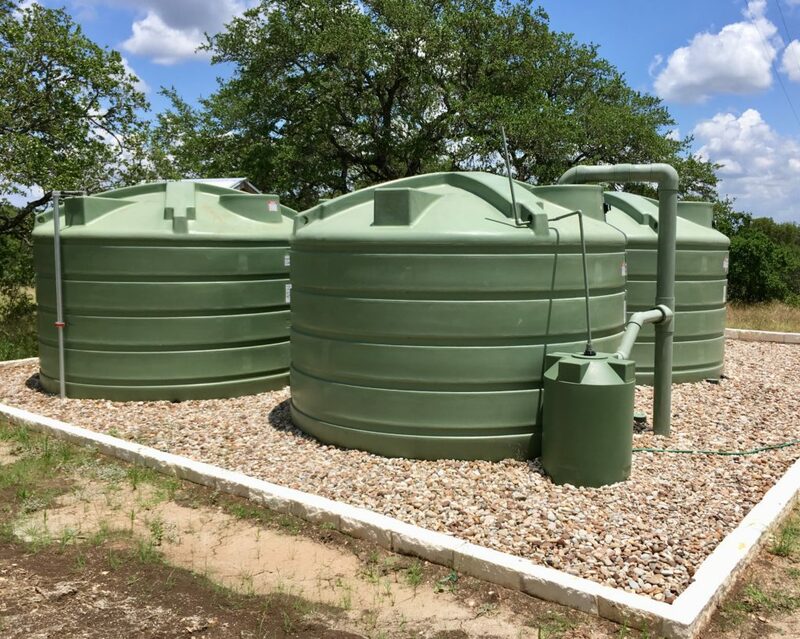 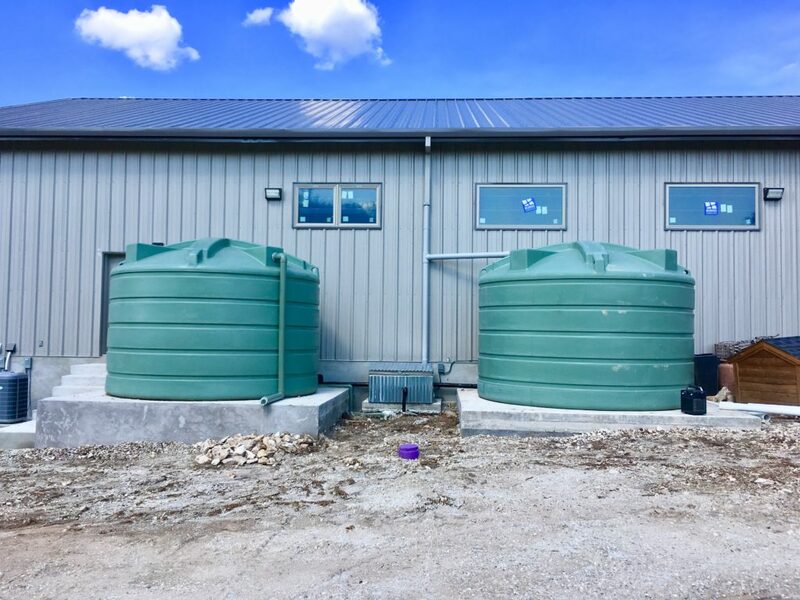 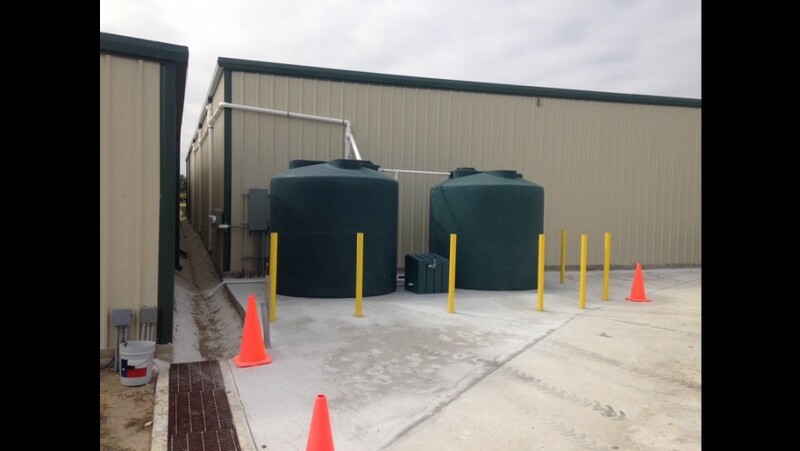 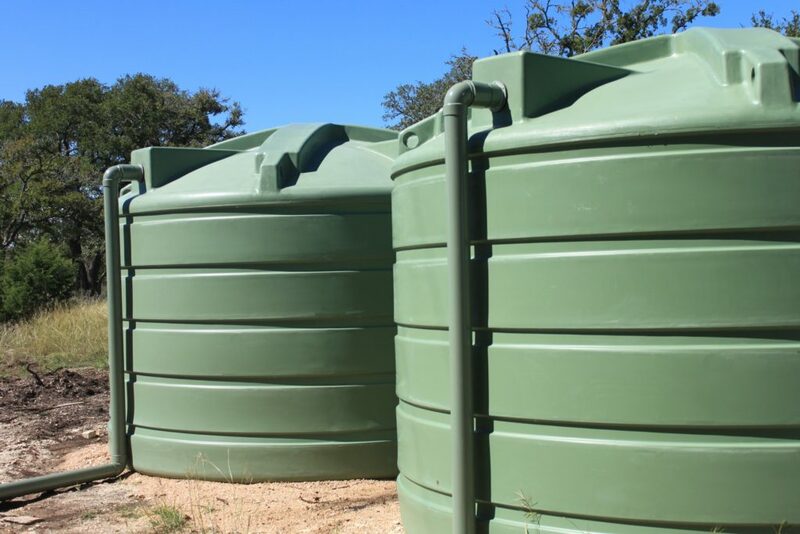 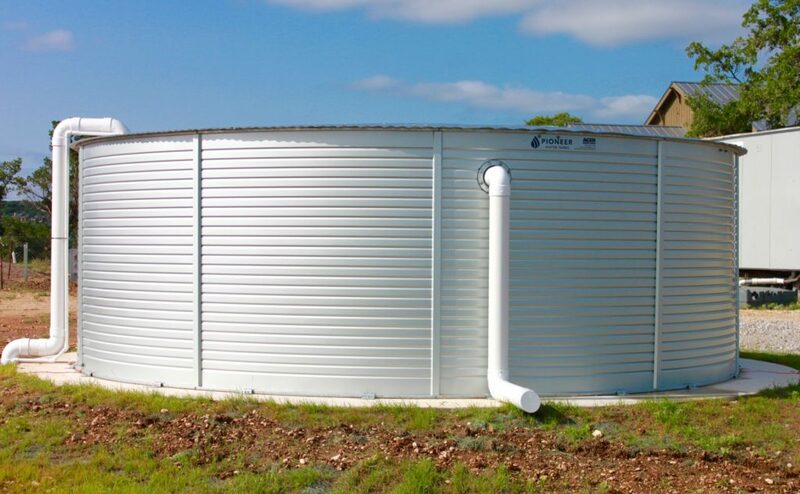 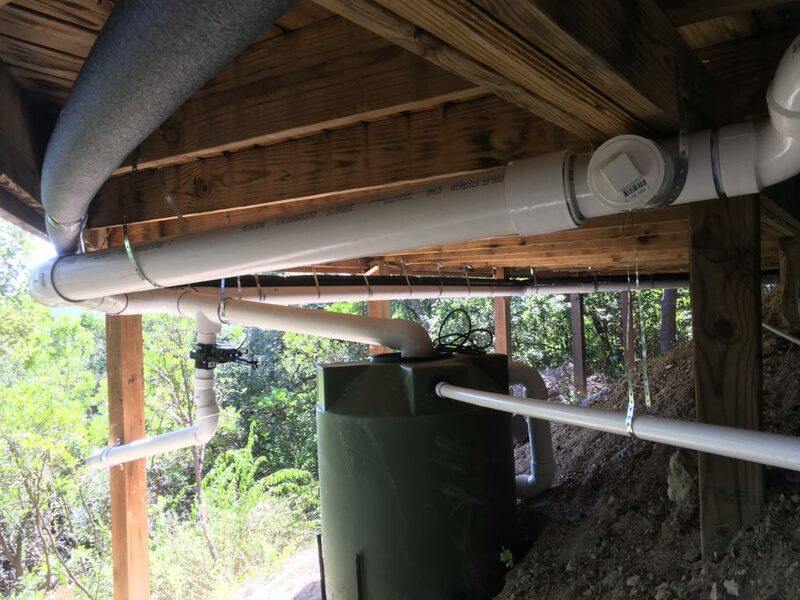 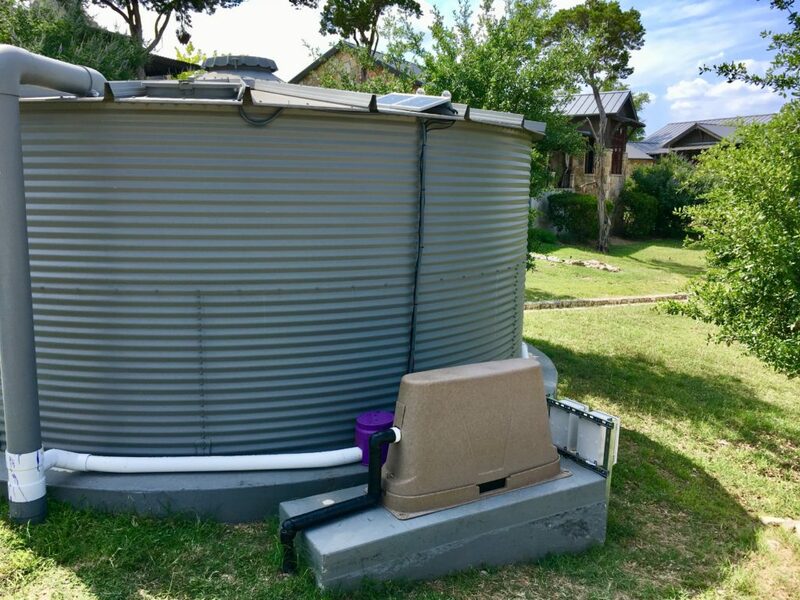 Prefiltration is very important when it comes to water quality, so using an external chamber to divert the water that washes the roof and conveyance before it is stored is not adequate for potable use. 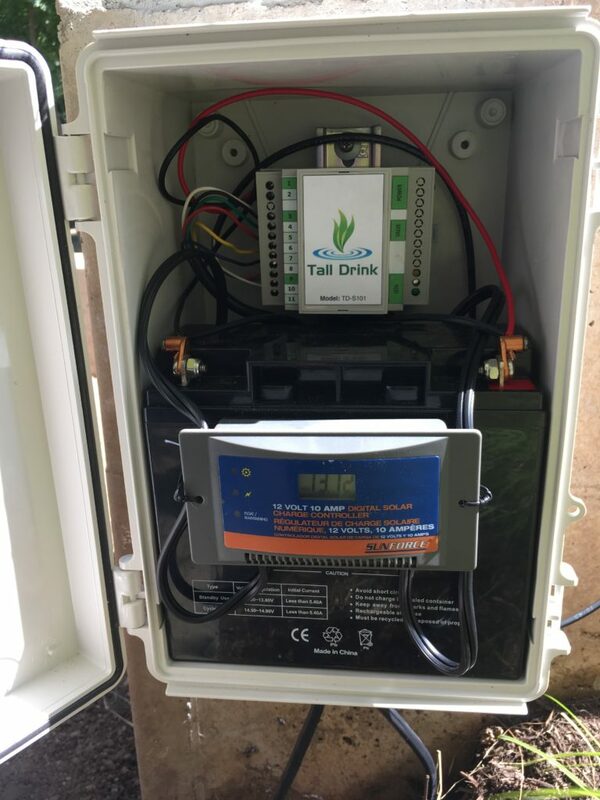 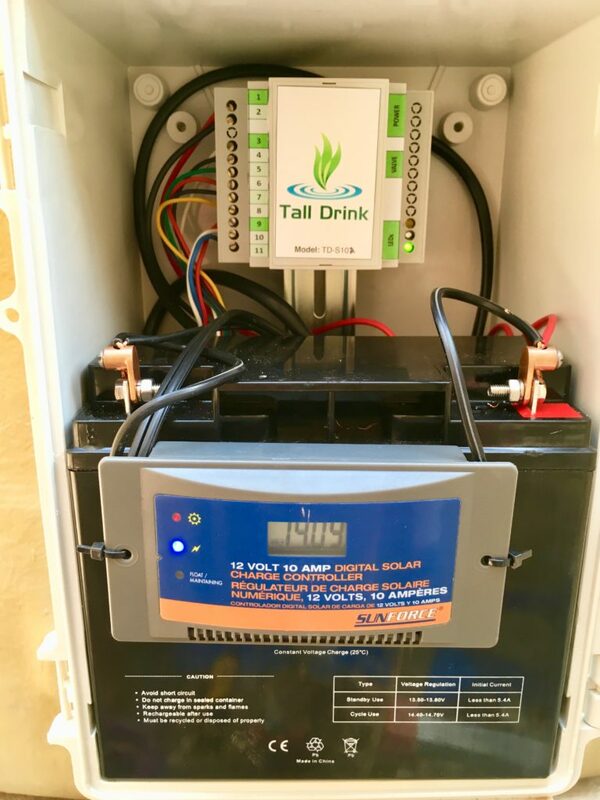 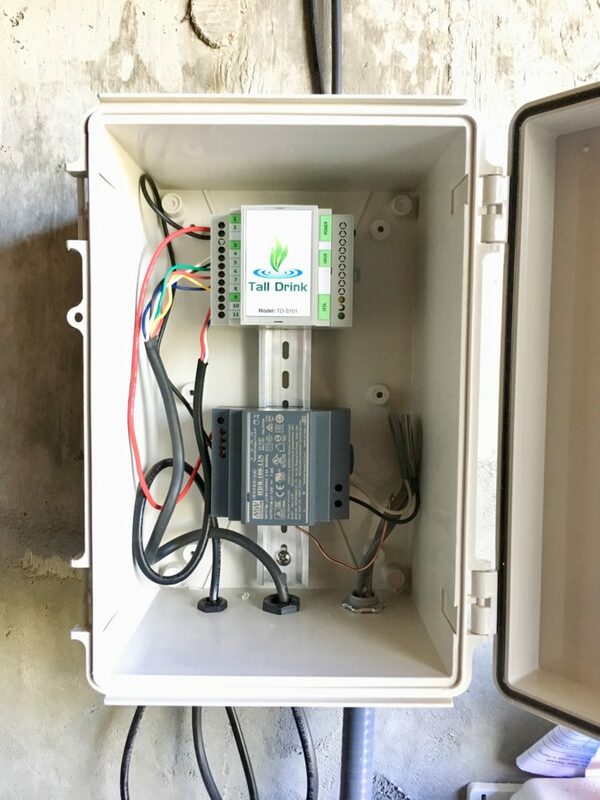 That's why Tall Drink uses an automatic "tankless first flush" diverter to ensure that the water is of the highest quality before it even enters the storage tank. 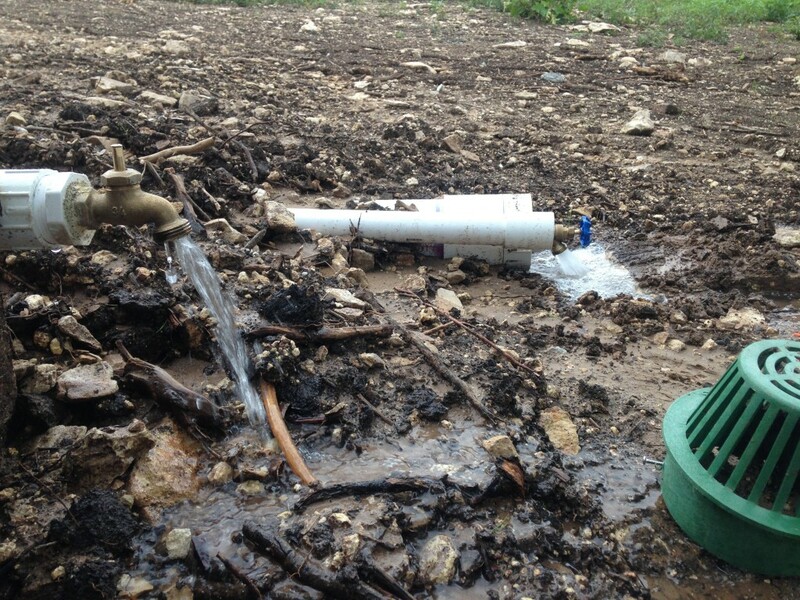 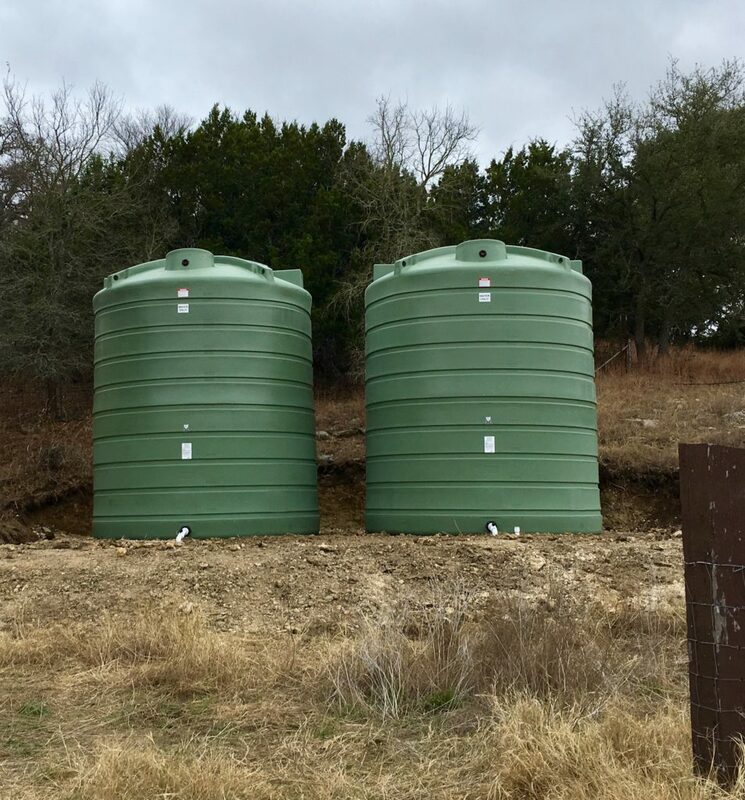 This also means no more unnecessary additional tanks or pipes to clutter the water storage area! 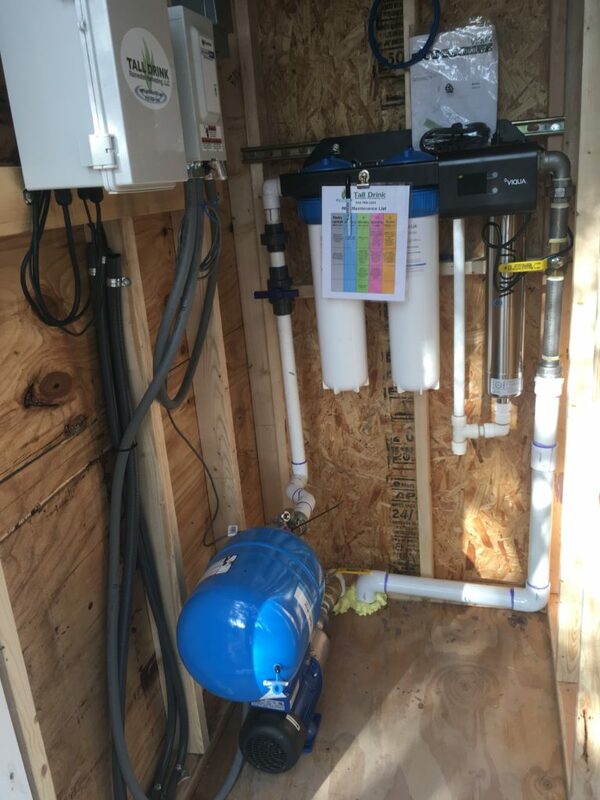 Ask us about our tankless first flush package. 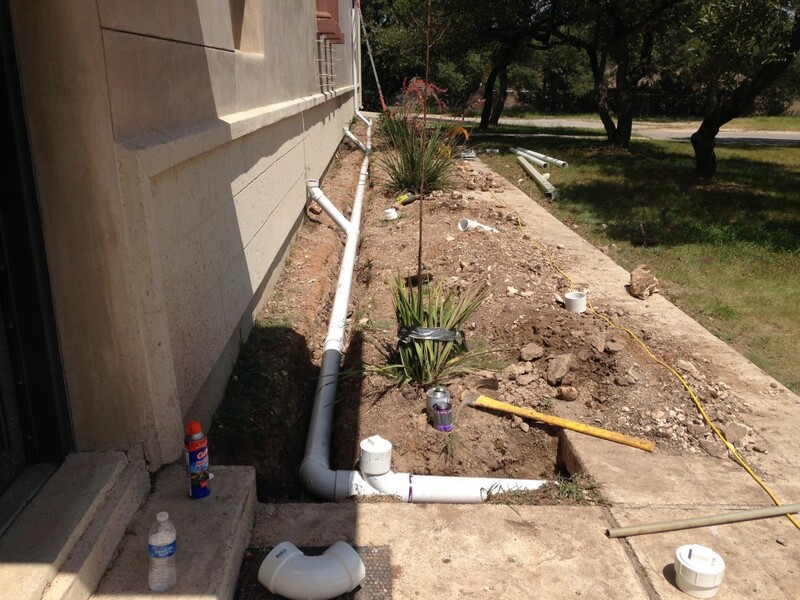 We love what we do and we're very proud of our work! 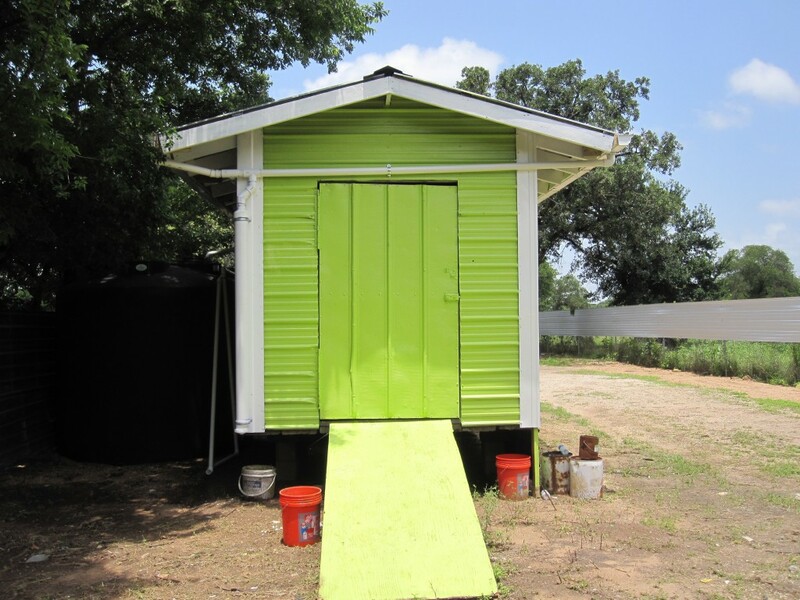 Please take a few moments to view some of our accomplishments. 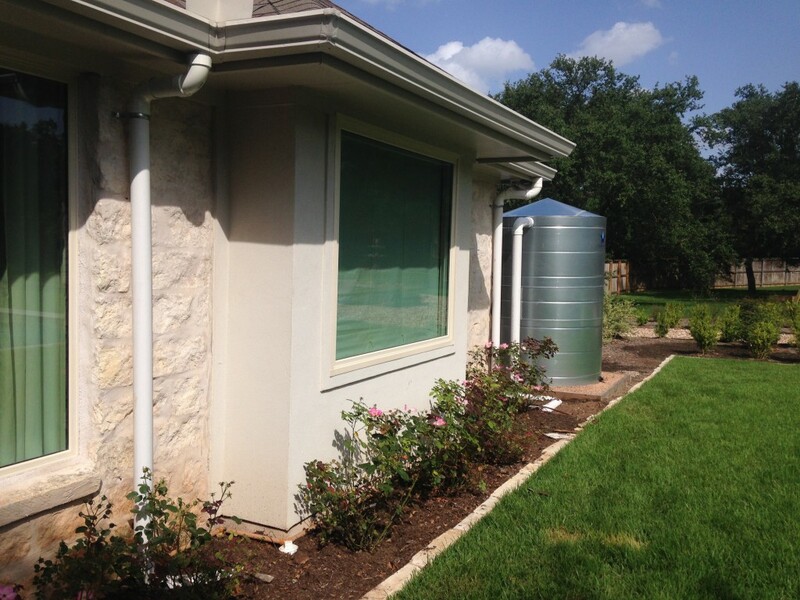 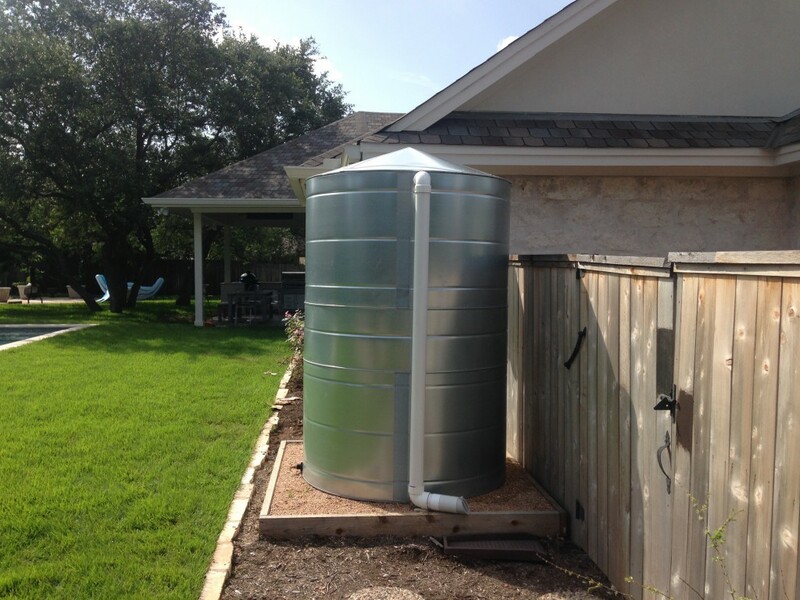 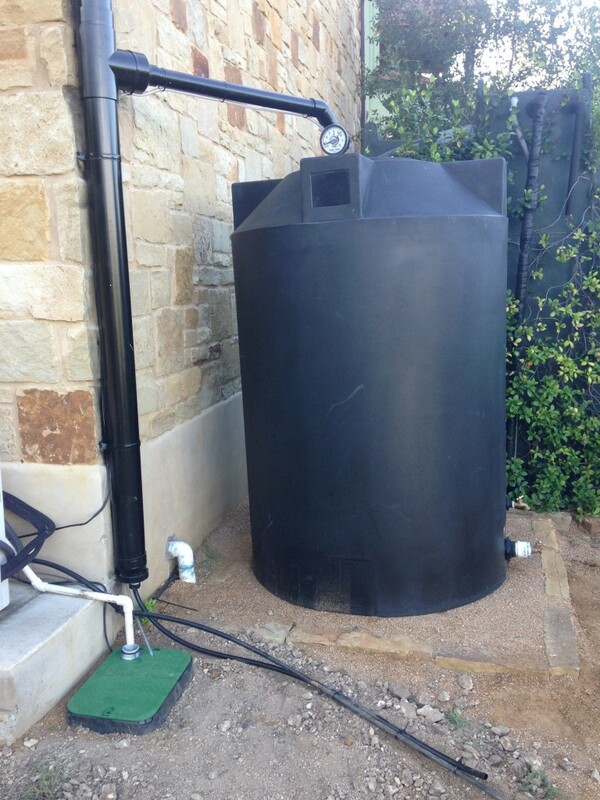 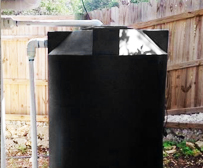 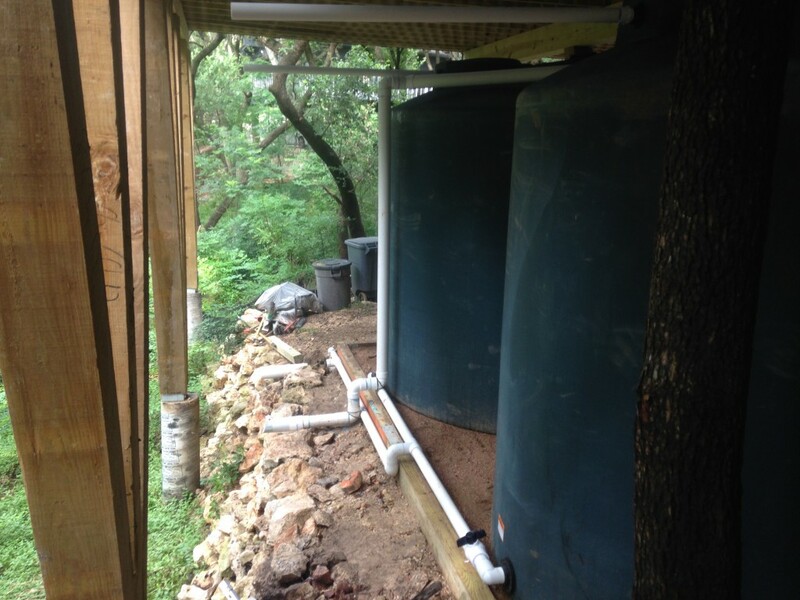 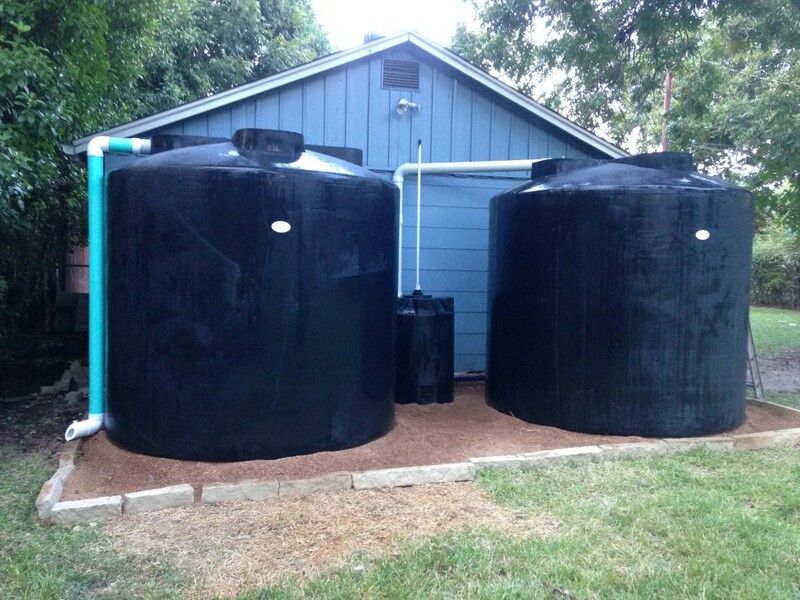 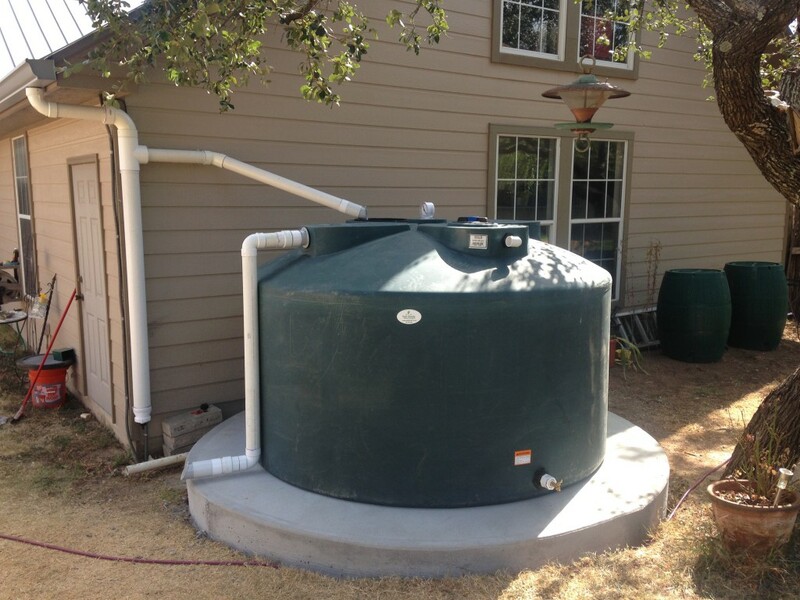 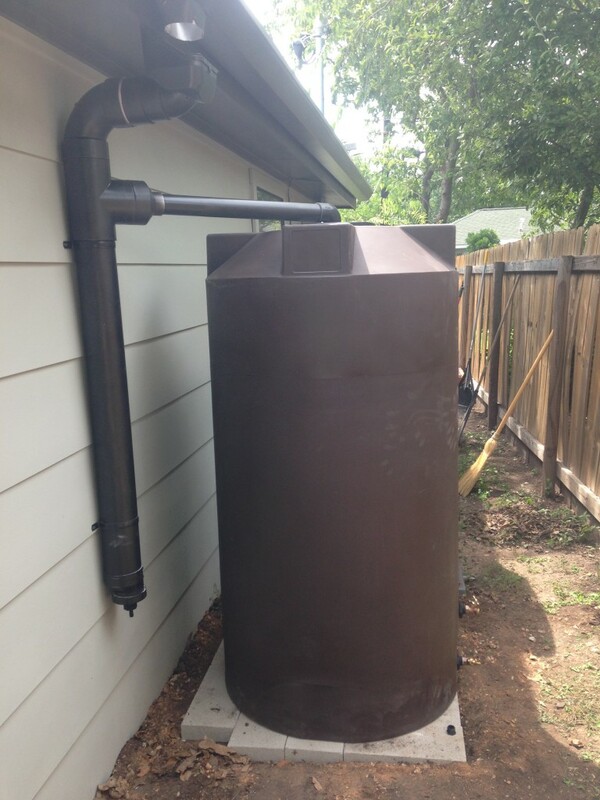 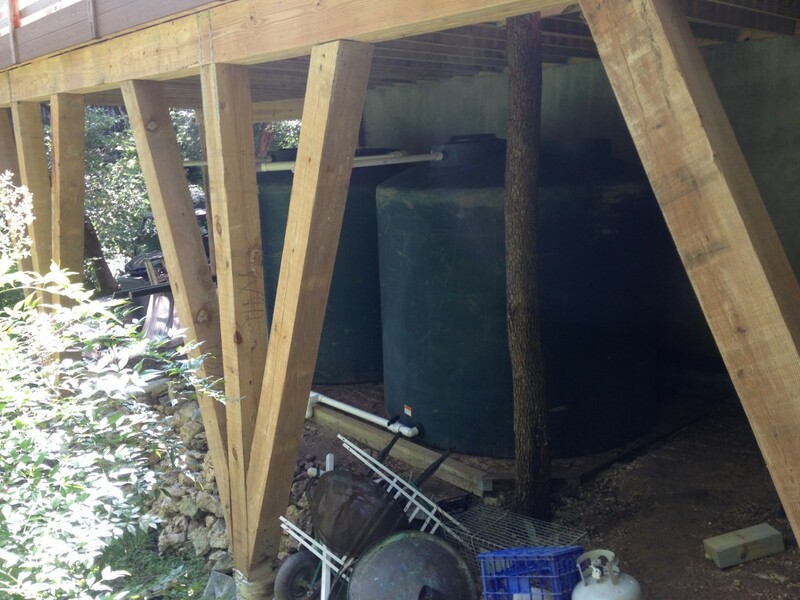 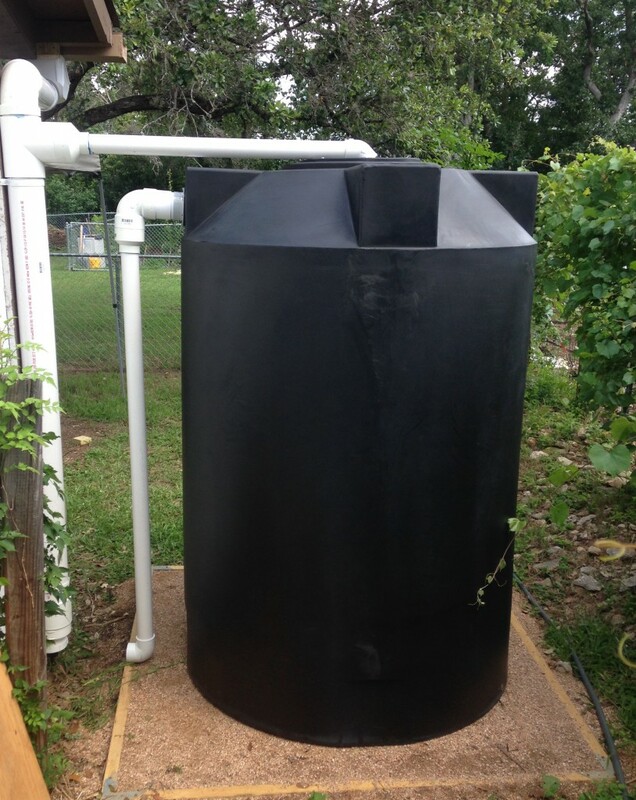 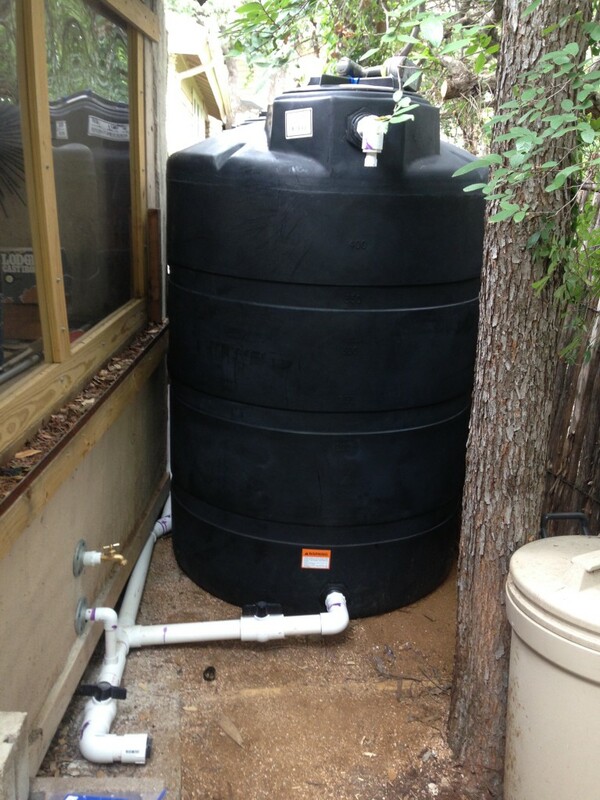 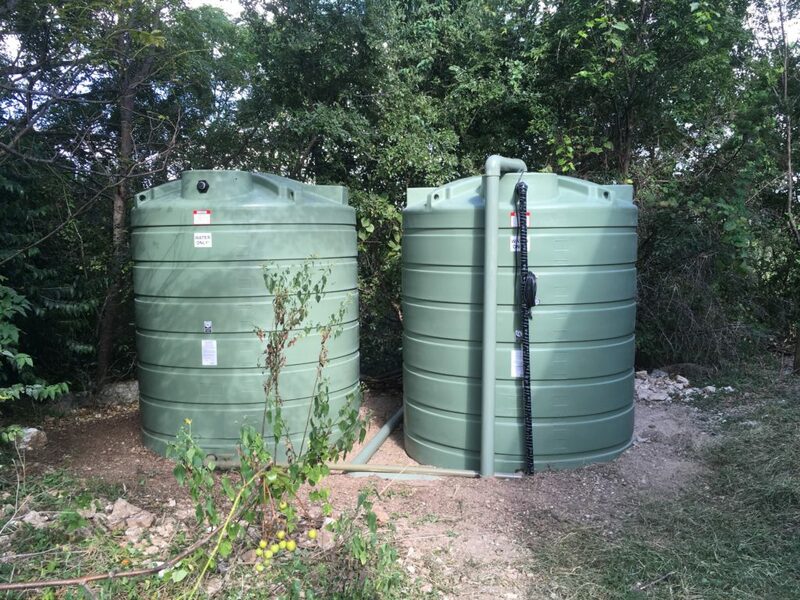 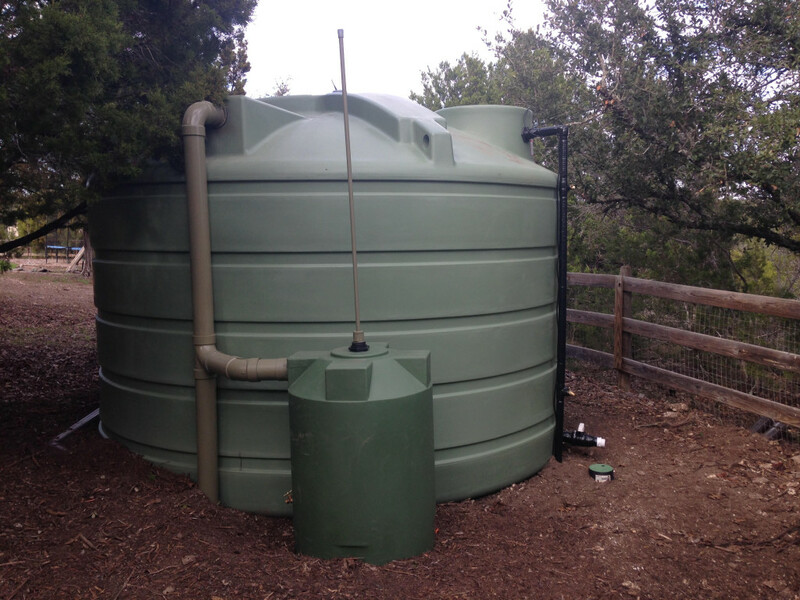 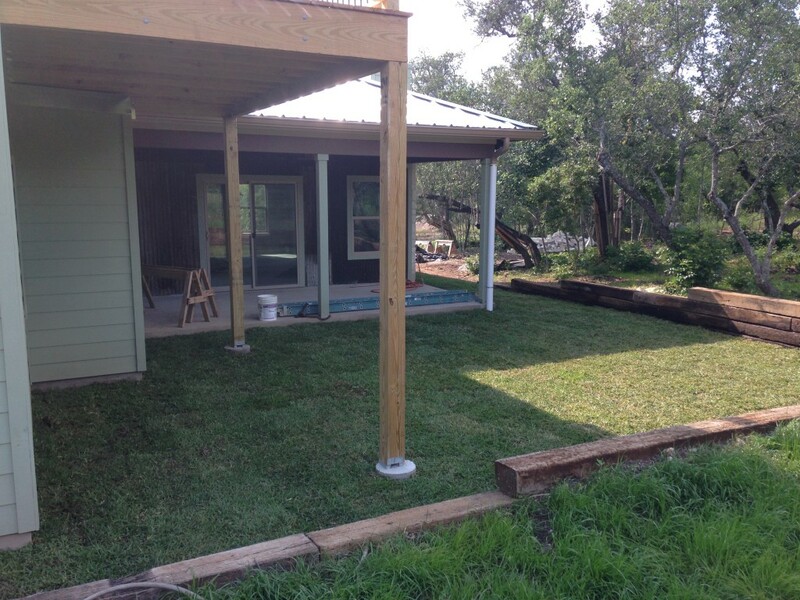 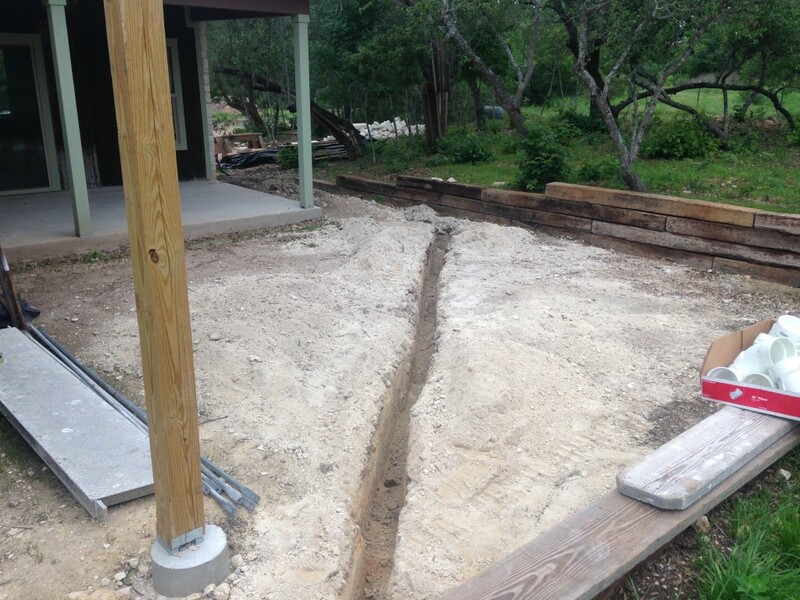 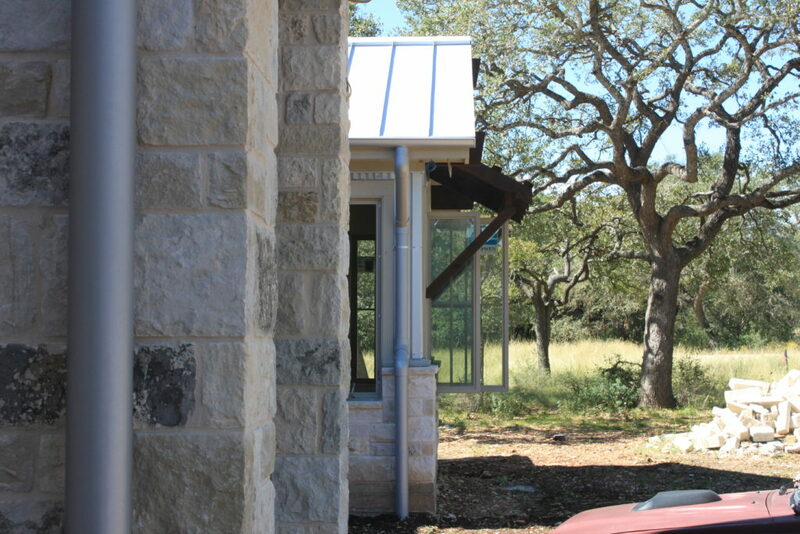 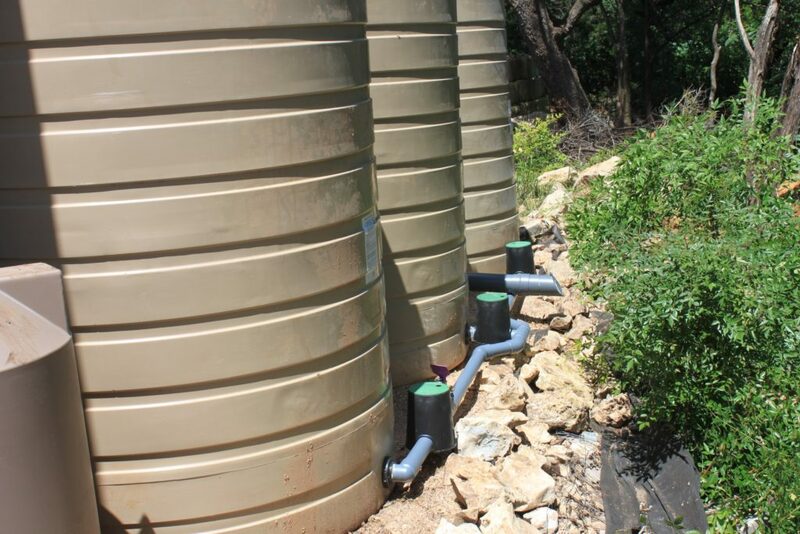 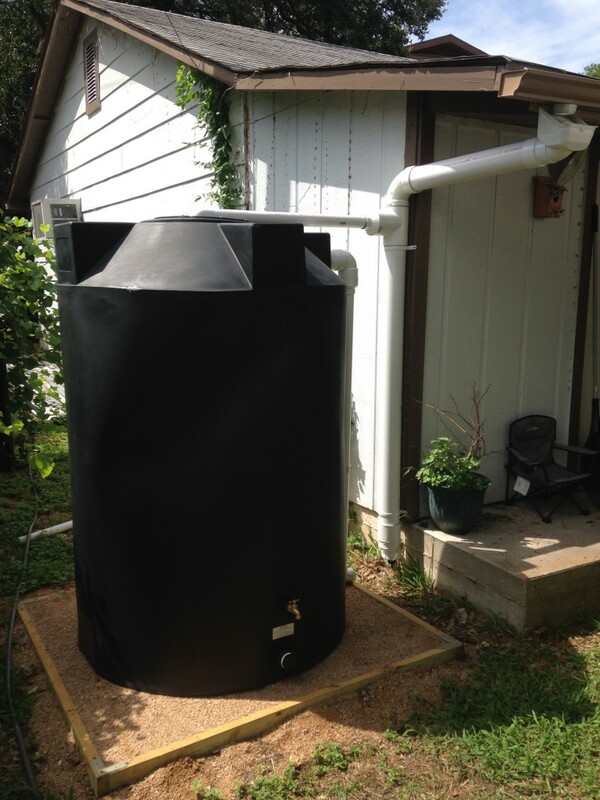 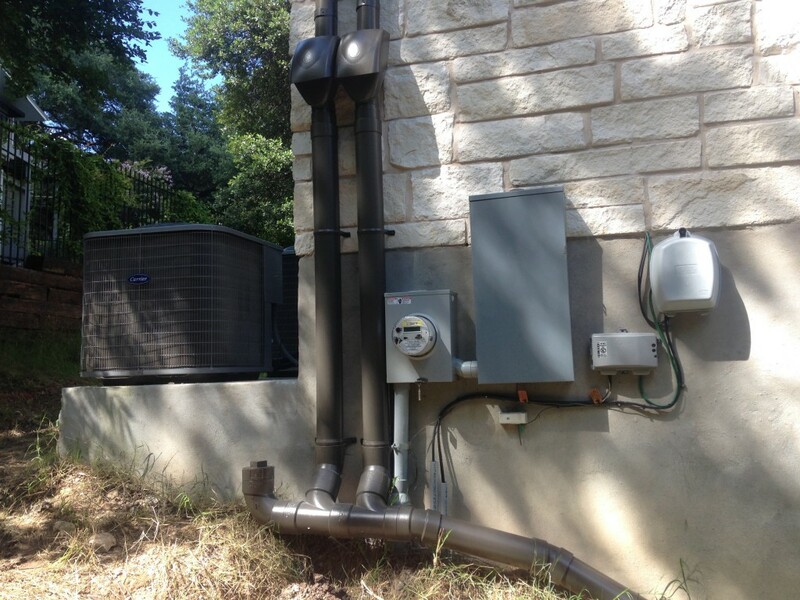 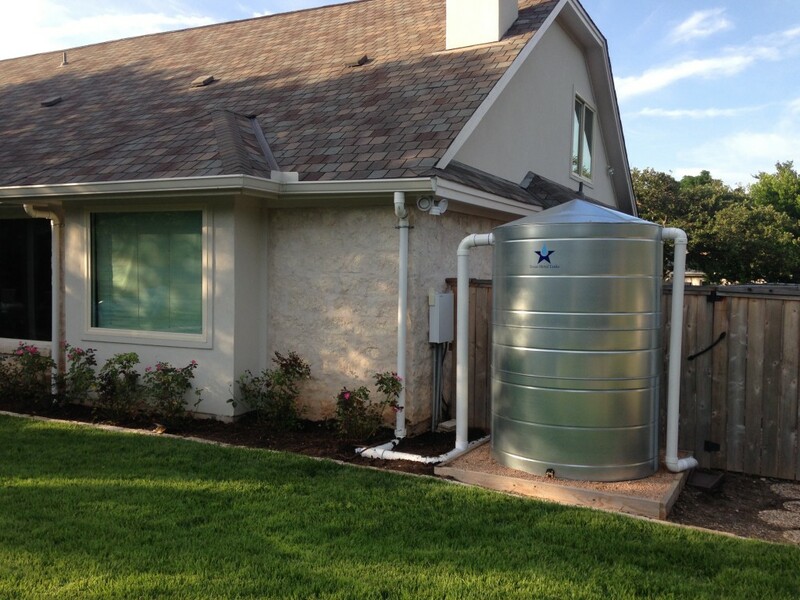 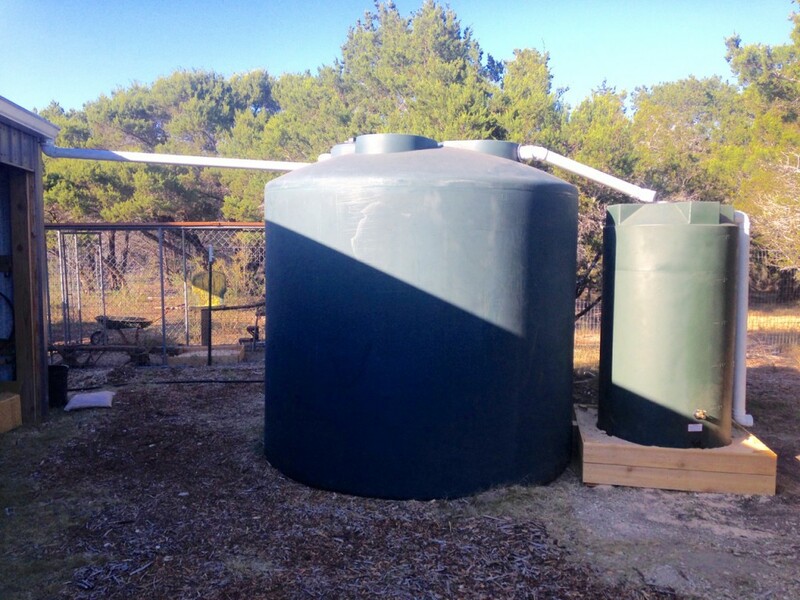 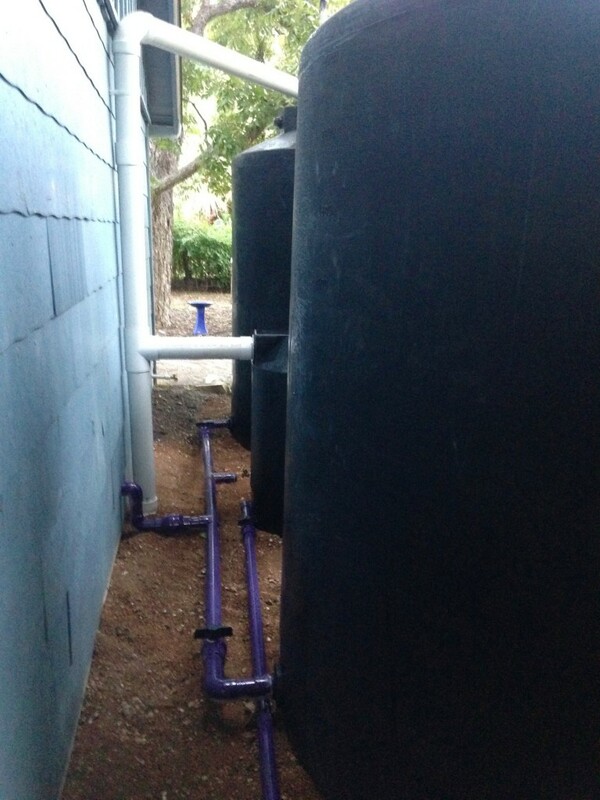 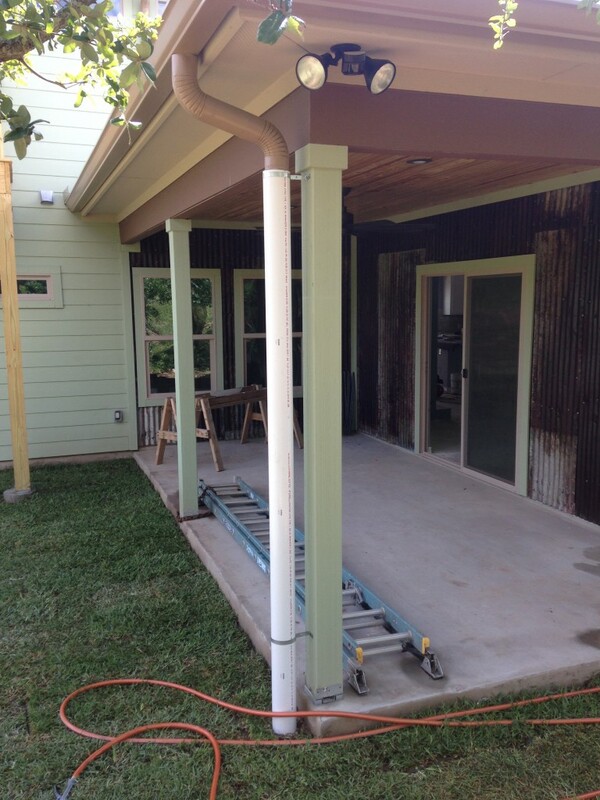 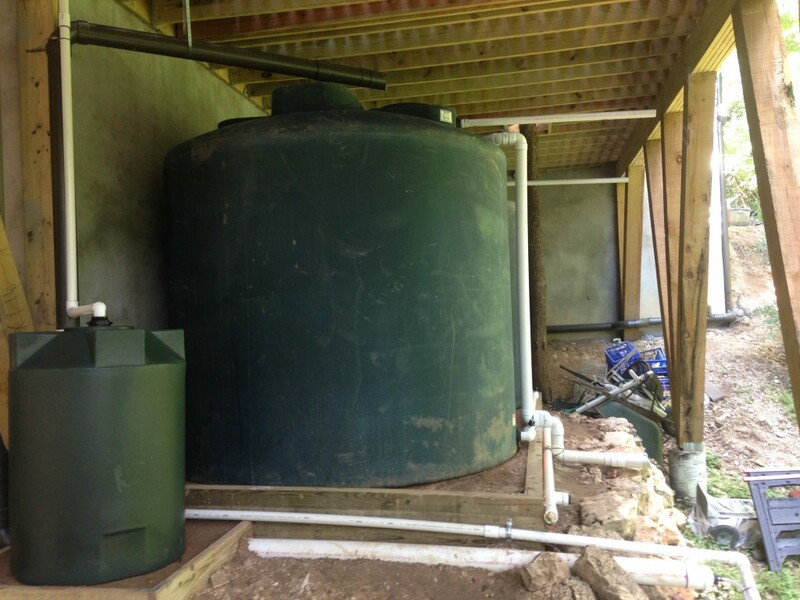 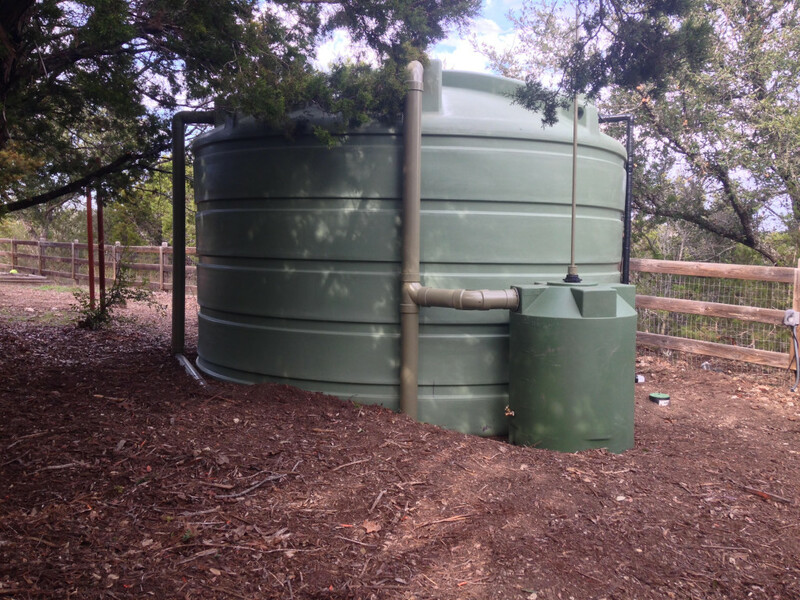 There are two types of conveyance systems used to collect rainwater. 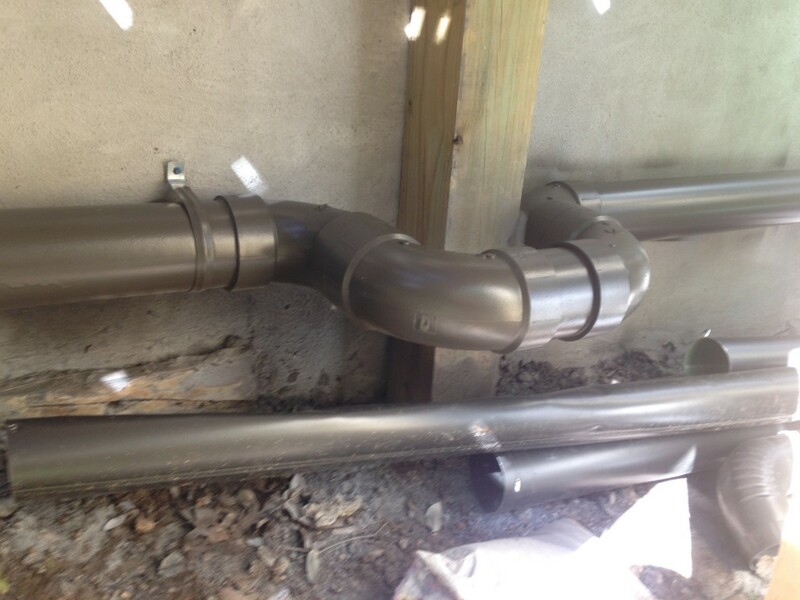 One is called a "dry" pipe system and the other is called a "wet" pipe system. 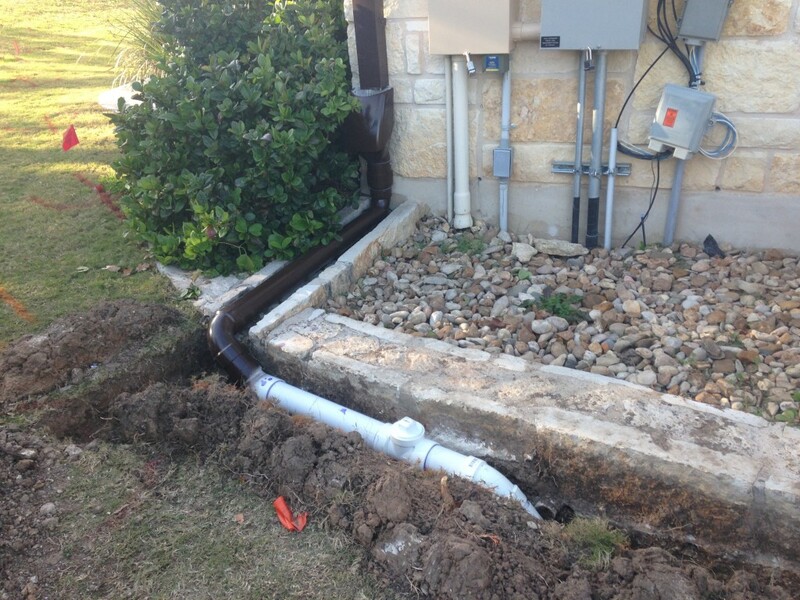 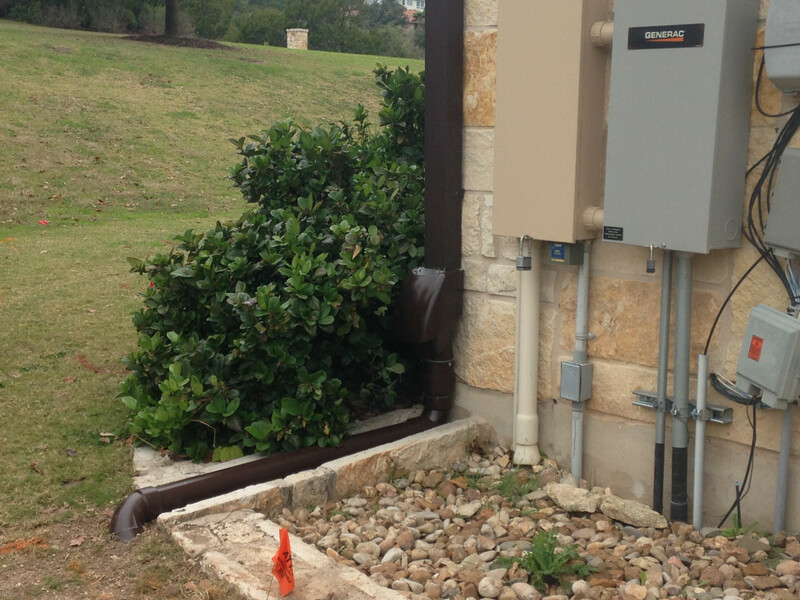 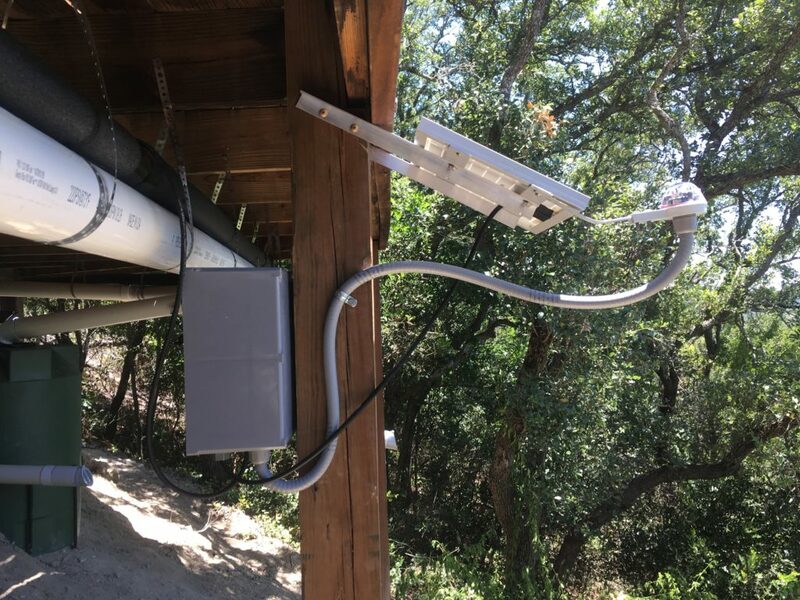 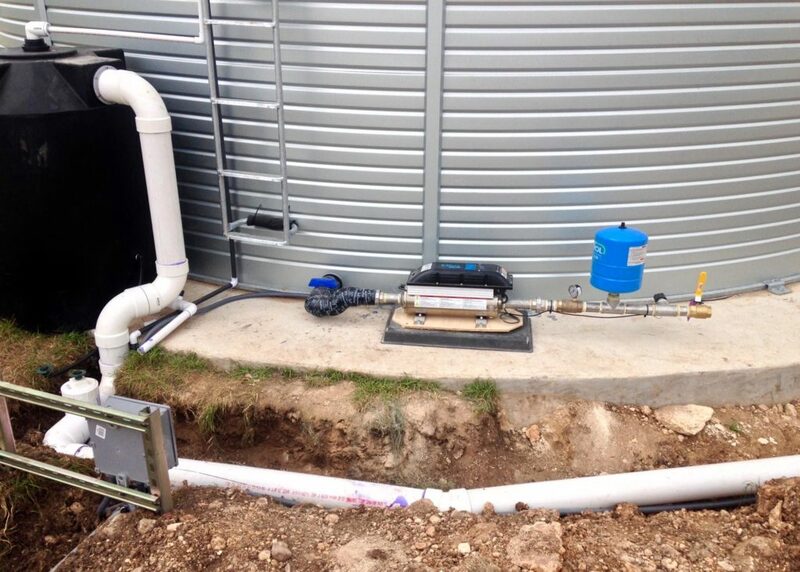 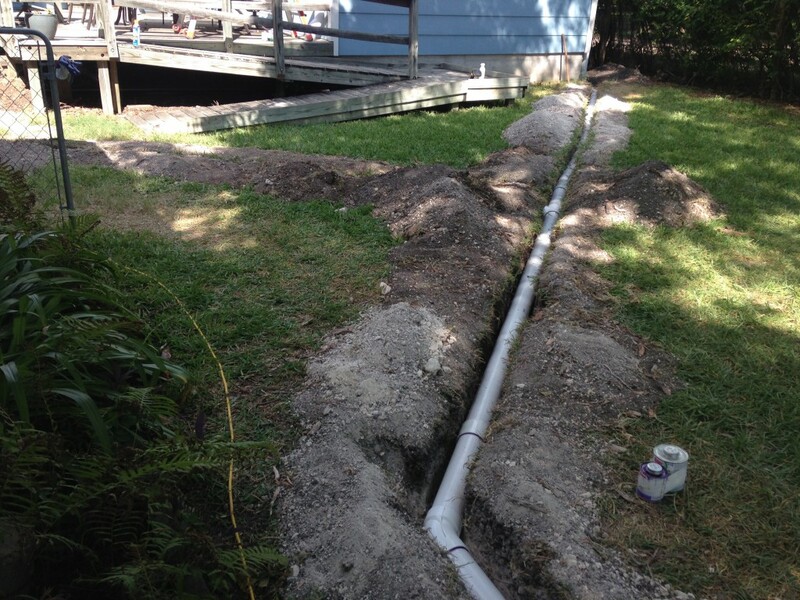 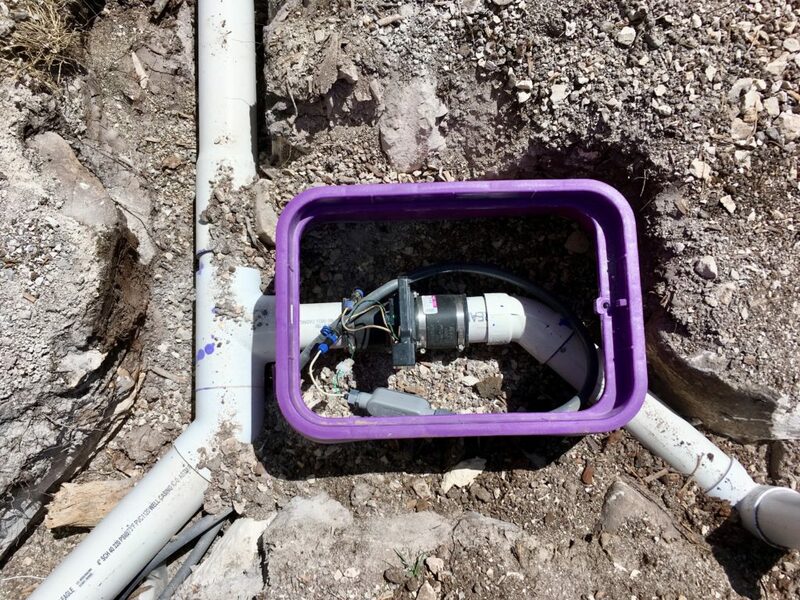 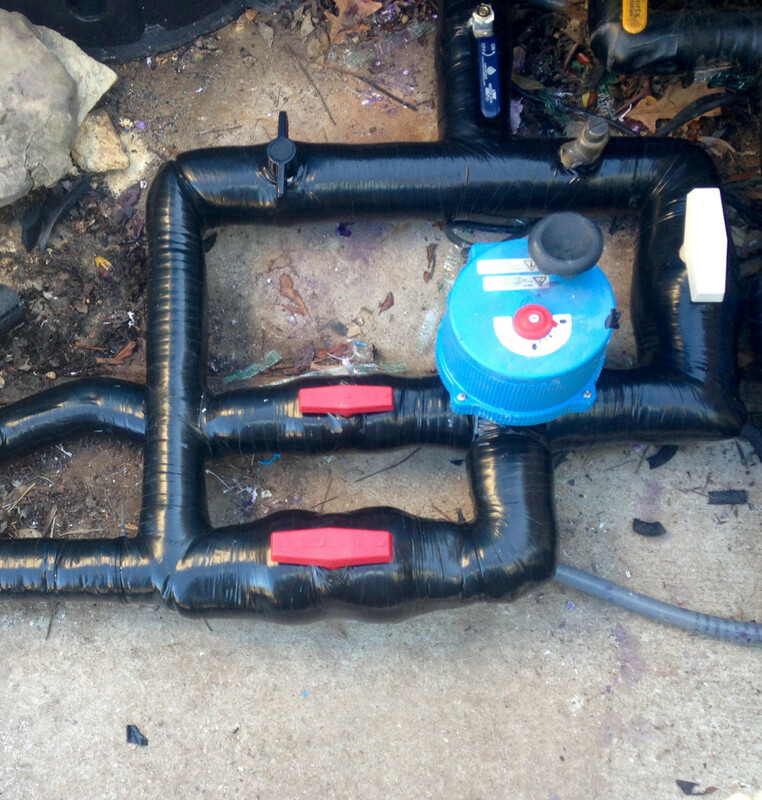 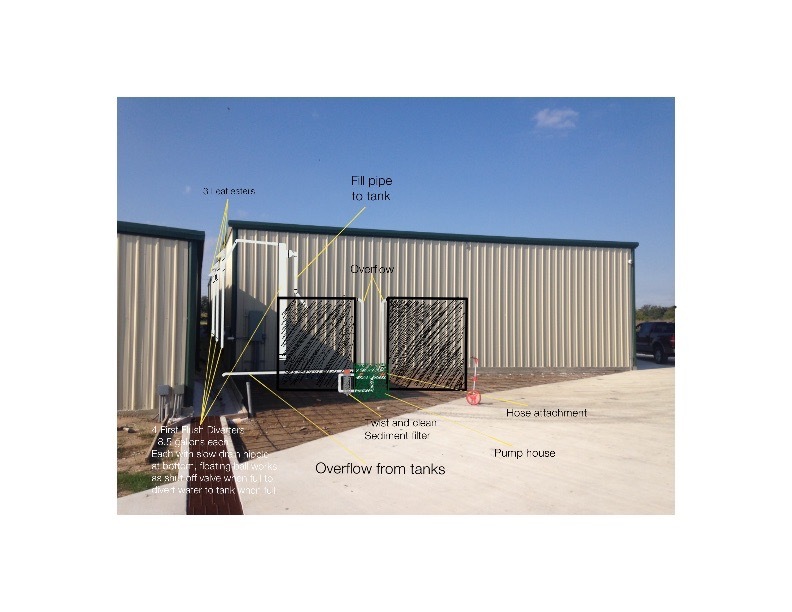 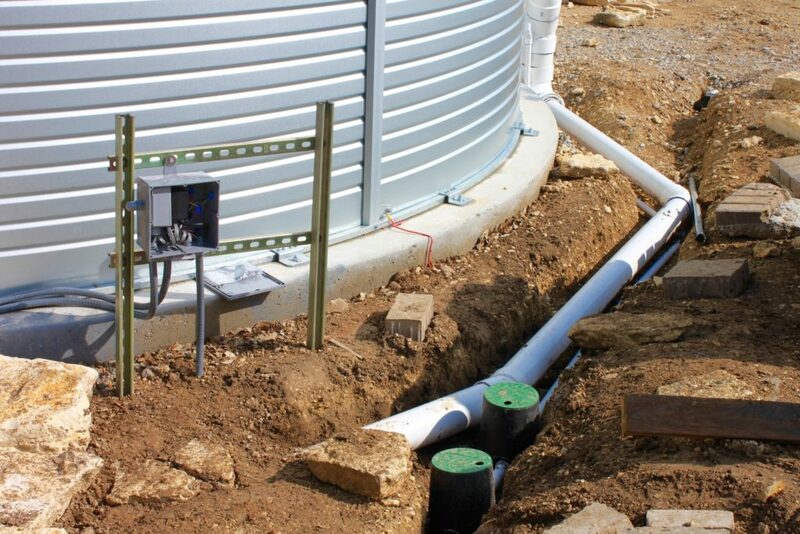 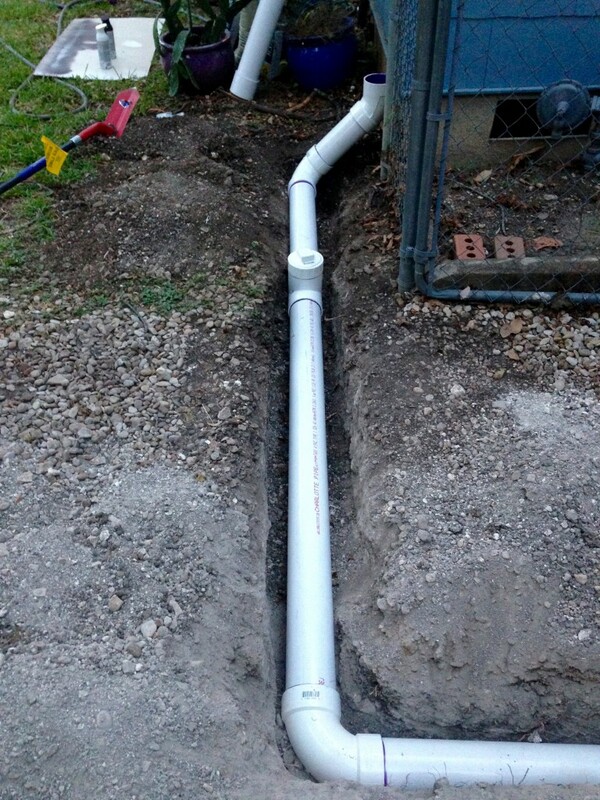 The dry pipe conveyance system is a simple system used when the downspout(s) are close in proximity to the tanks. 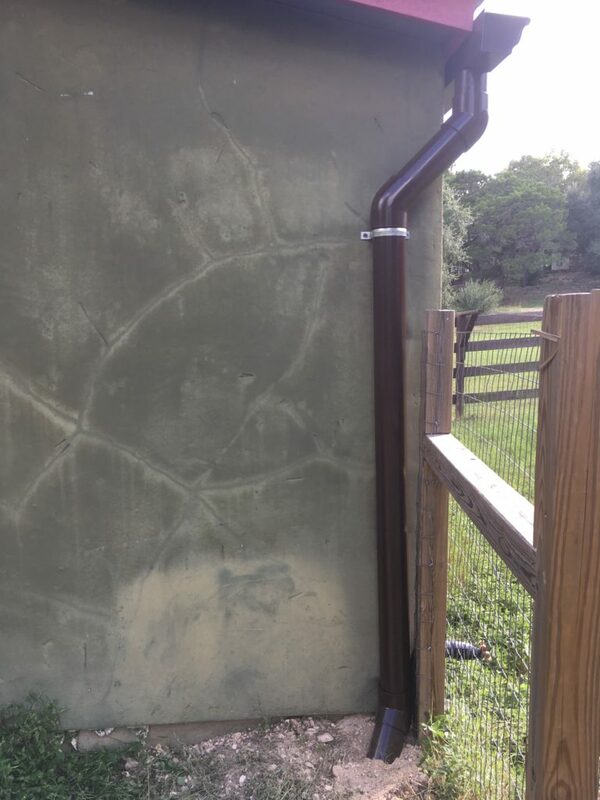 They are called "dry" because there is never any water in these pipes when it's not raining. 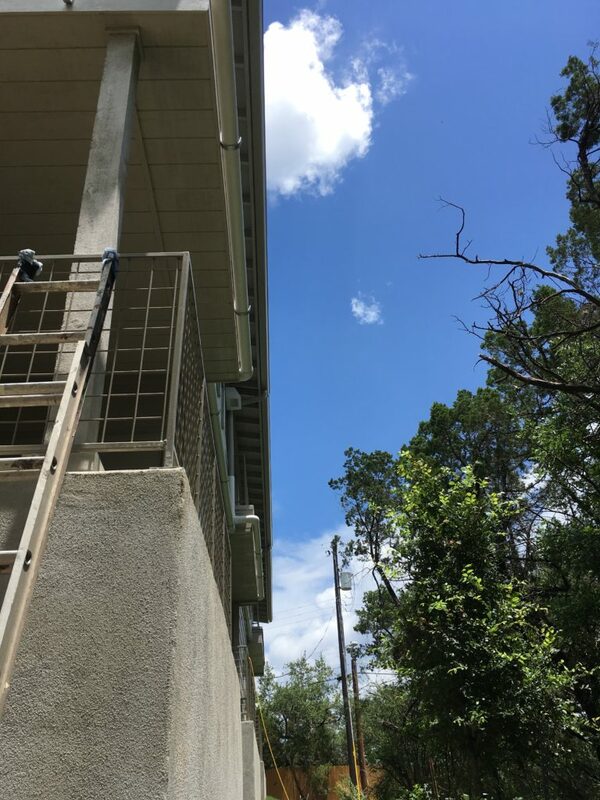 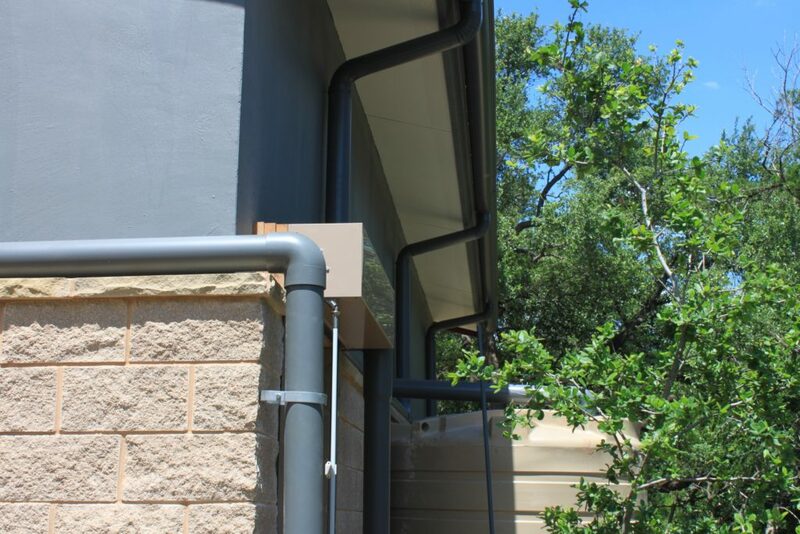 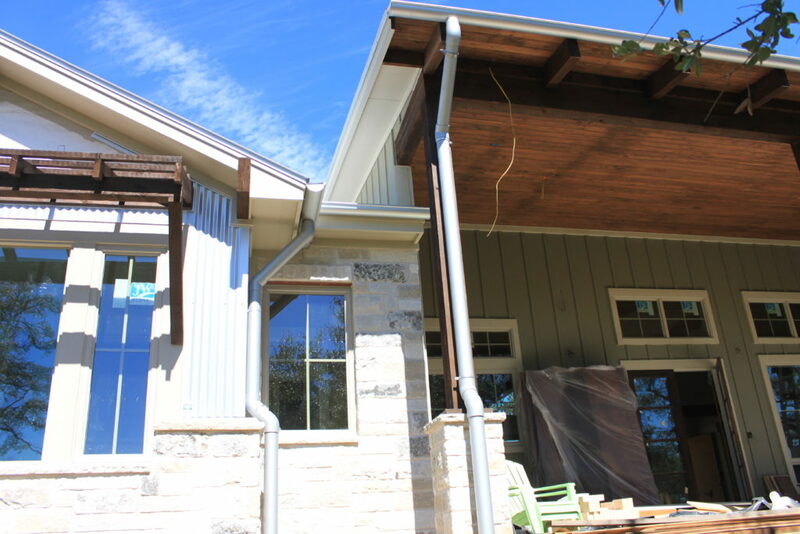 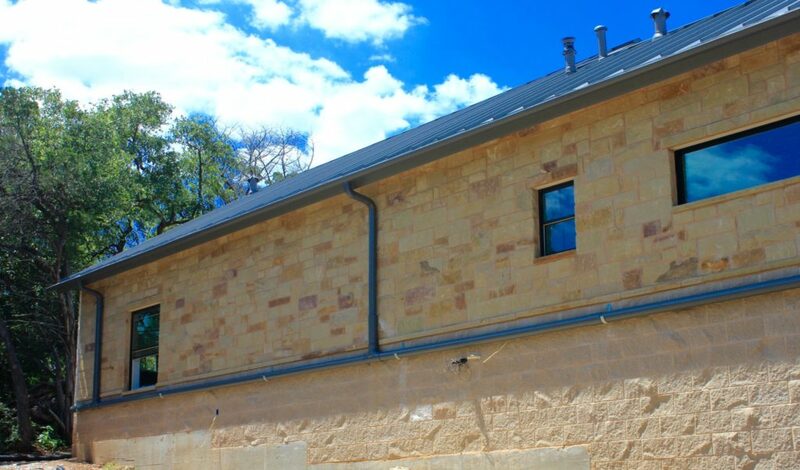 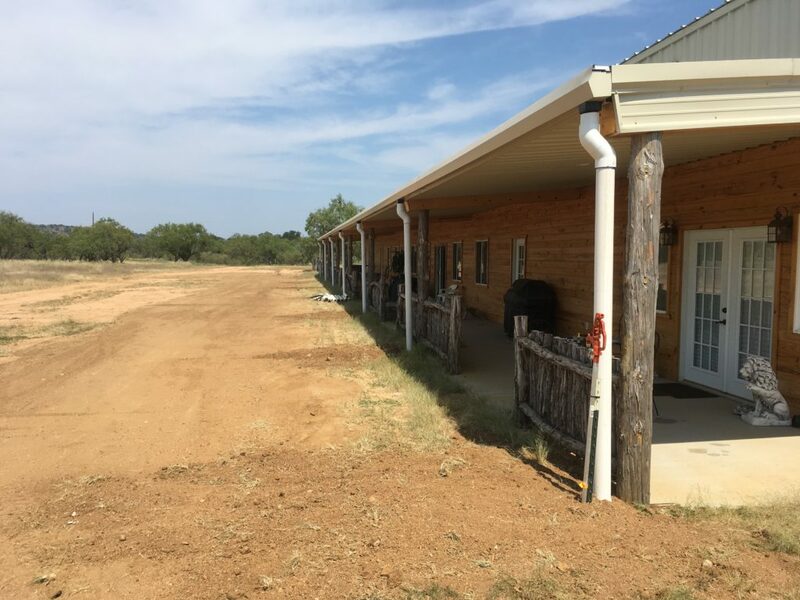 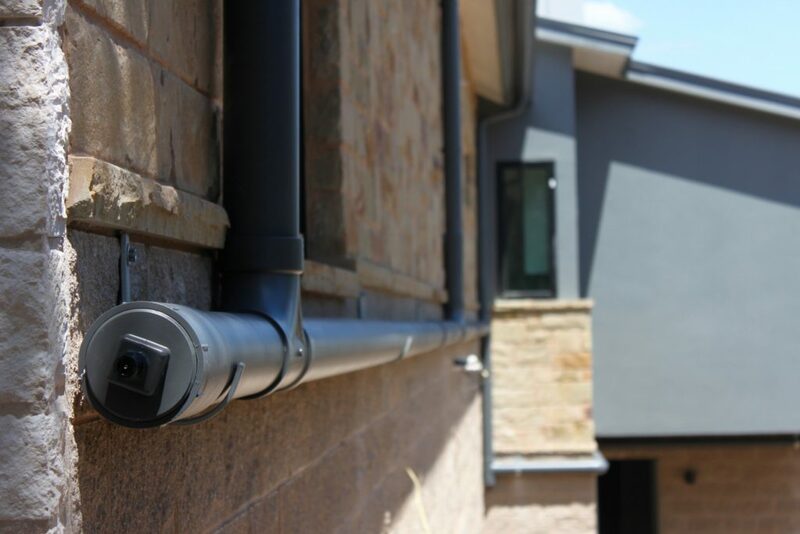 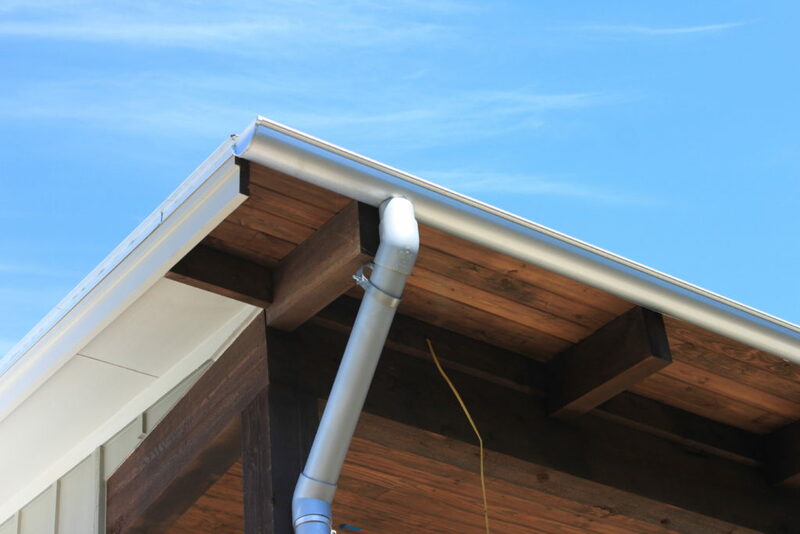 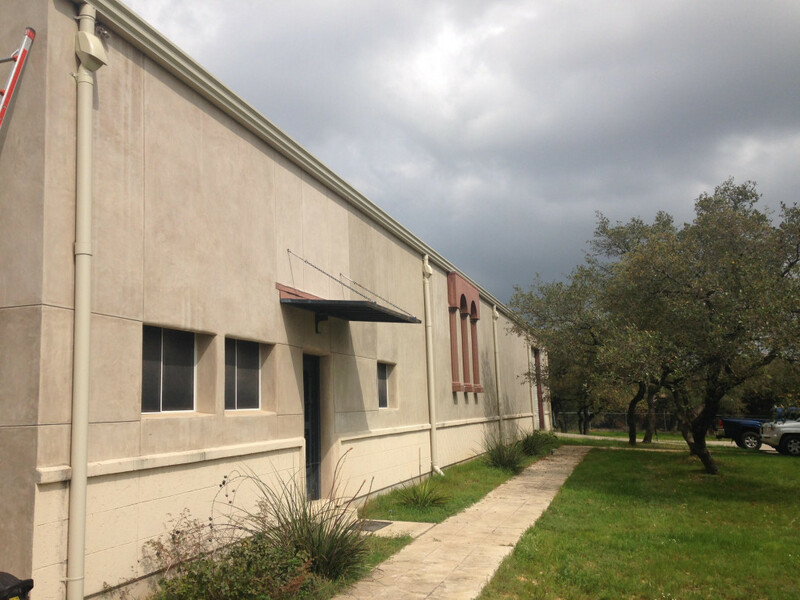 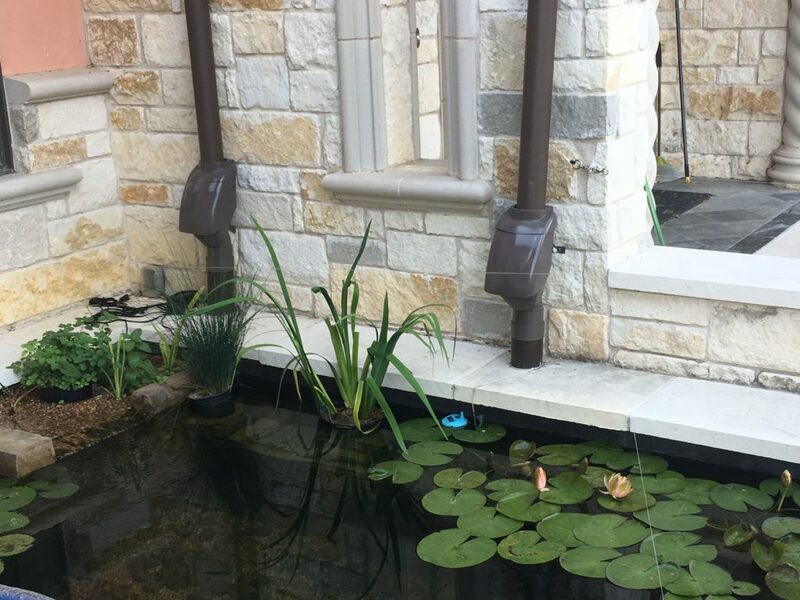 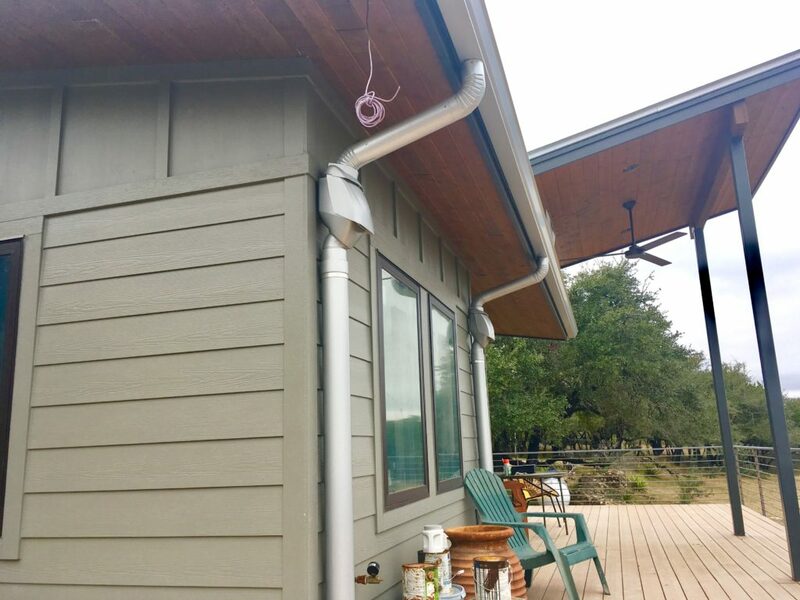 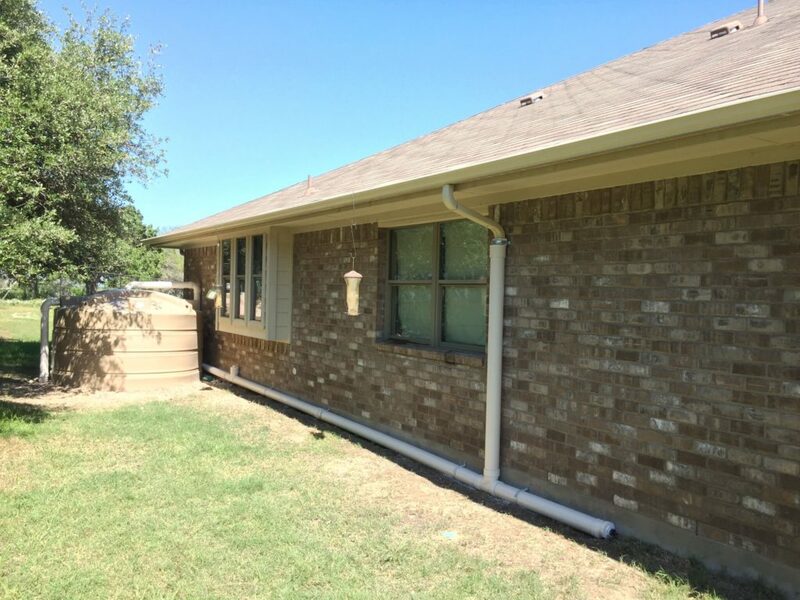 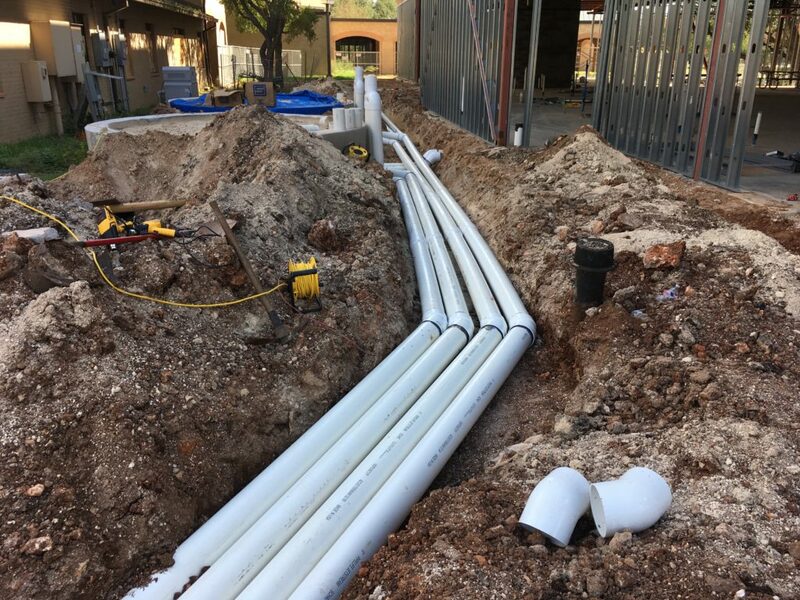 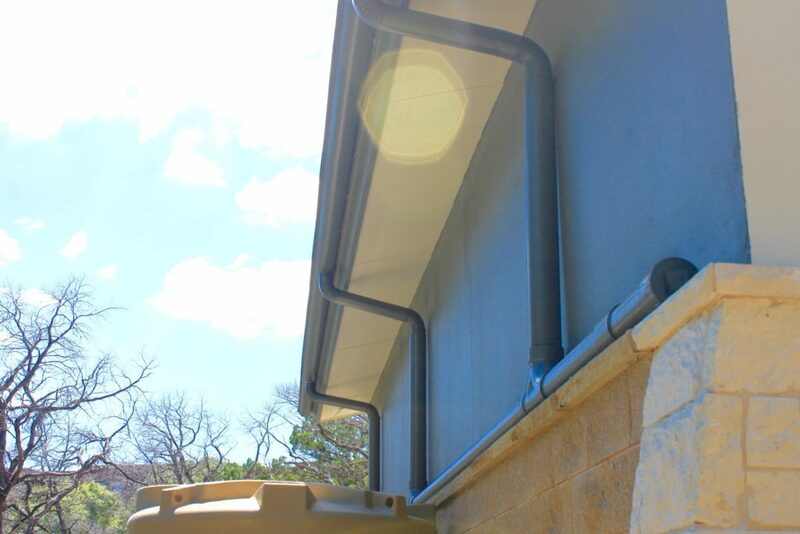 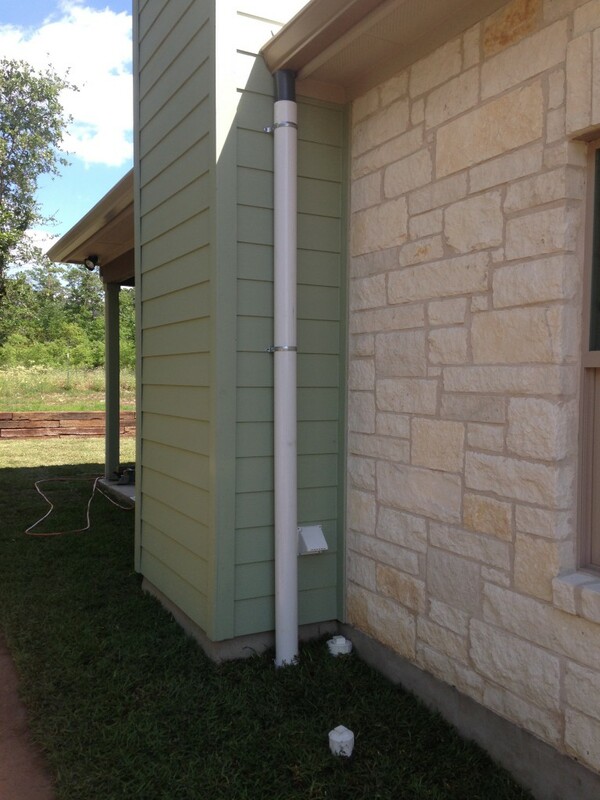 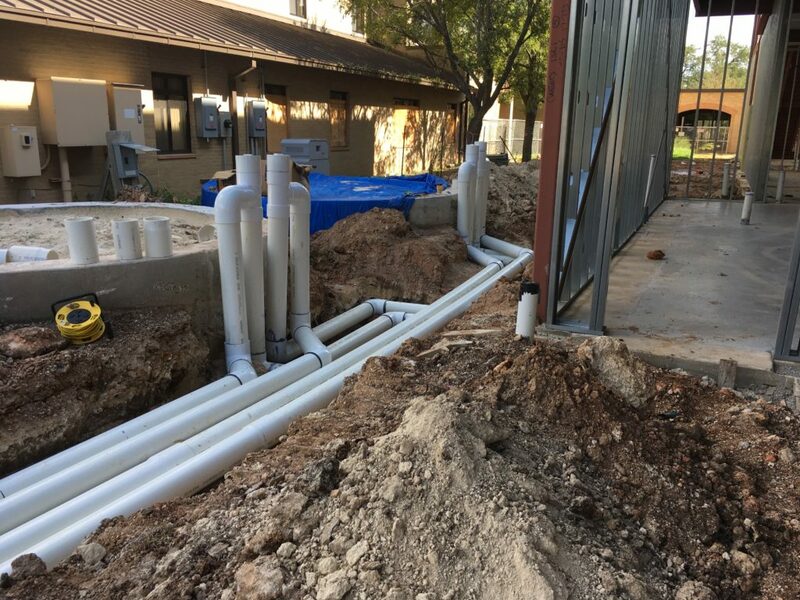 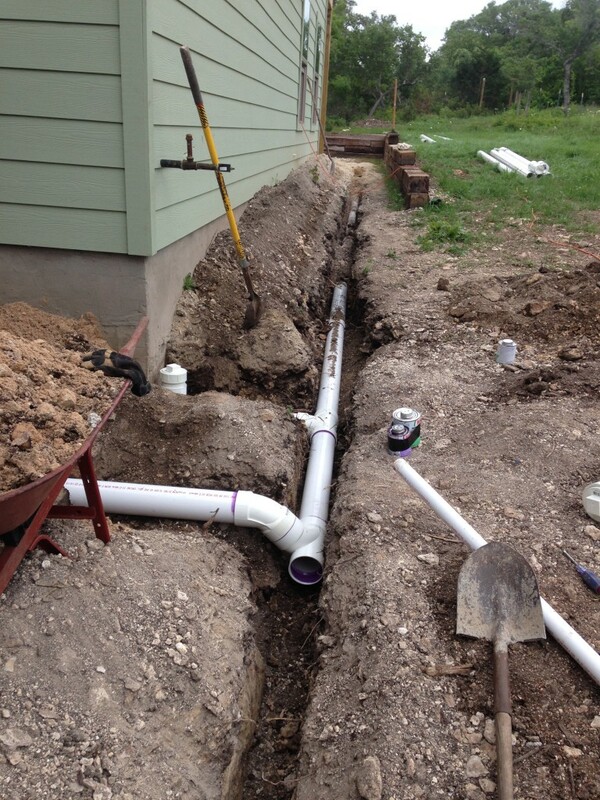 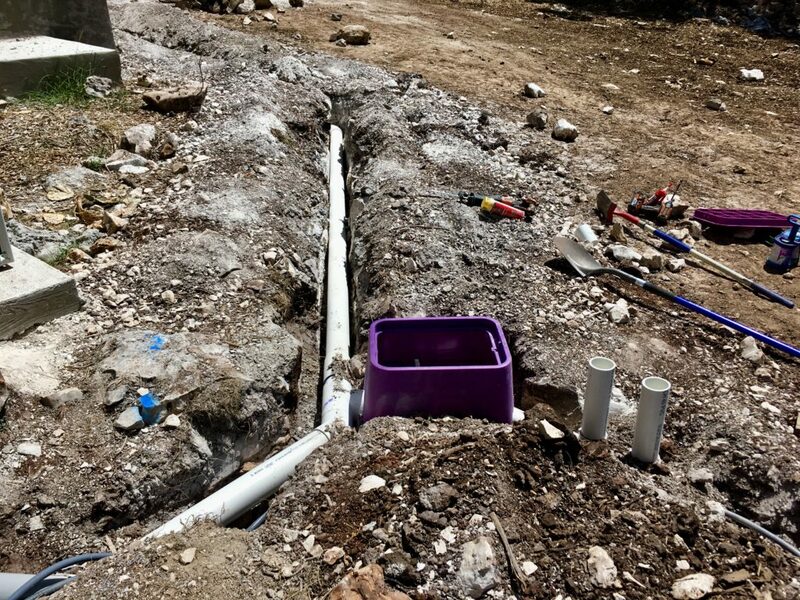 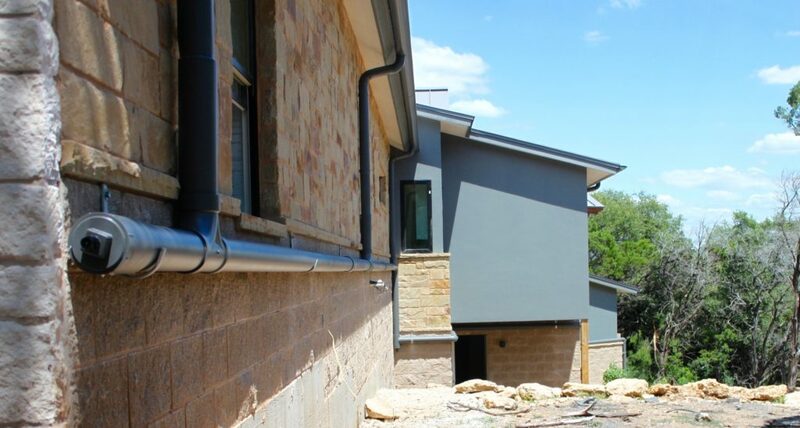 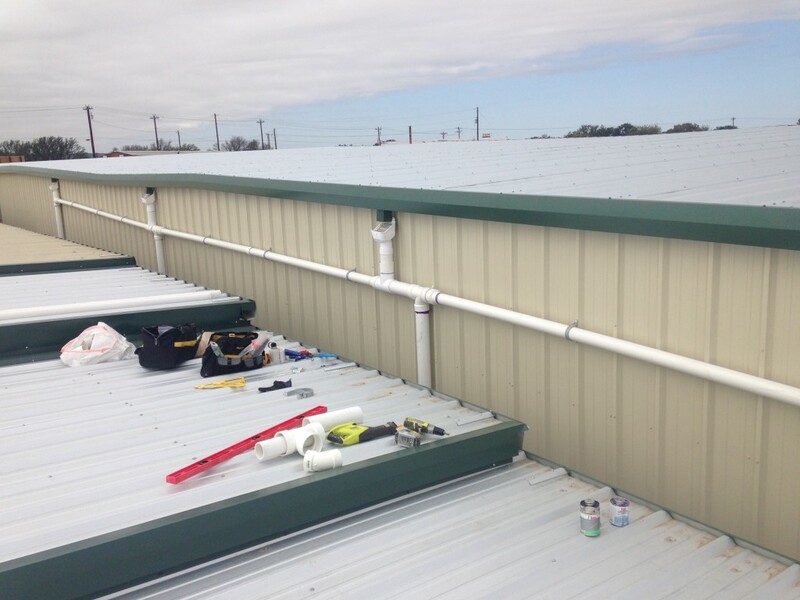 The "wet" pipe system is common with systems using multiple downspouts at various locations around the roof where the water is being collected. 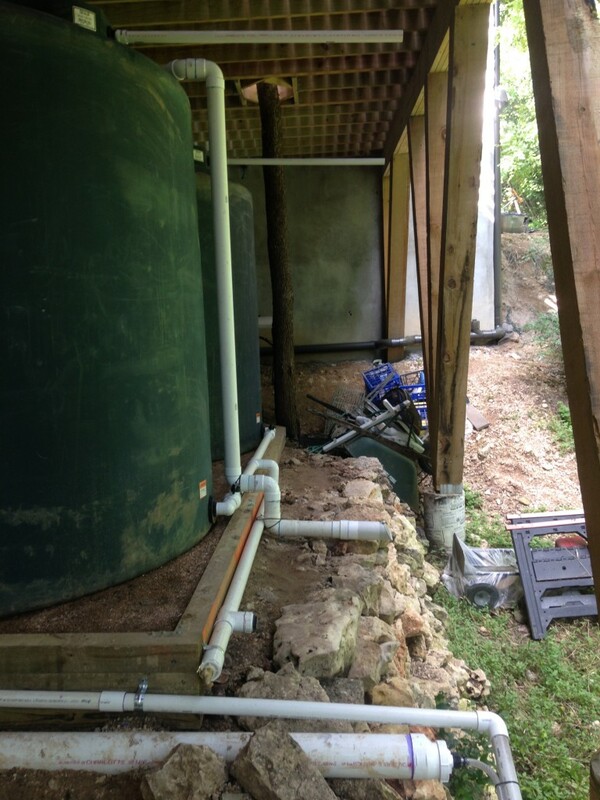 The pipes comprising the wet system usually run straight down from the downspouts to the ground and over to where they fill the storage tank. 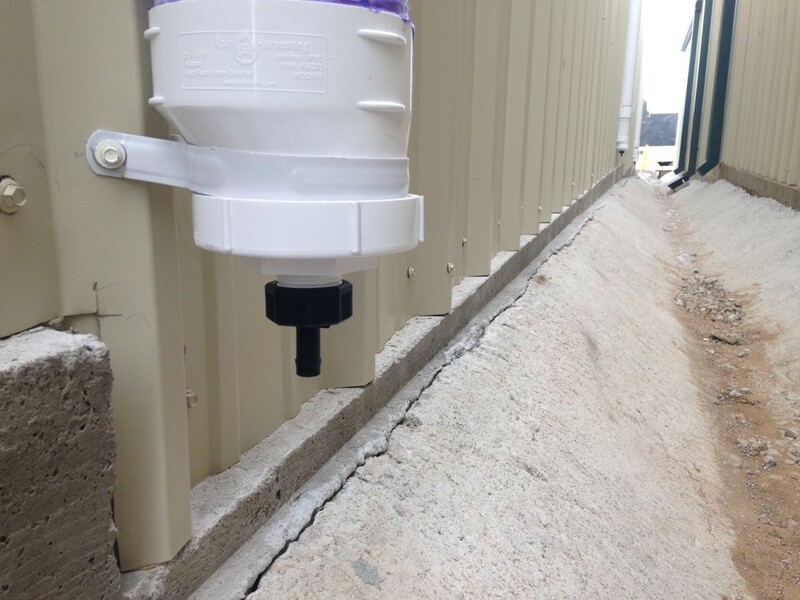 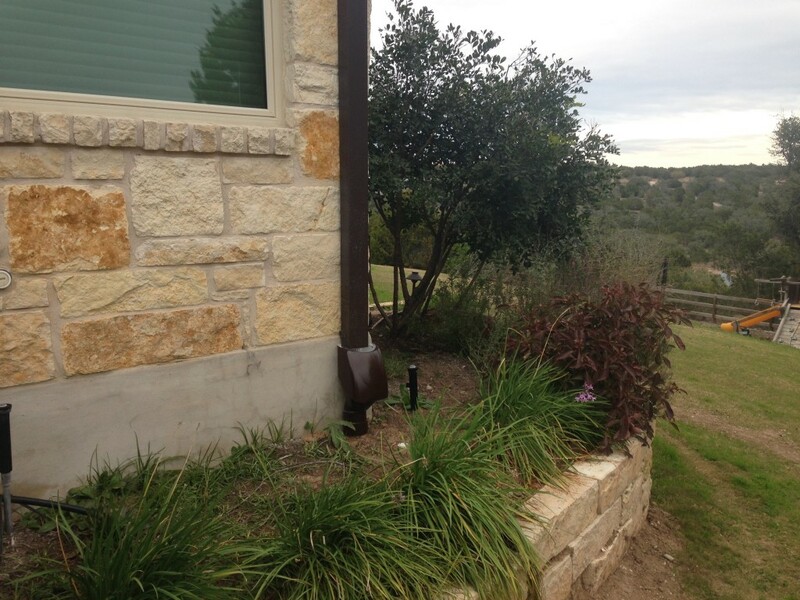 This allows for one location of water storage instead of one at each downspout location. 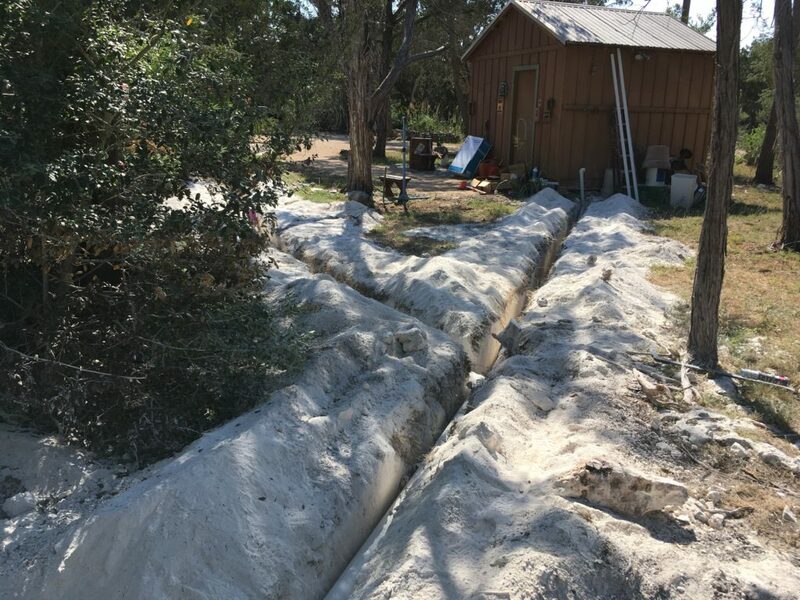 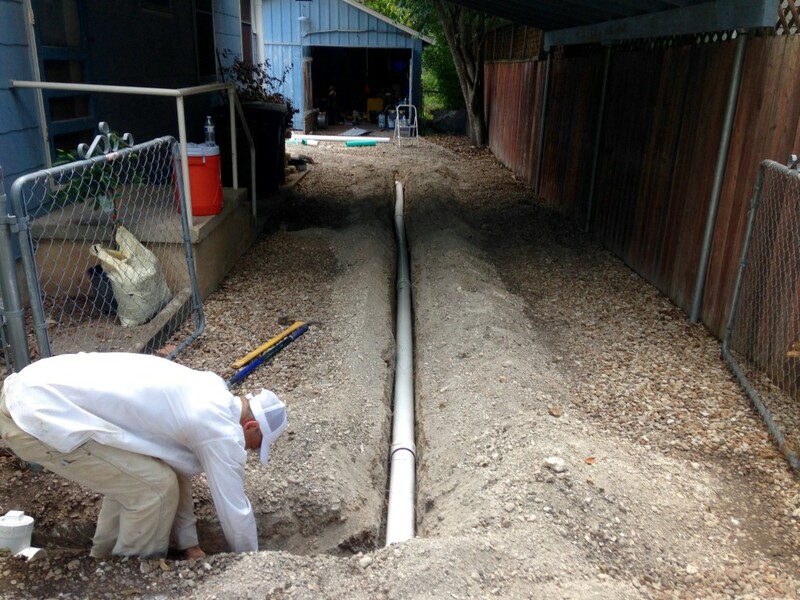 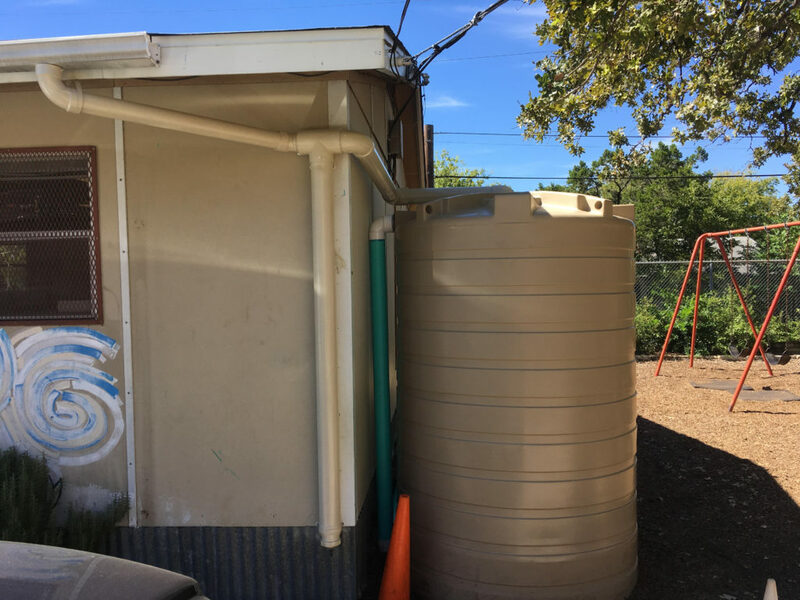 It is called a "wet" system because the pipes retain water between rains, however, we usually add a slow drain at the lowest point of the conveyance system to evacuate the standing water. 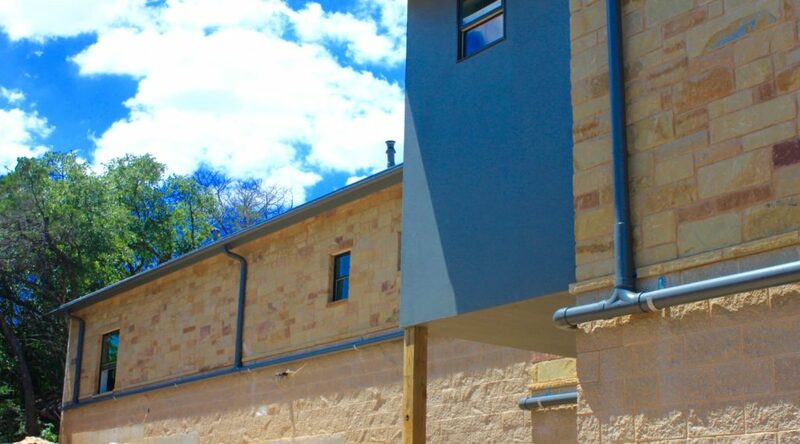 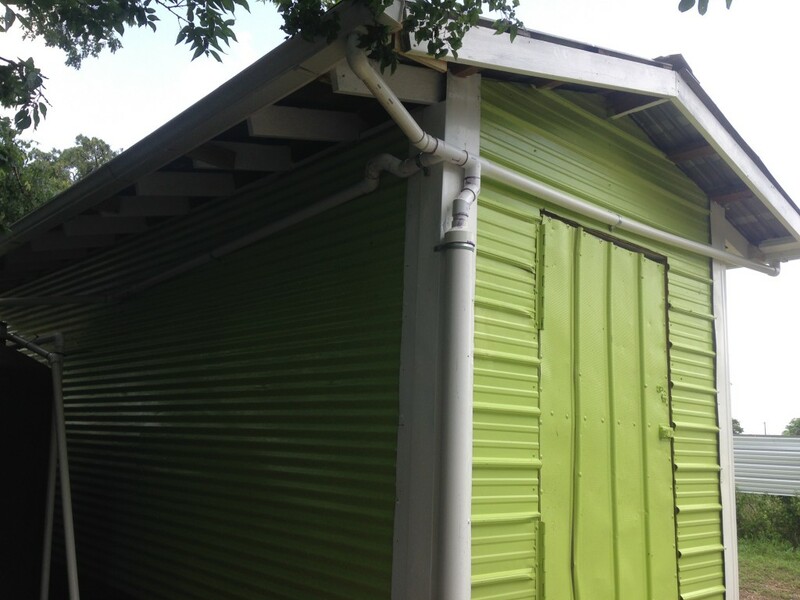 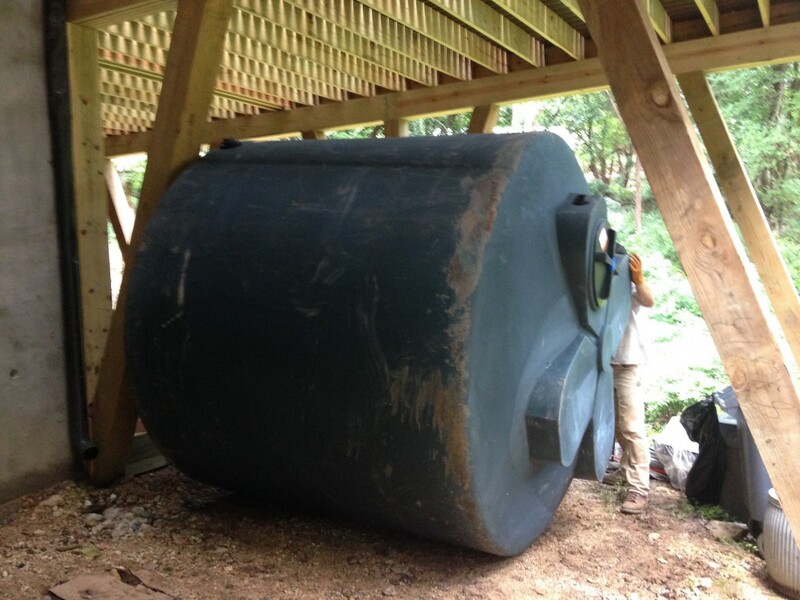 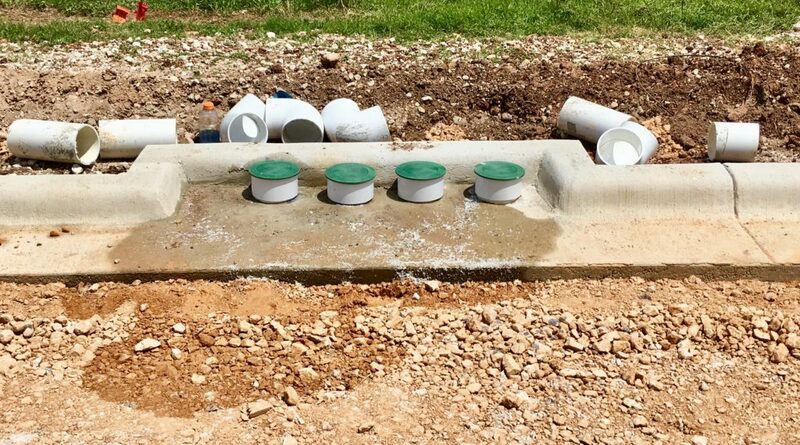 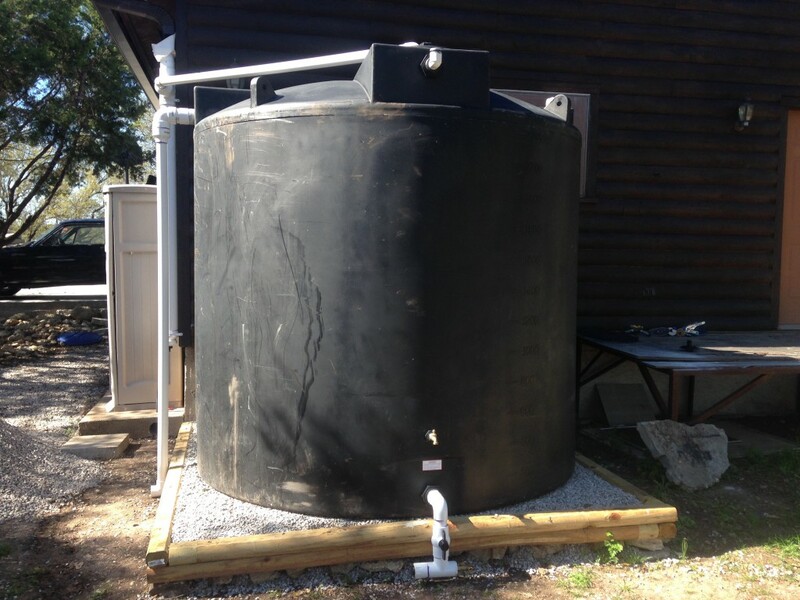 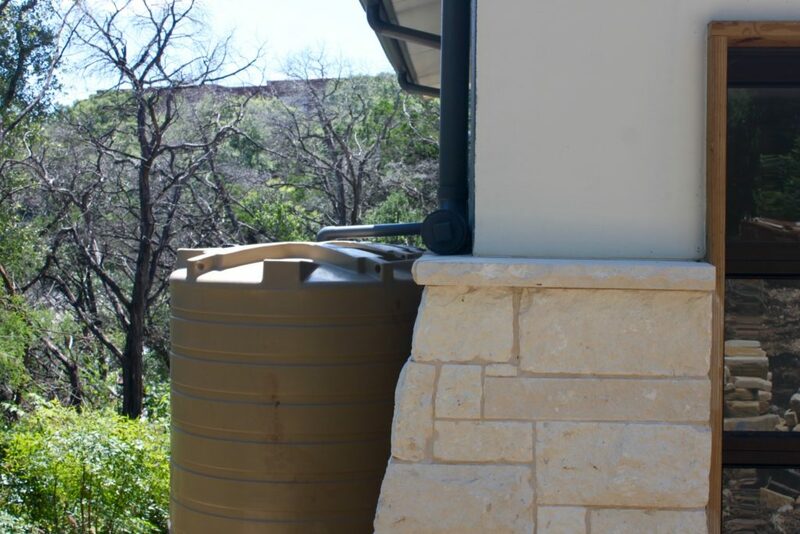 Using your stored rainwater with gravity pressure alone is not always possible. 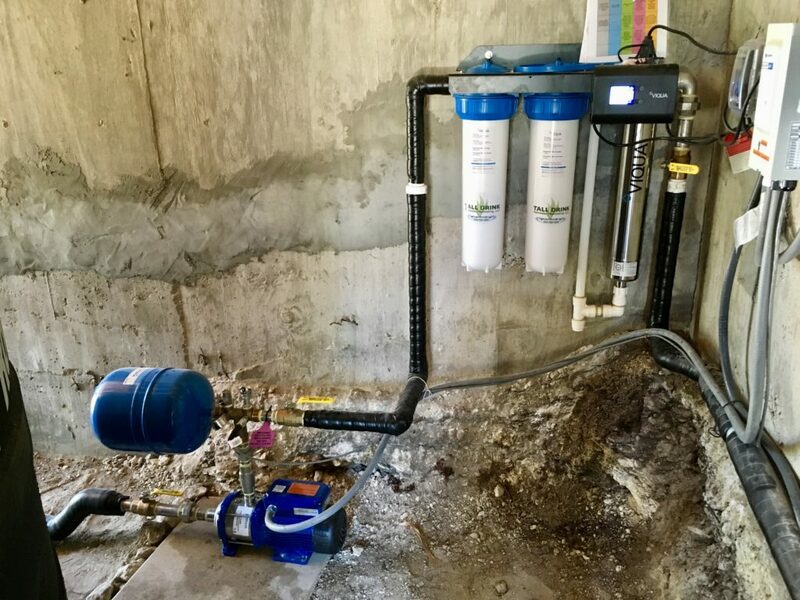 When more water pressure is needed, we would install a pump to deliver water at a higher volume rate comparable to that of the common garden hose spigot on the outside wall of your house. 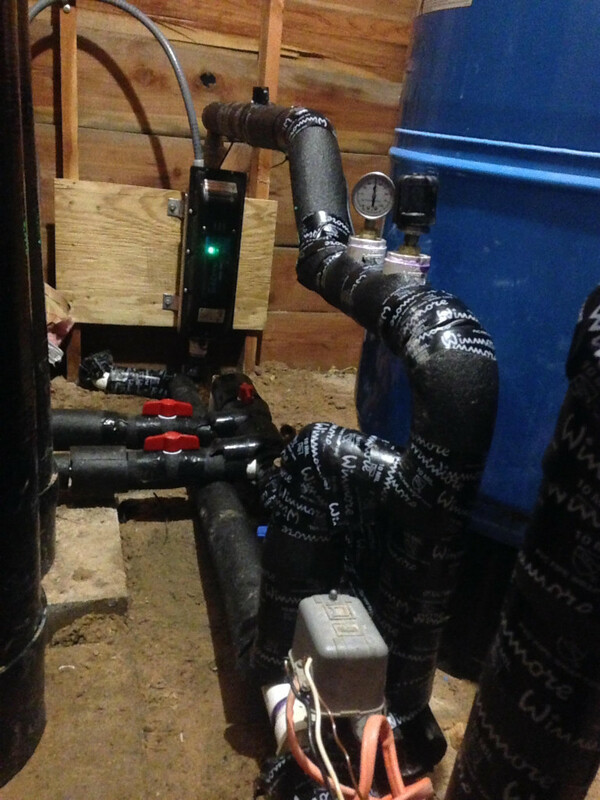 We use "on-demand" pumps and "constant pressure" pumps depending on the application. 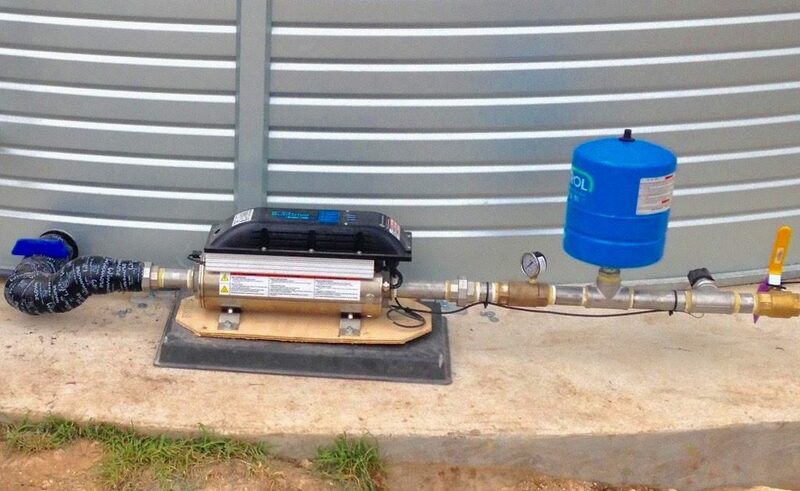 The pumps we use most are on-demand pumps which means they run at one speed when the water is needed. 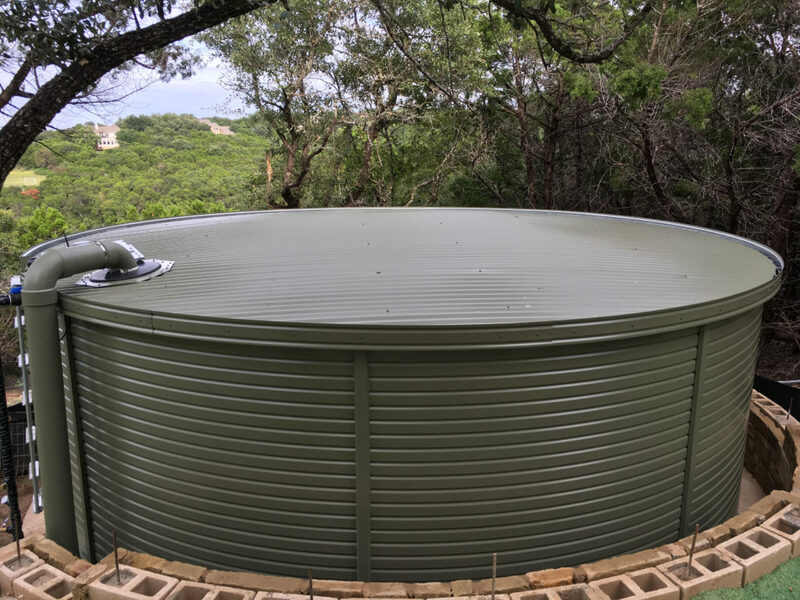 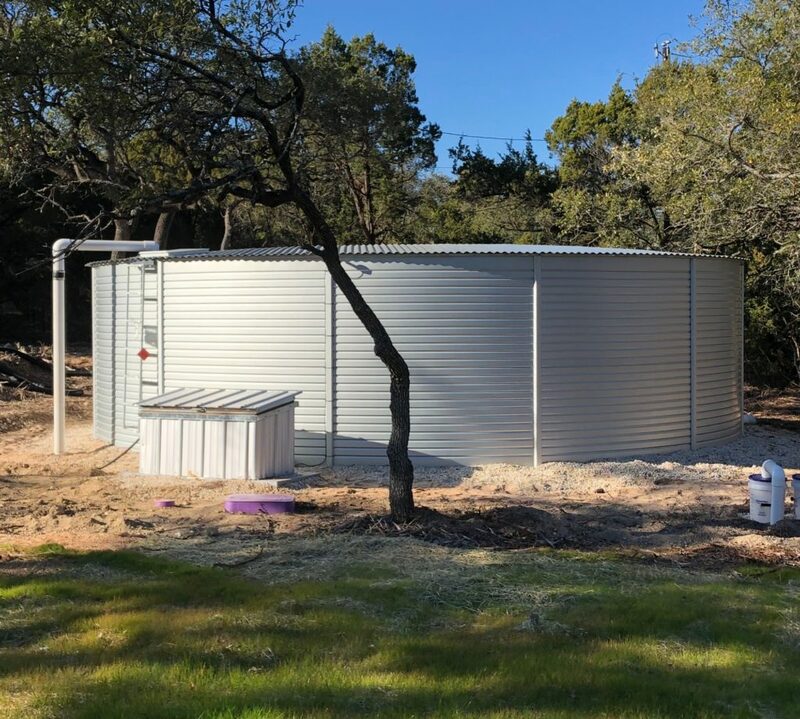 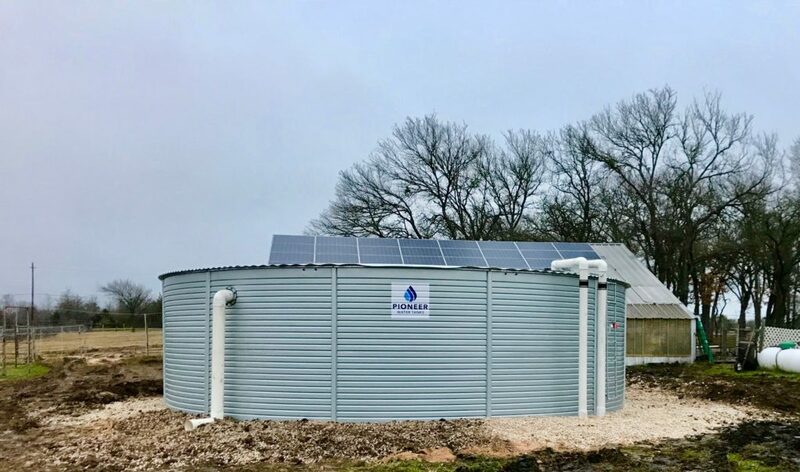 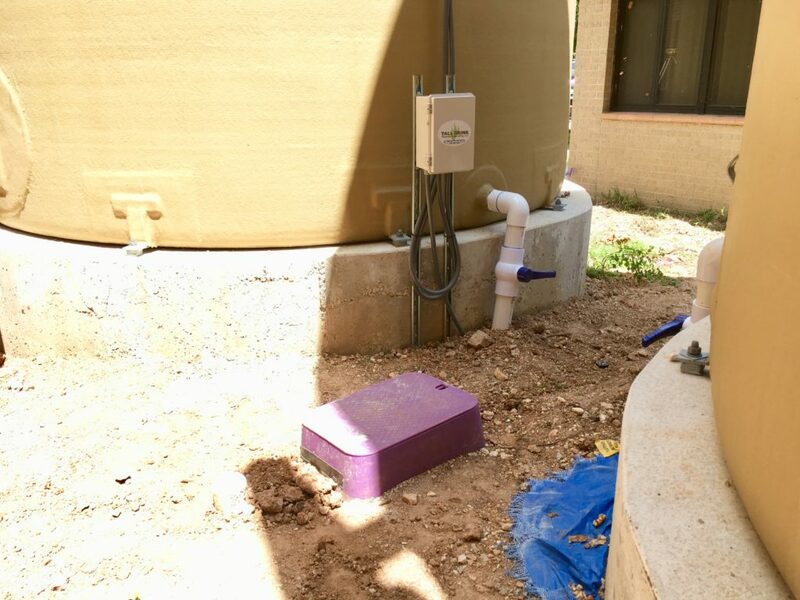 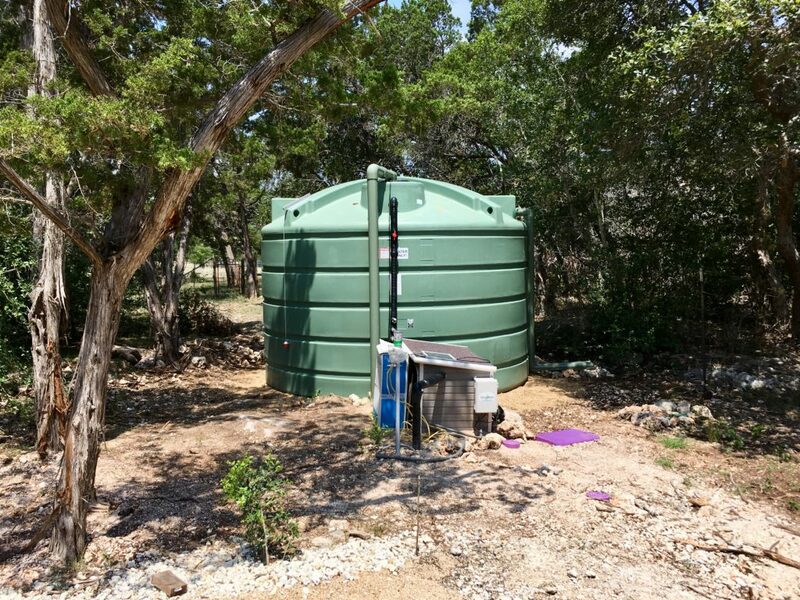 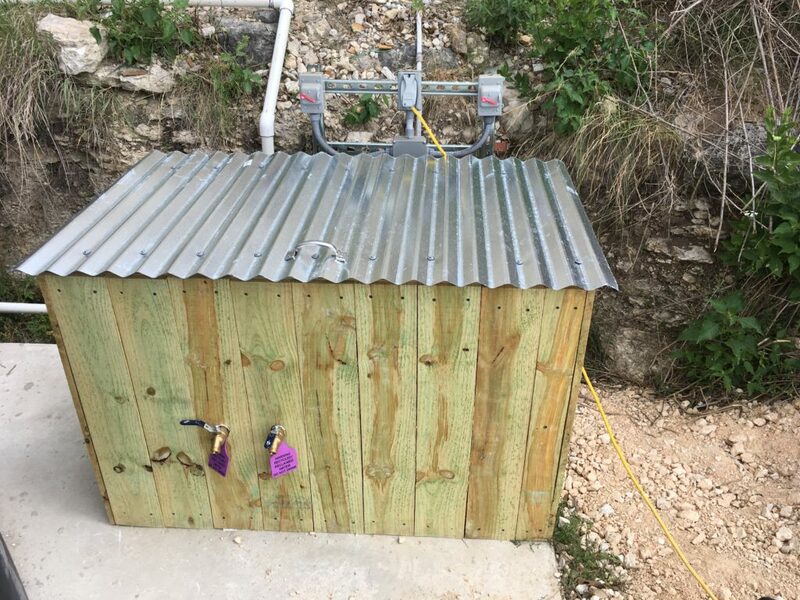 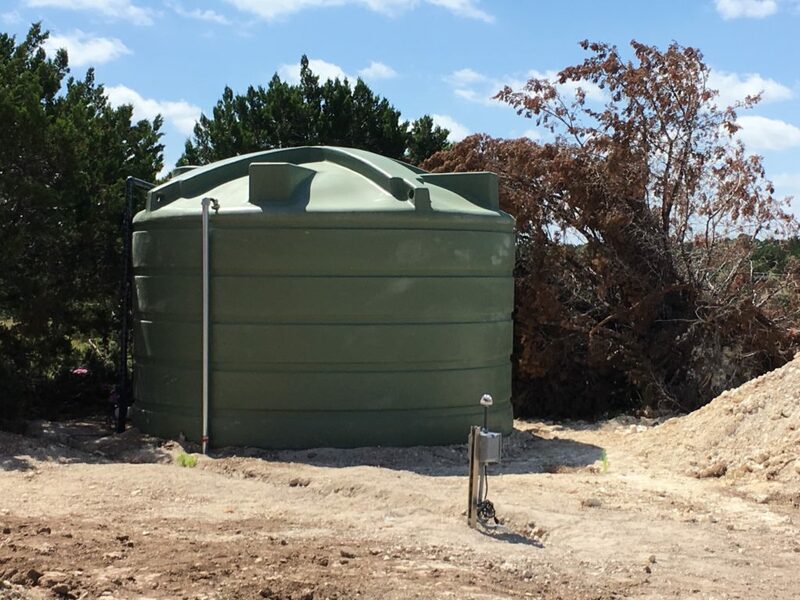 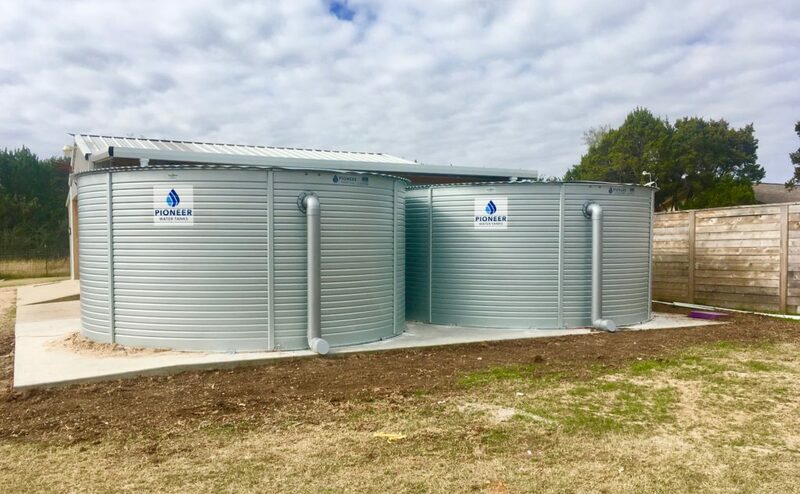 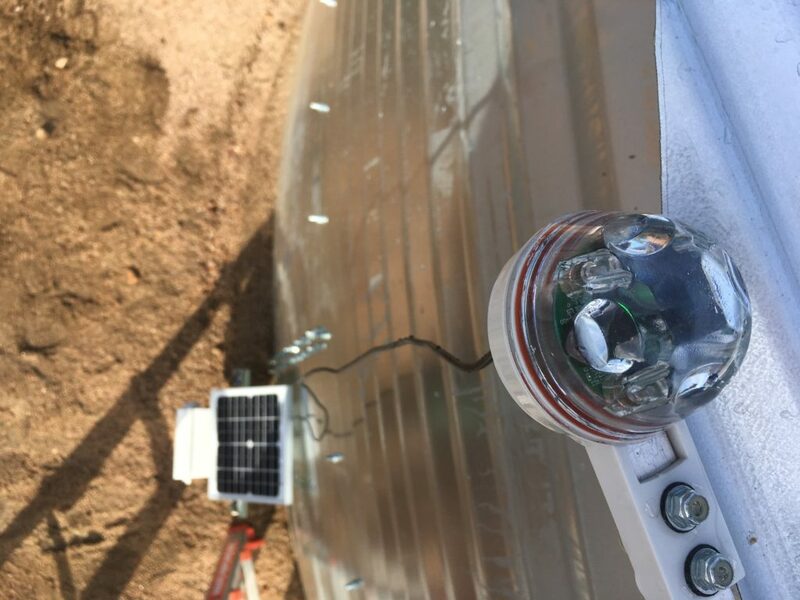 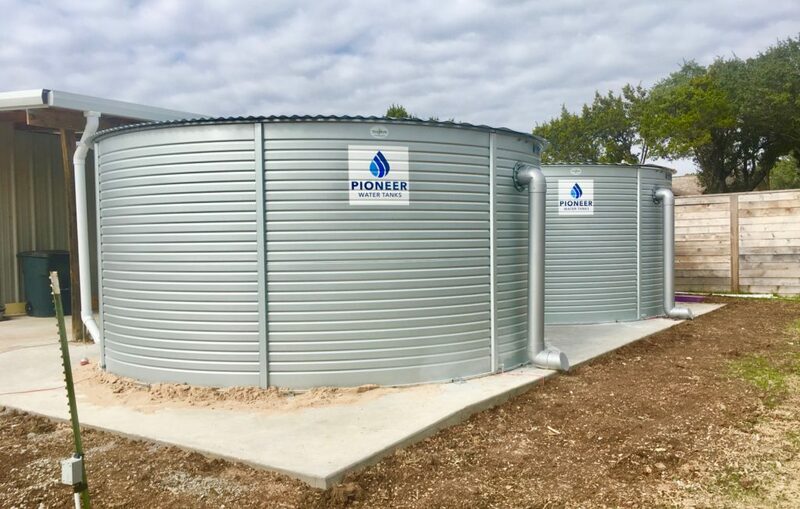 When water is not needed, they stay pressurized (with an internal pressure tank) in standby mode so that they are ready to deliver water the next time it is needed almost instantaneously. 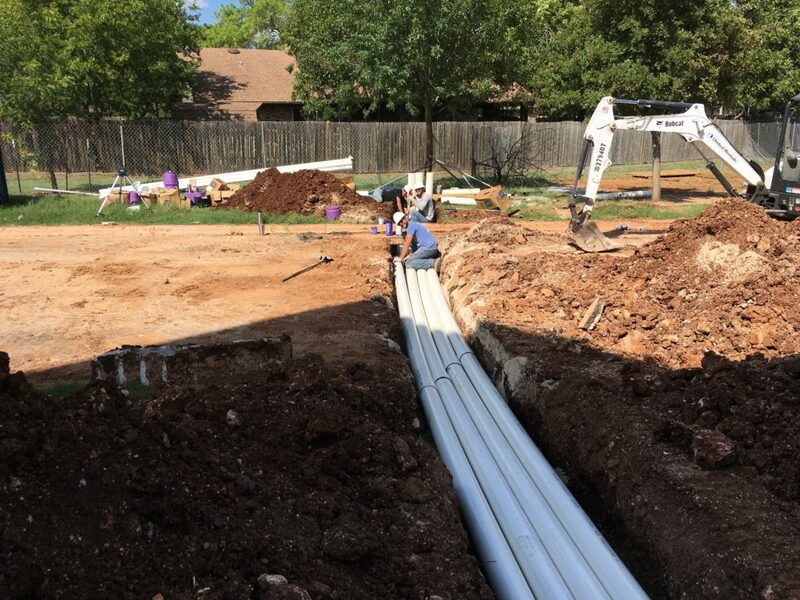 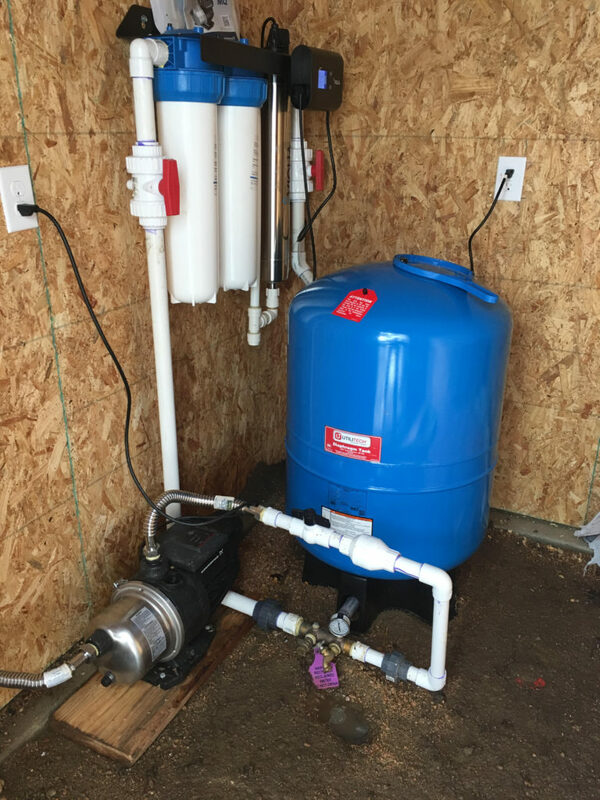 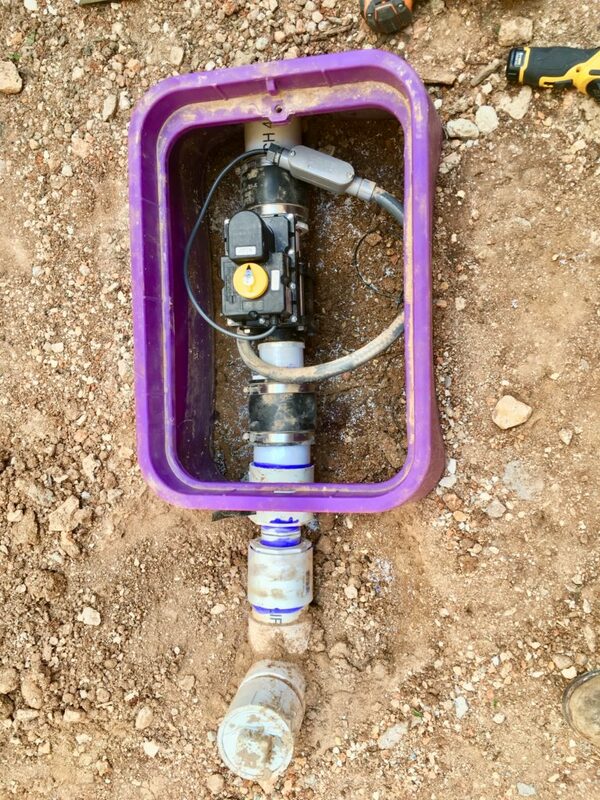 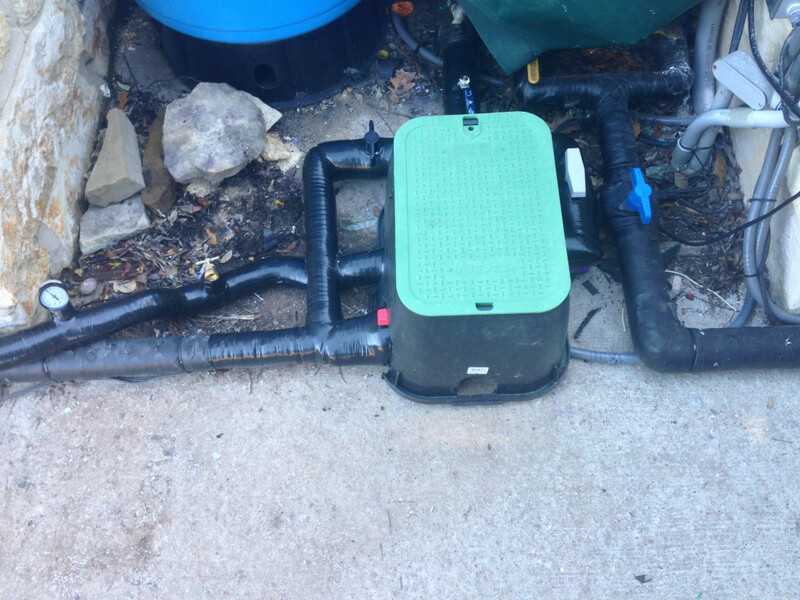 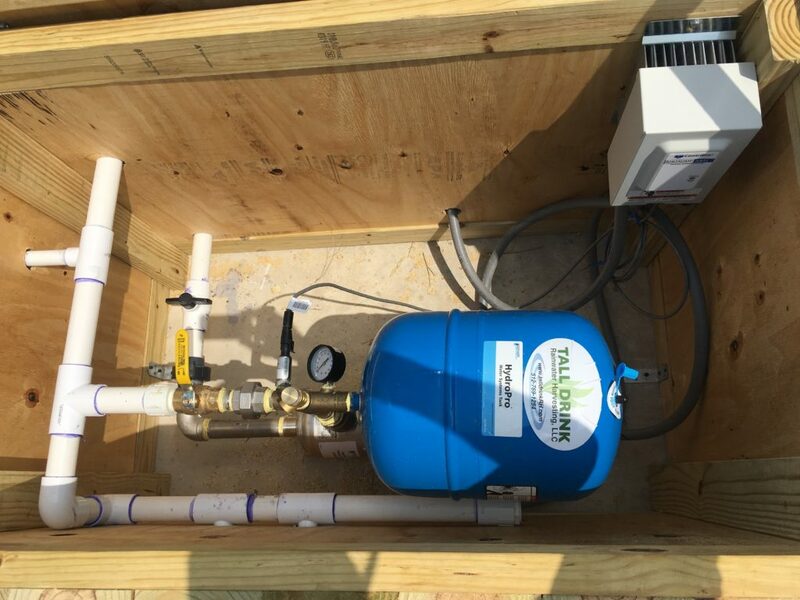 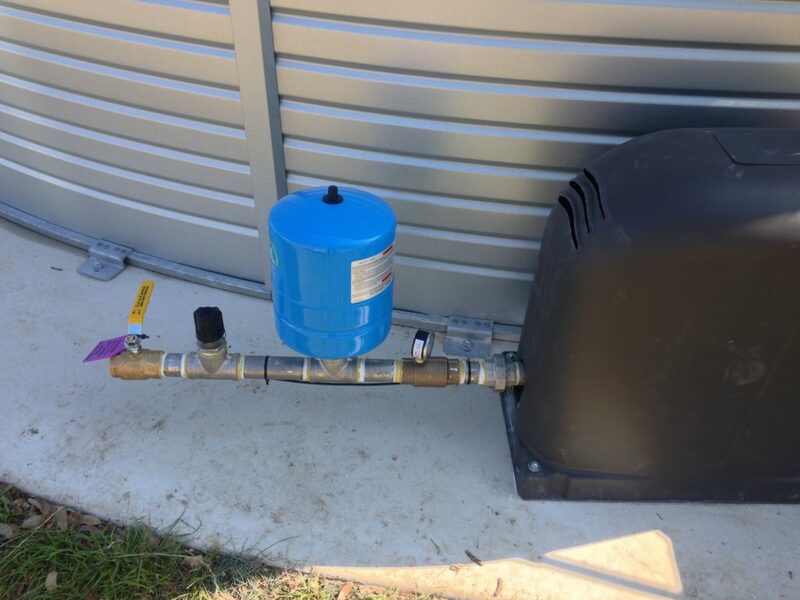 On-demand pumps are generally low cost and very effective when there aren't multiple fixtures, zones, or appliances using water at the same time. 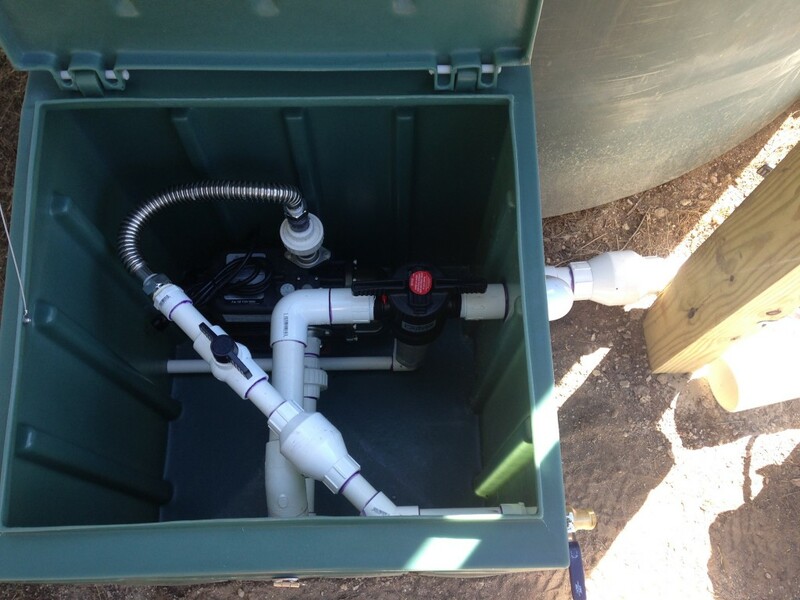 A constant pressure pump would be used in the case where multiple fixtures may be using water at the same time. 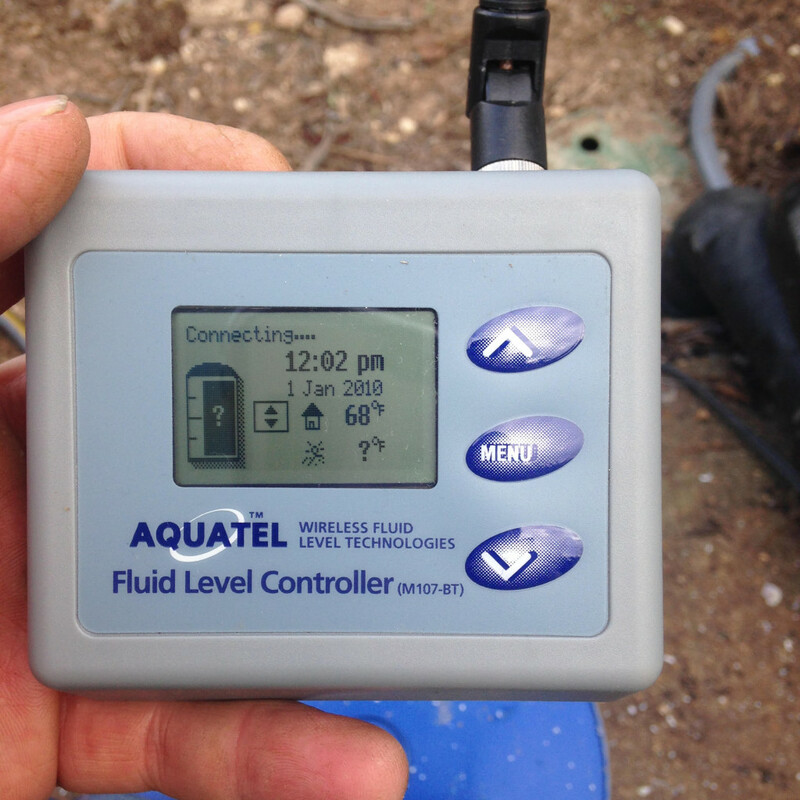 They operate at multiple speeds so that they can adjust the output according to the demand. 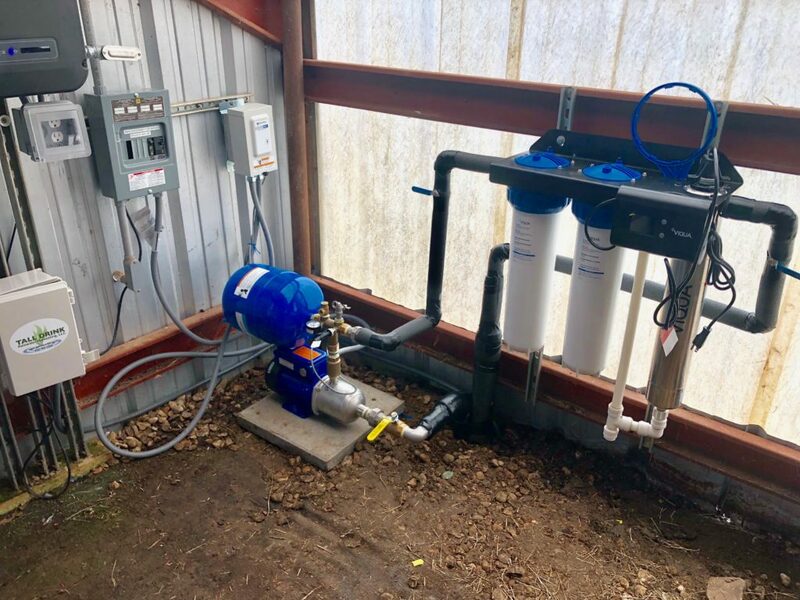 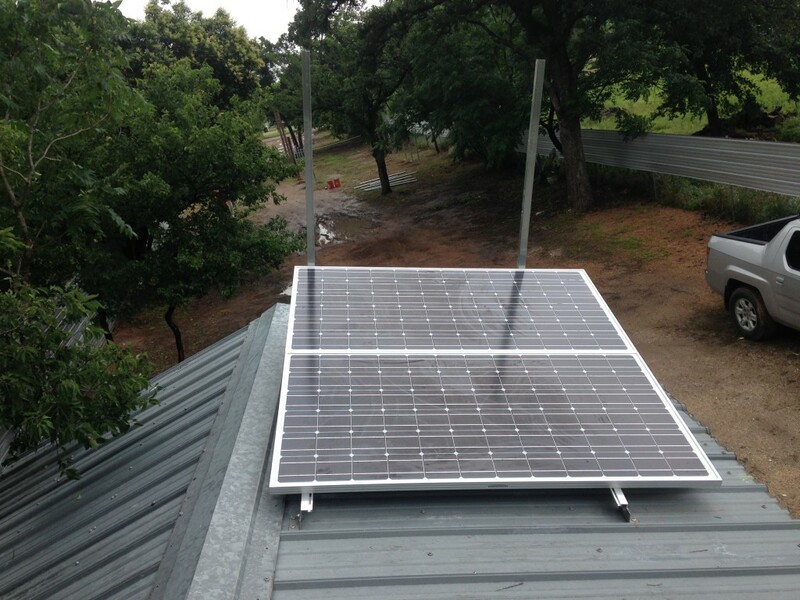 They are usually twice the cost of the single speed on-demand pumps but they consume less energy with their soft starts, and they deliver consistent pressure at each fixture being used without noticeable dips in pressure. 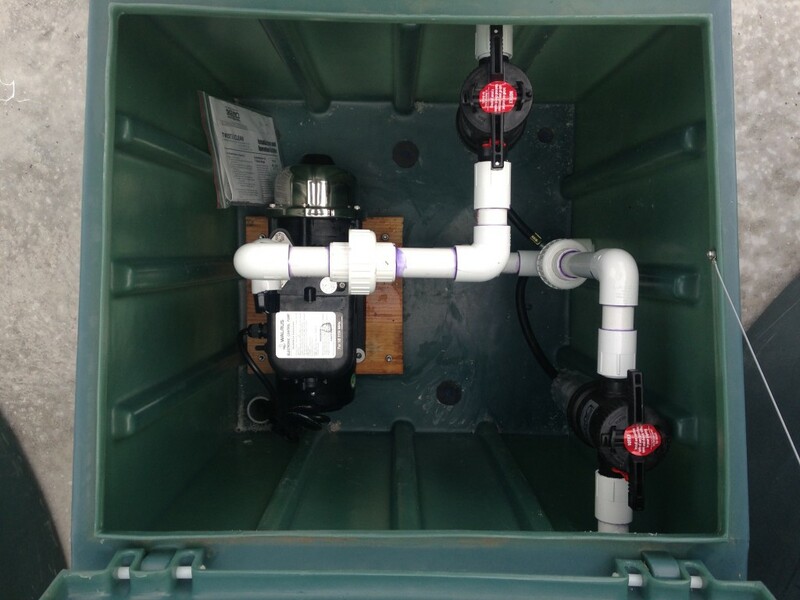 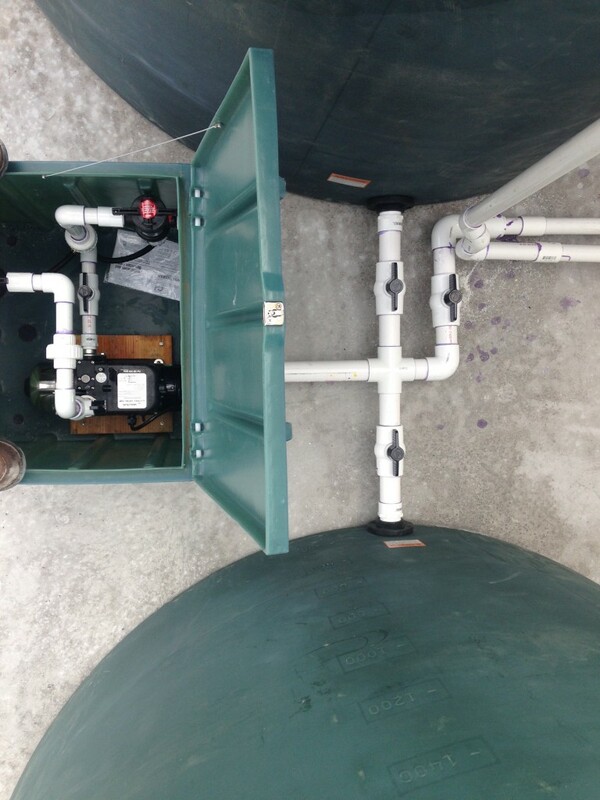 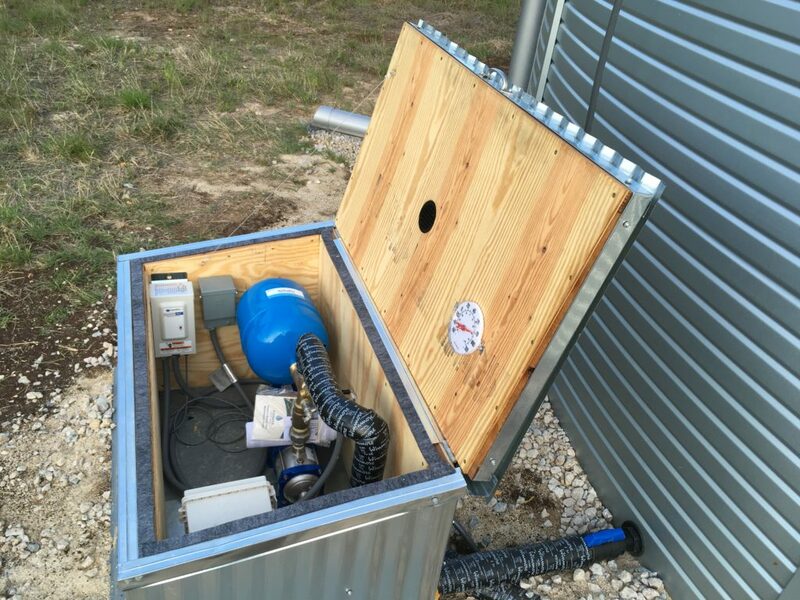 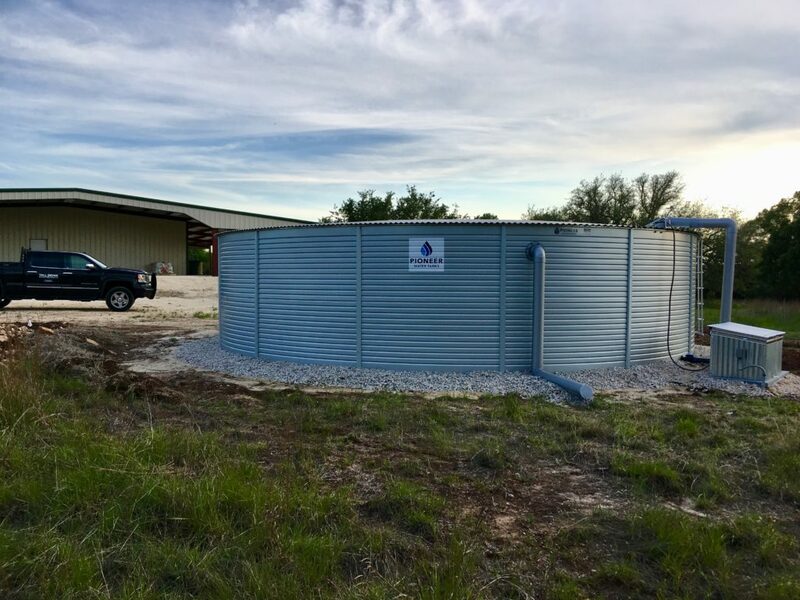 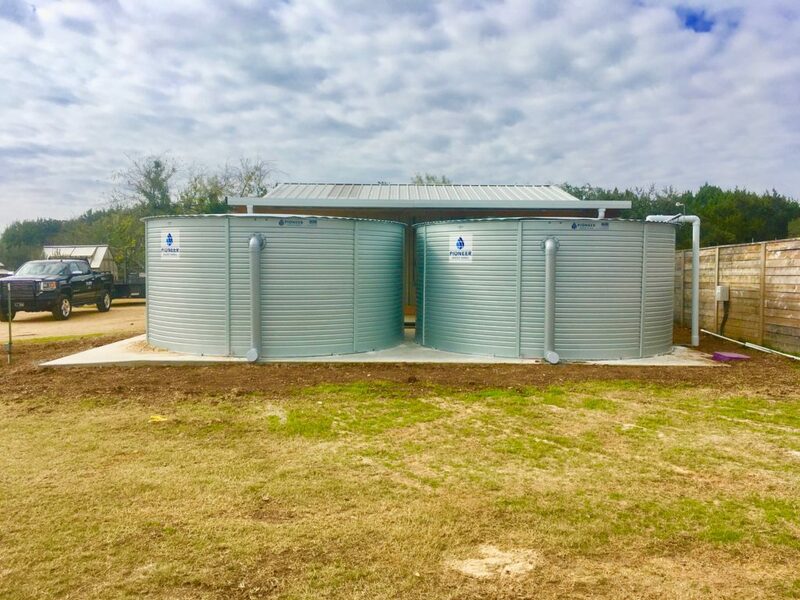 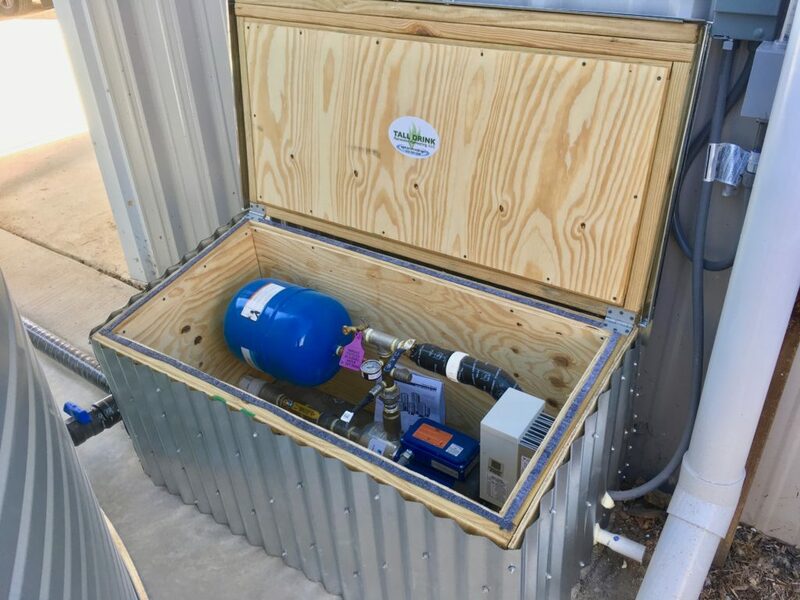 We also provide very small polyurethane pump houses and lockable pump covers for those that prefer a turnkey system rather than having to build one after the installation is done. 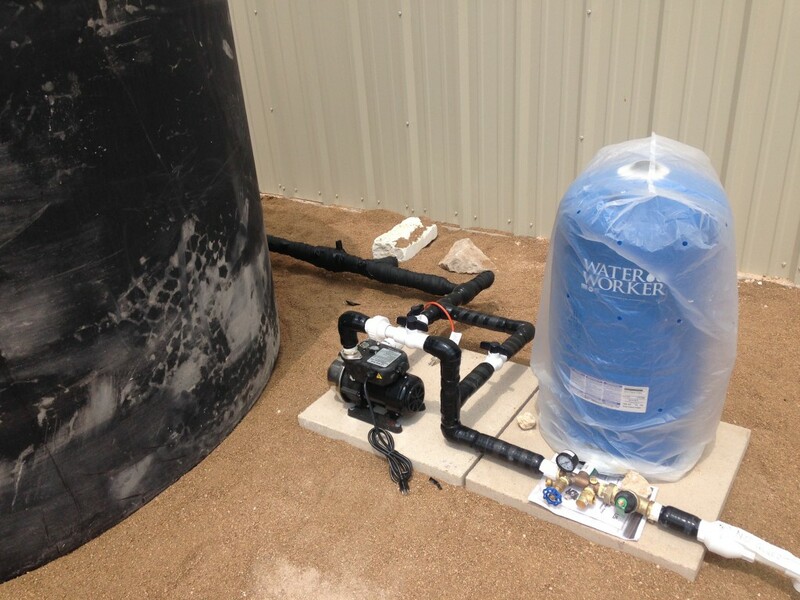 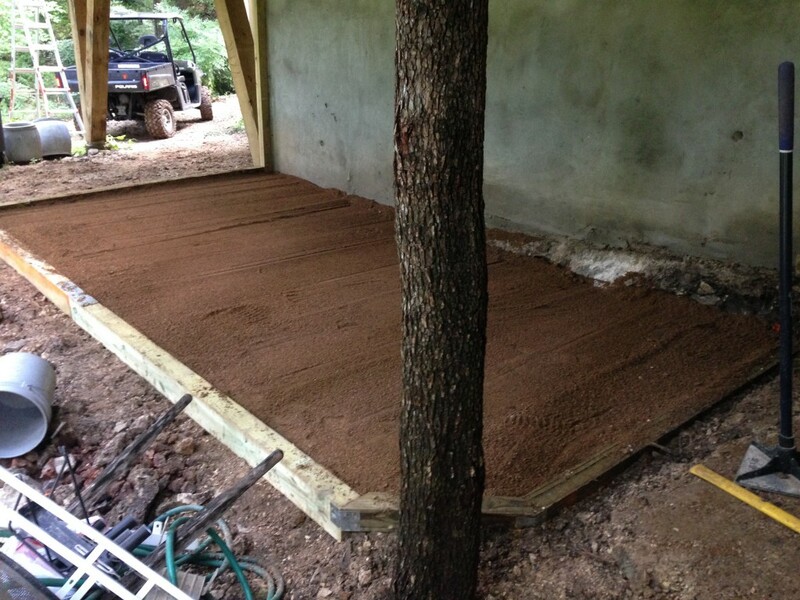 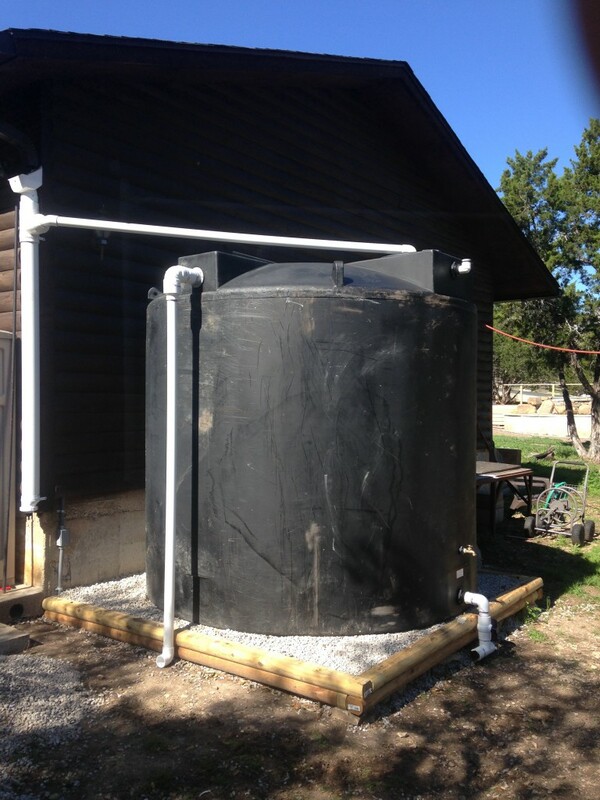 Sediment filters are utilized to keep any solid organic material from entering the pressure system. 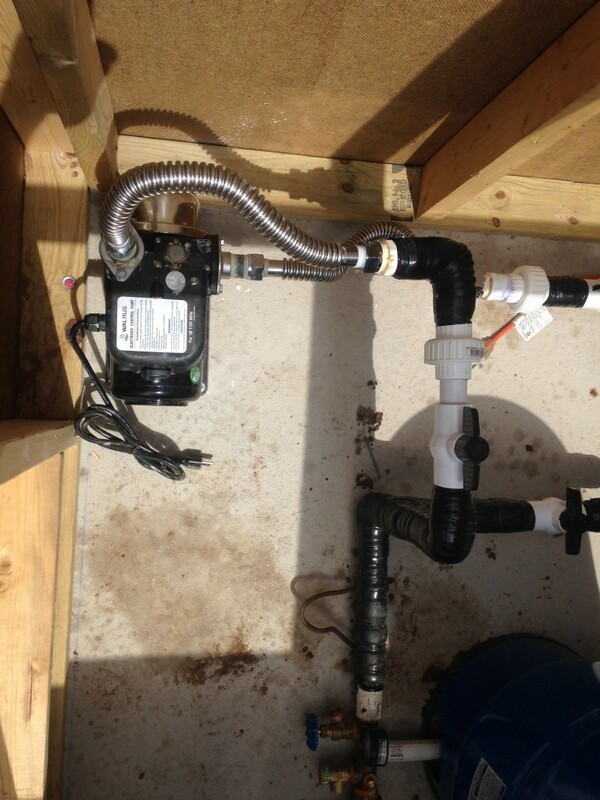 This will prolong the life of the pump and equipment. 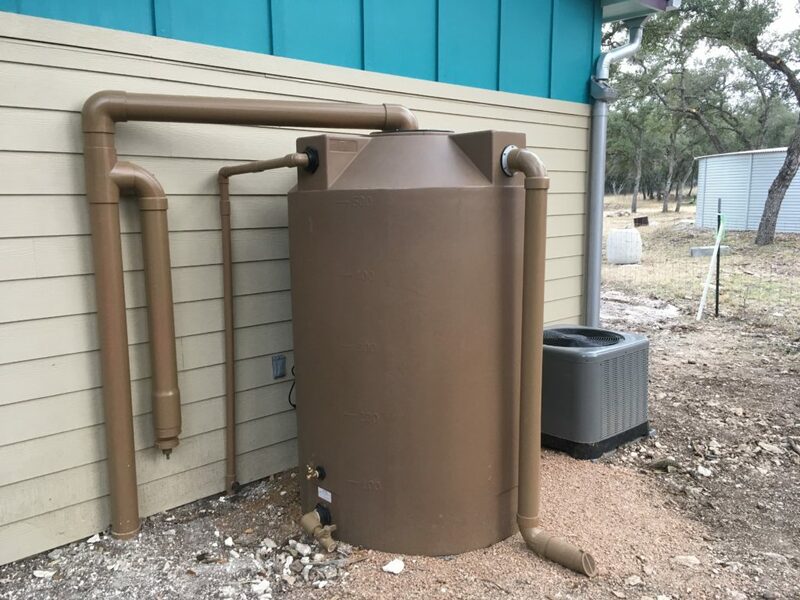 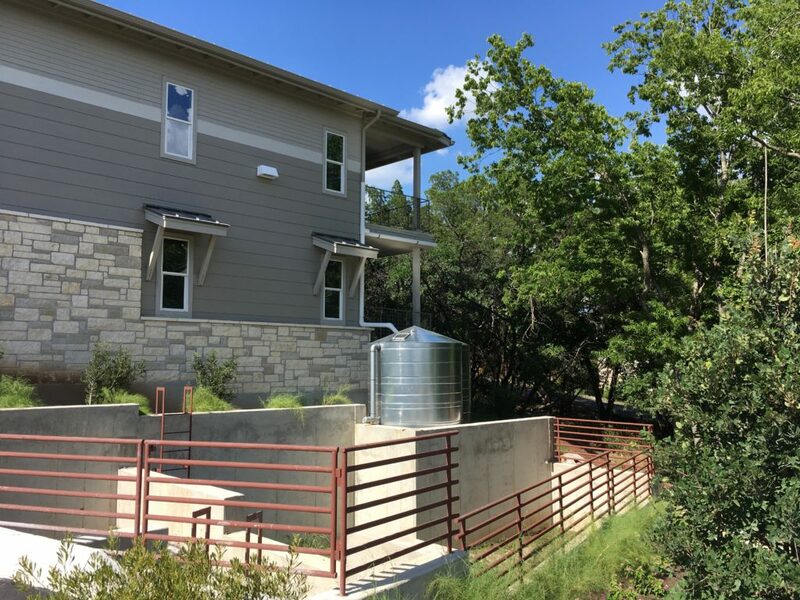 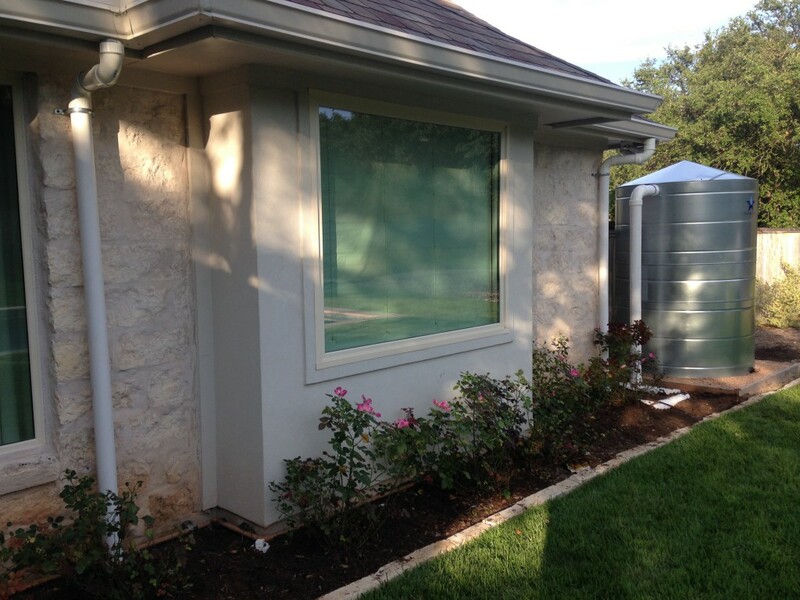 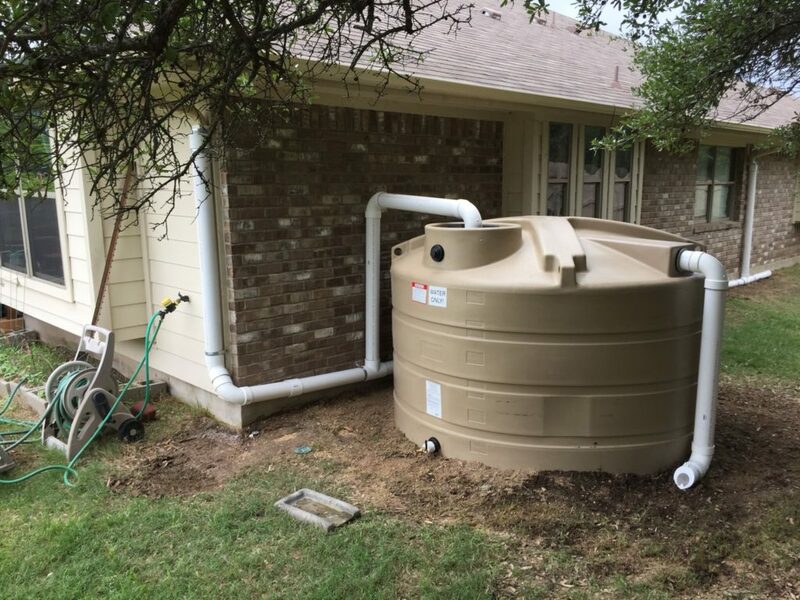 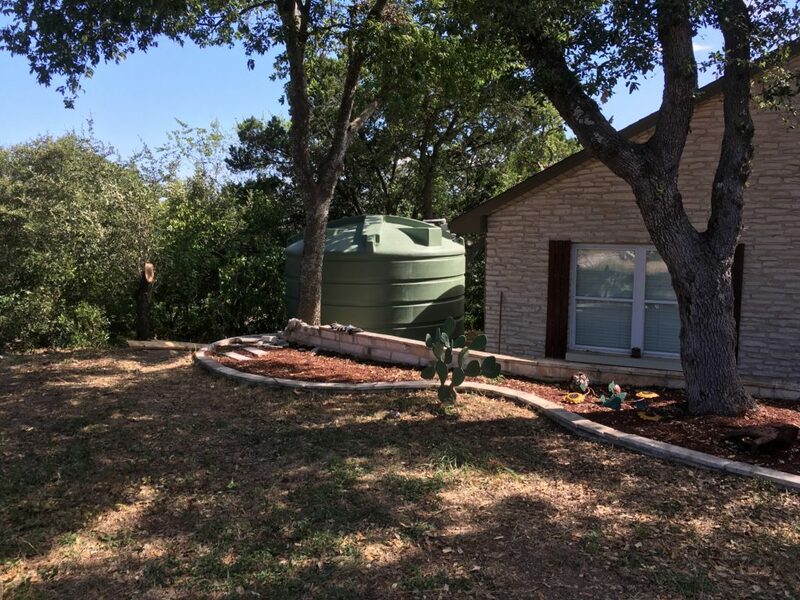 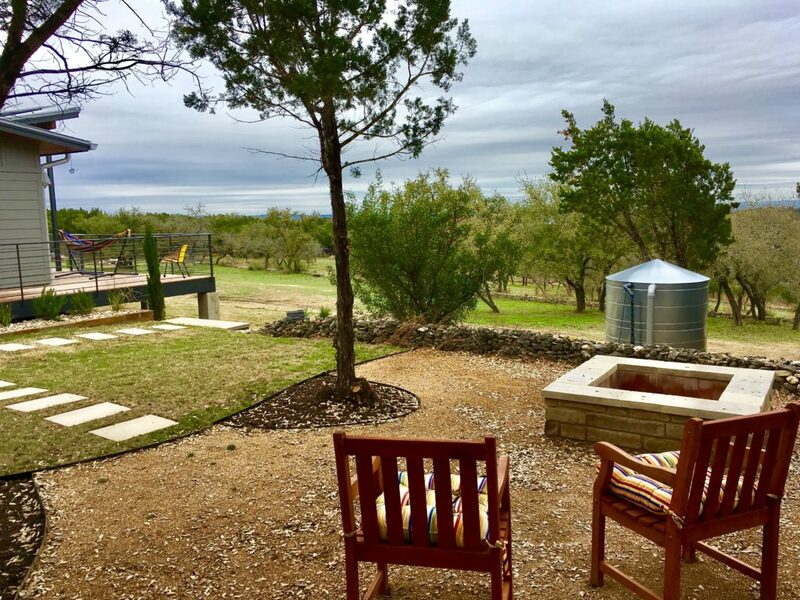 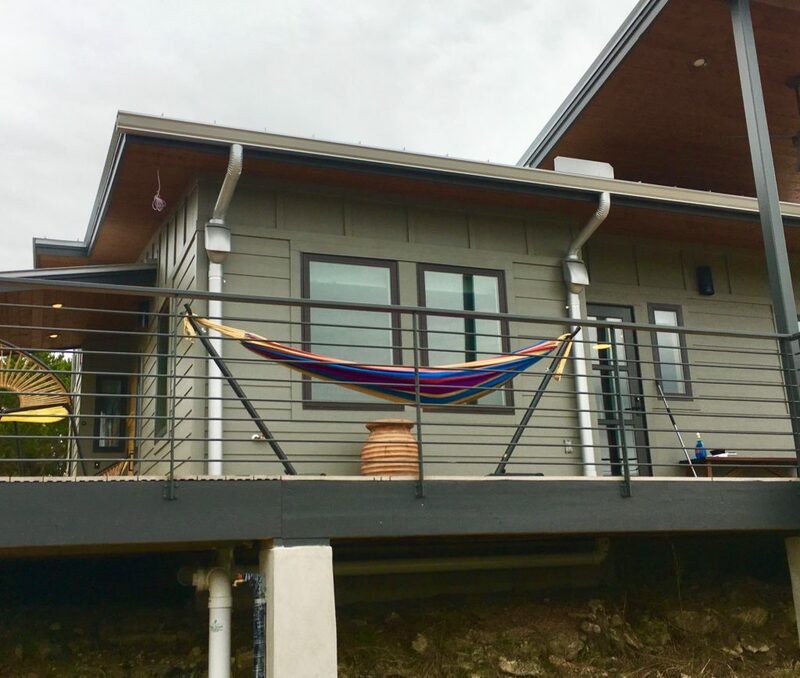 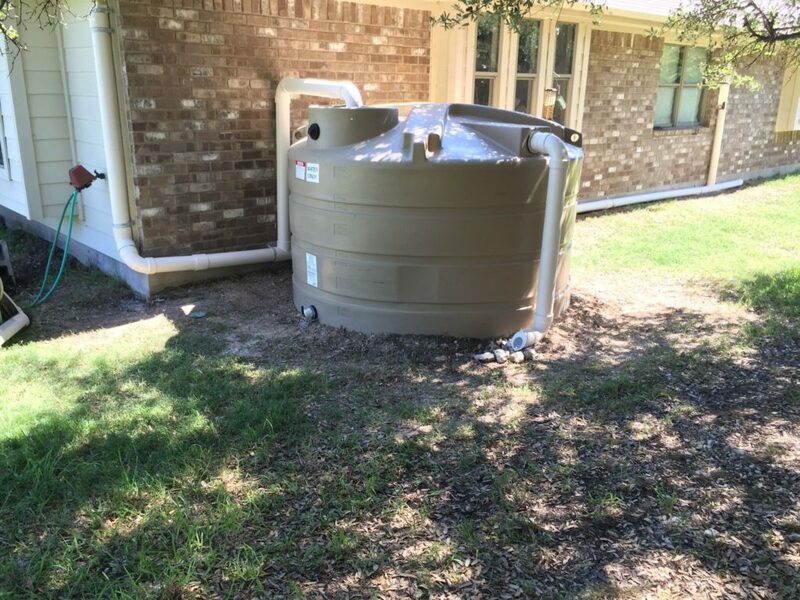 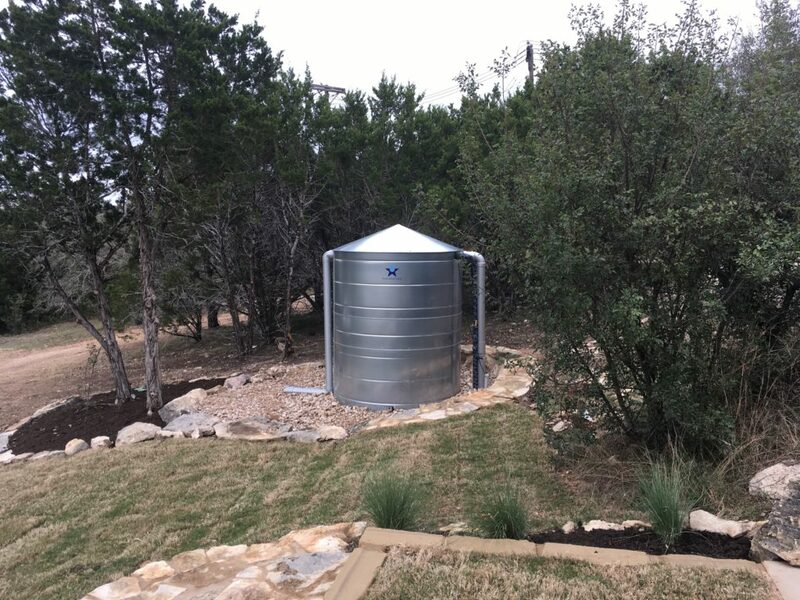 When rainwater is being used for potable applications, it must be channeled through a disinfection filtration system to kill any bacteria or viruses before entering the house. 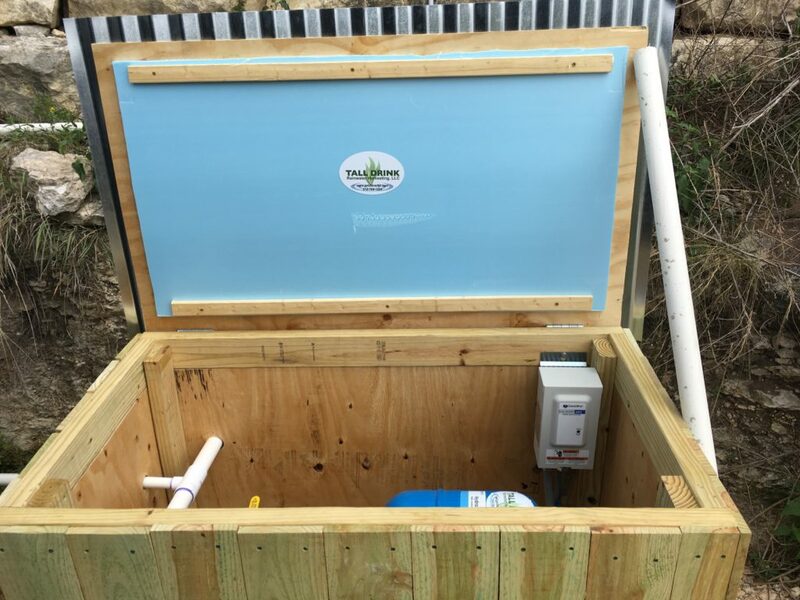 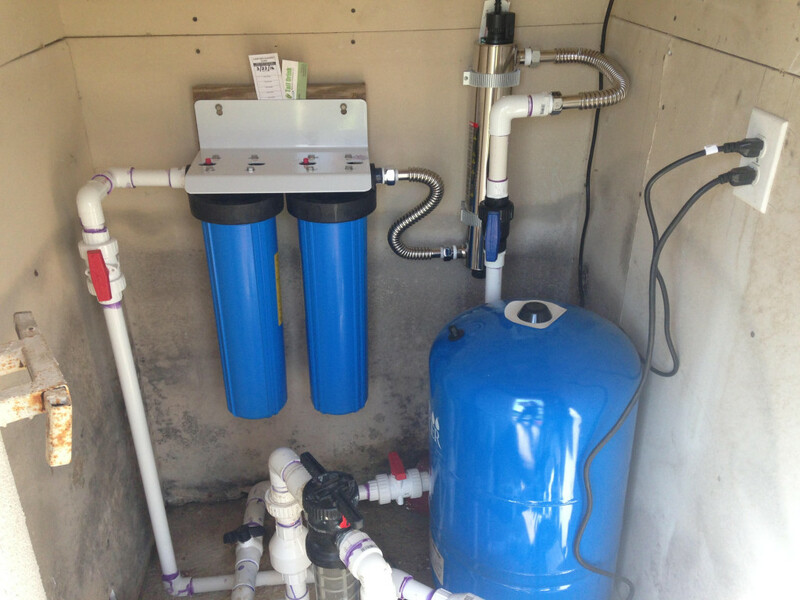 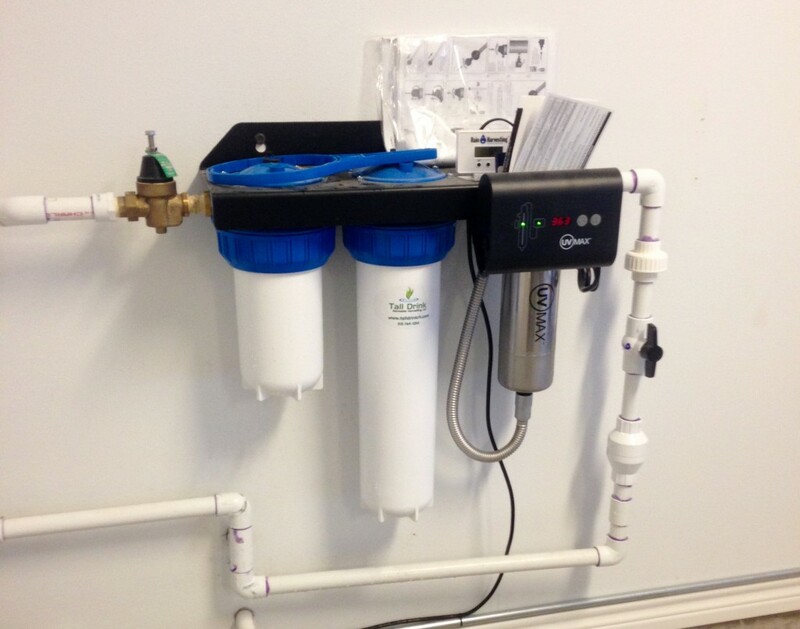 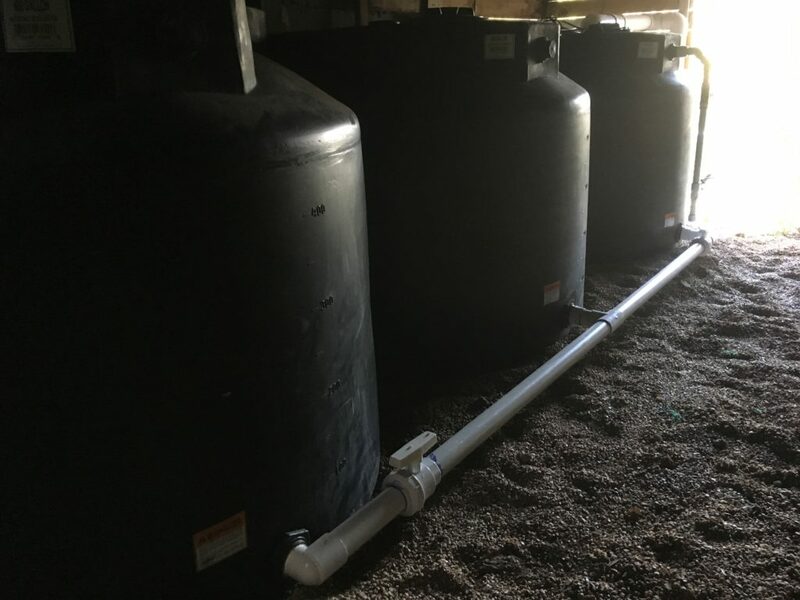 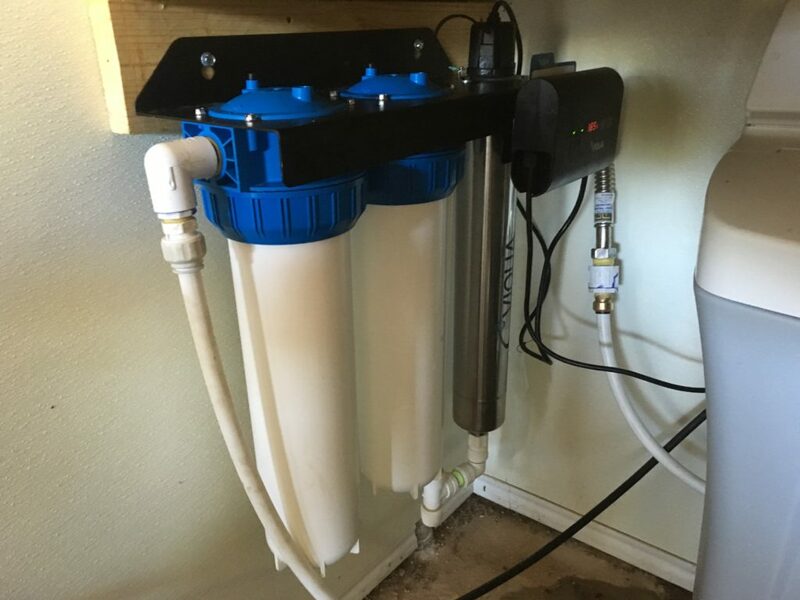 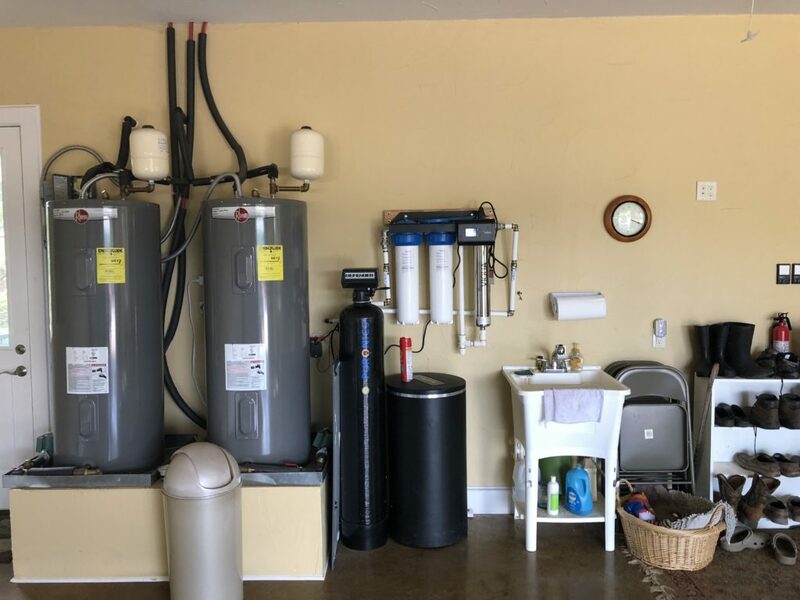 We also provide this service by installing a multiple-stage UV filtration system using a 20 micron sediment filter, 5 micron carbon filter, and UV light that kills 99.9% of any organisms before the water enters house plumbing. 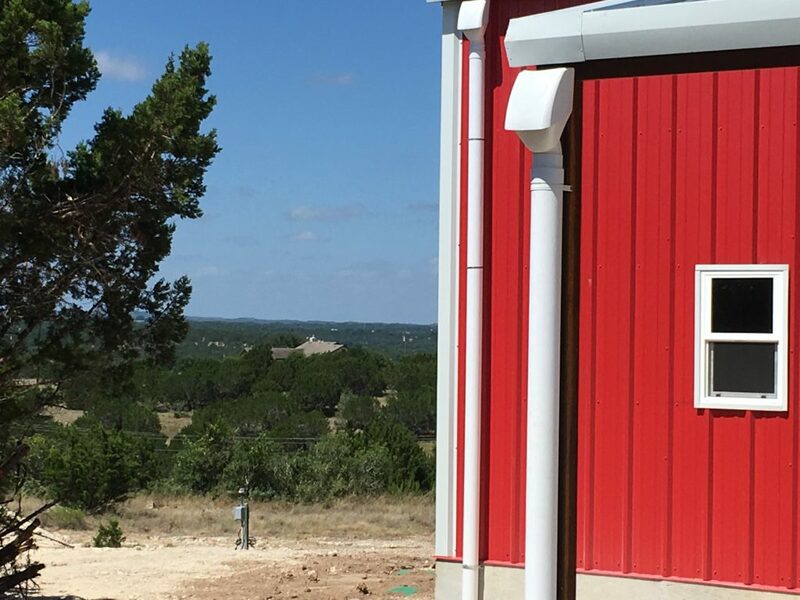 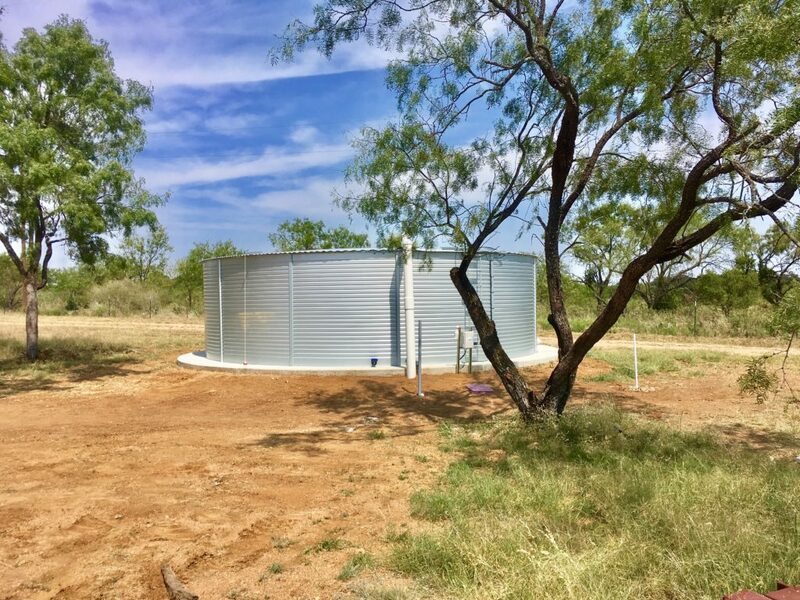 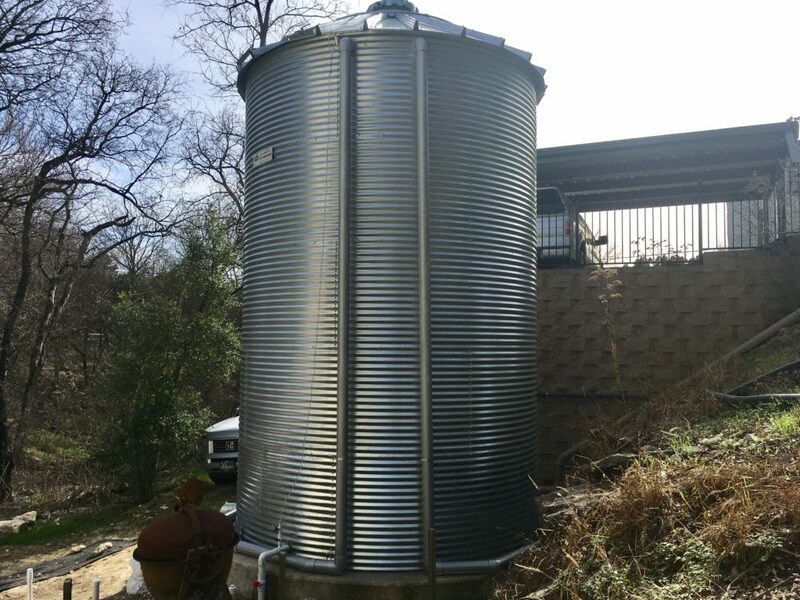 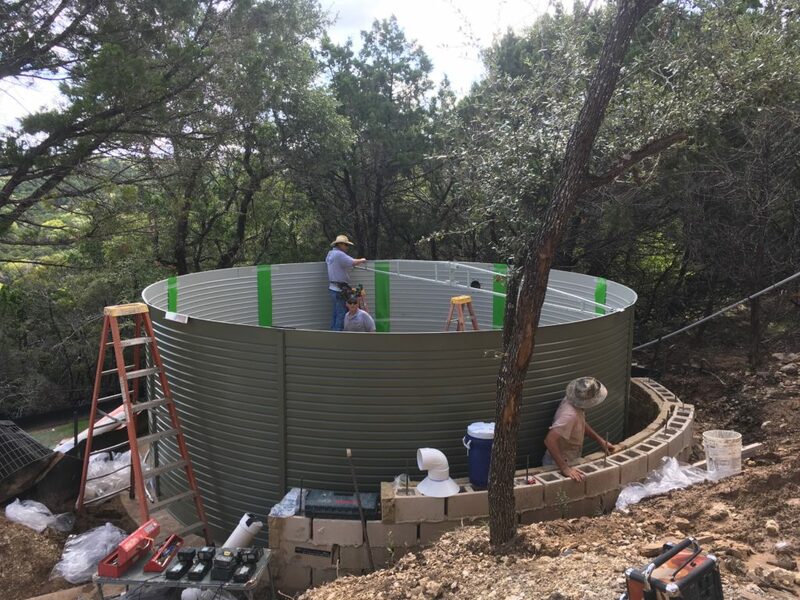 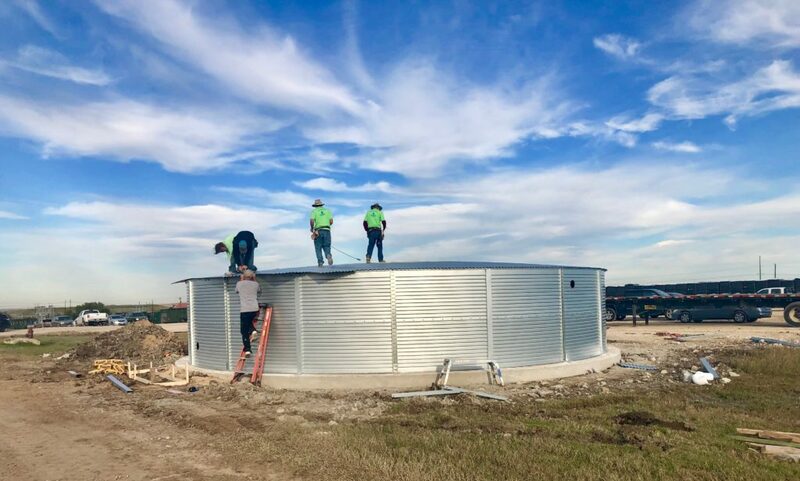 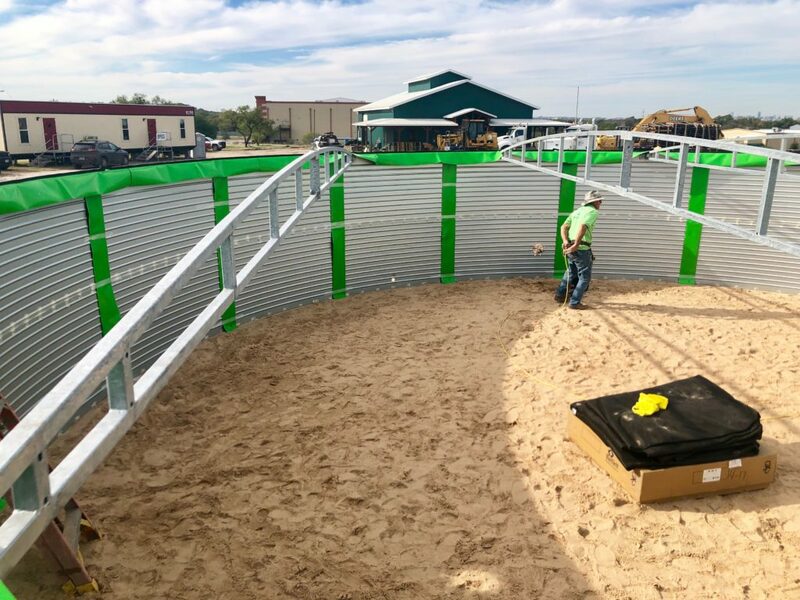 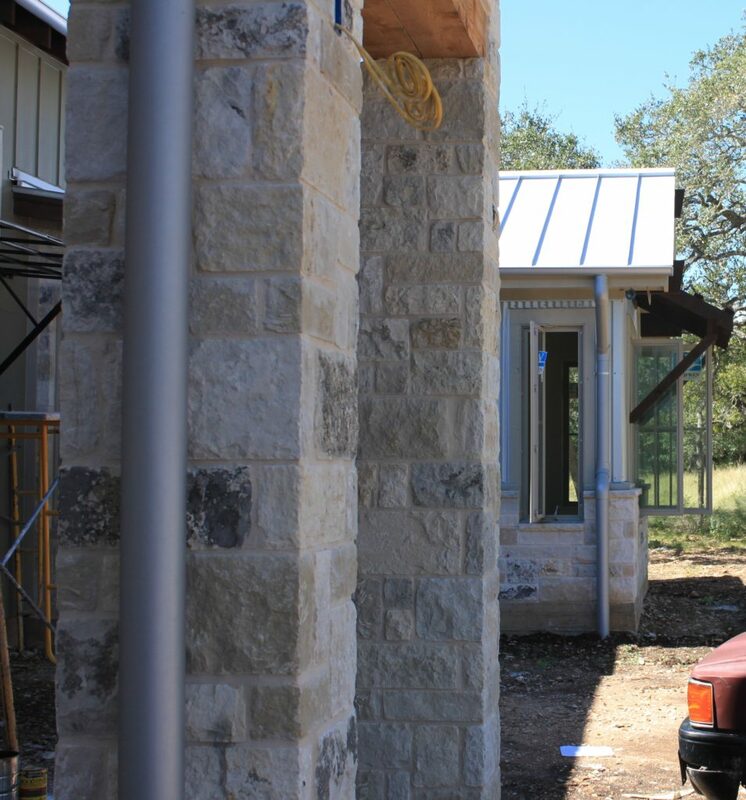 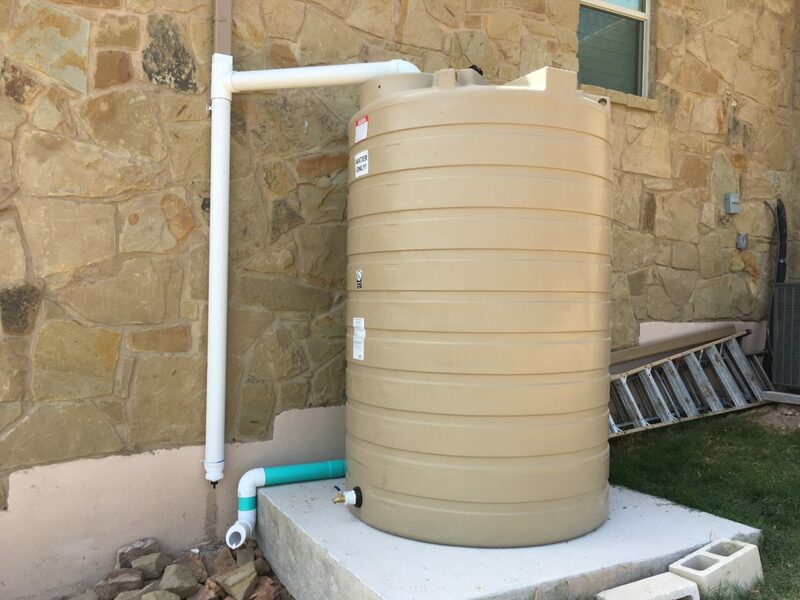 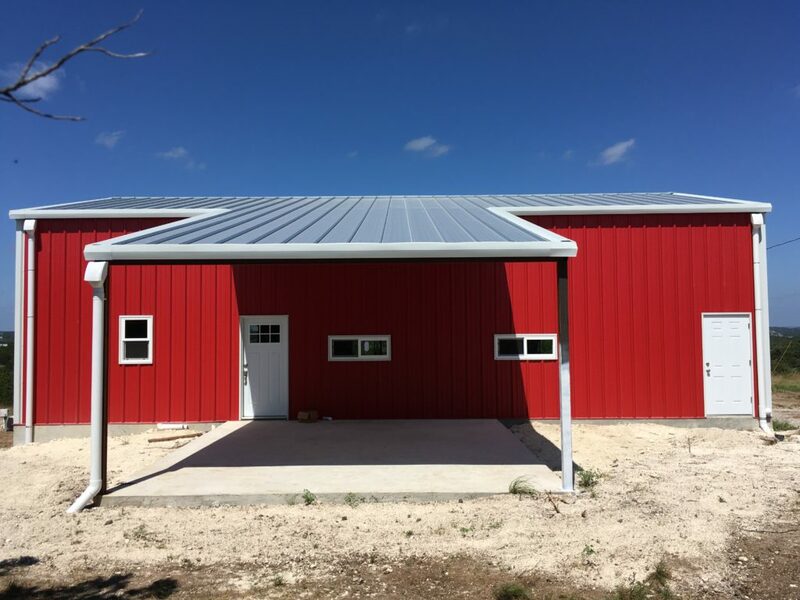 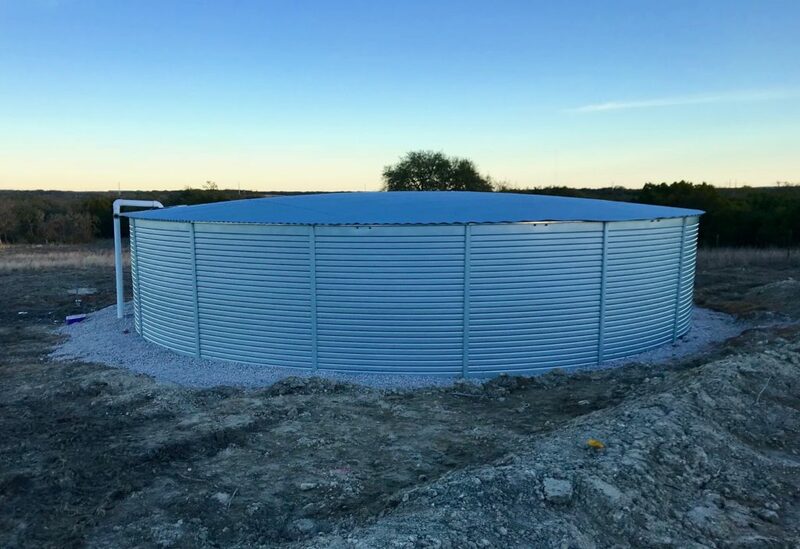 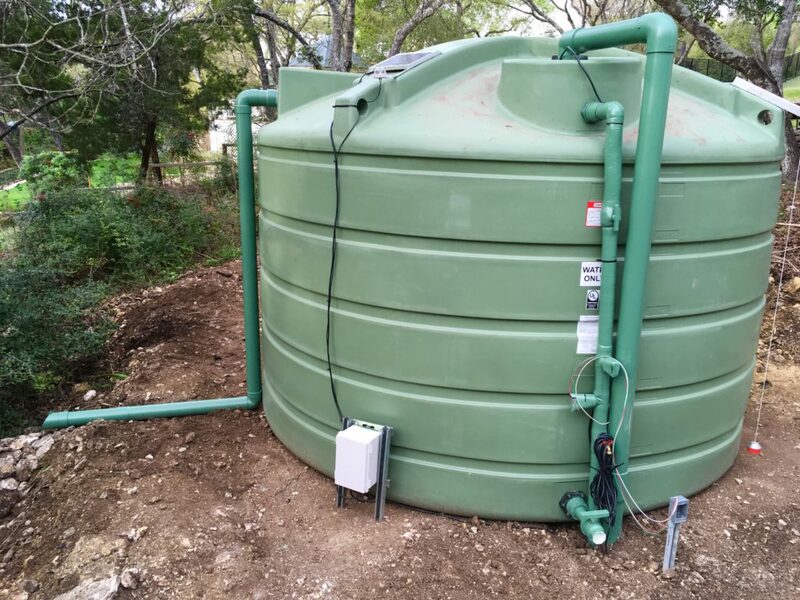 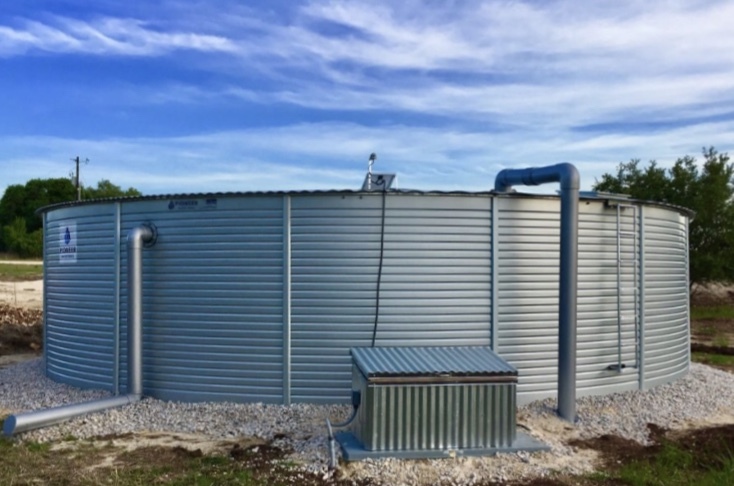 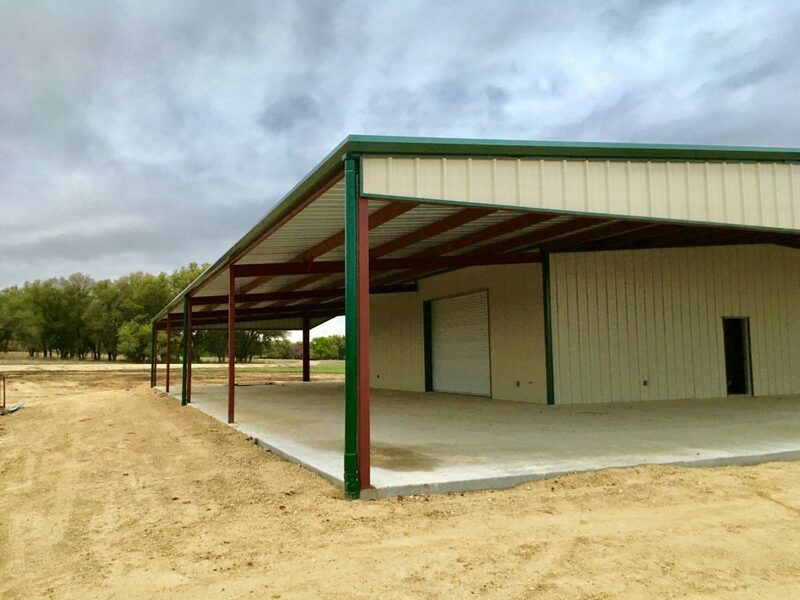 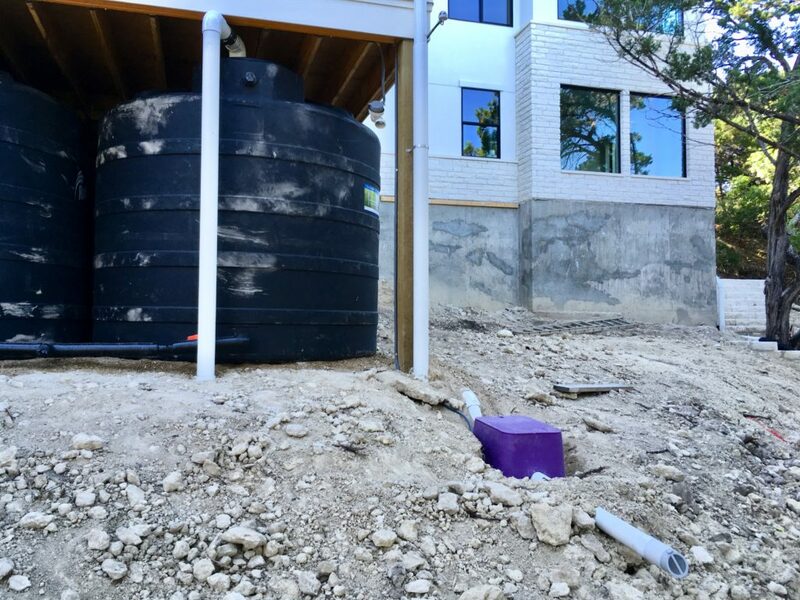 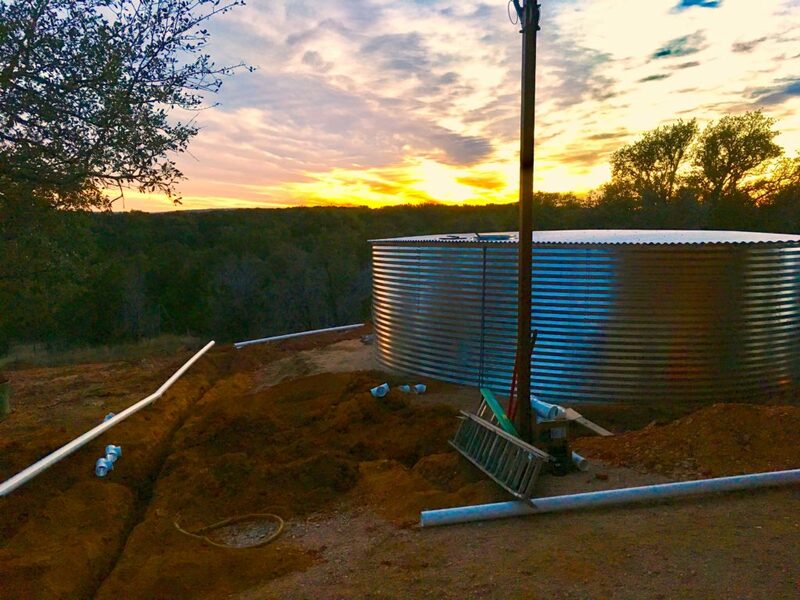 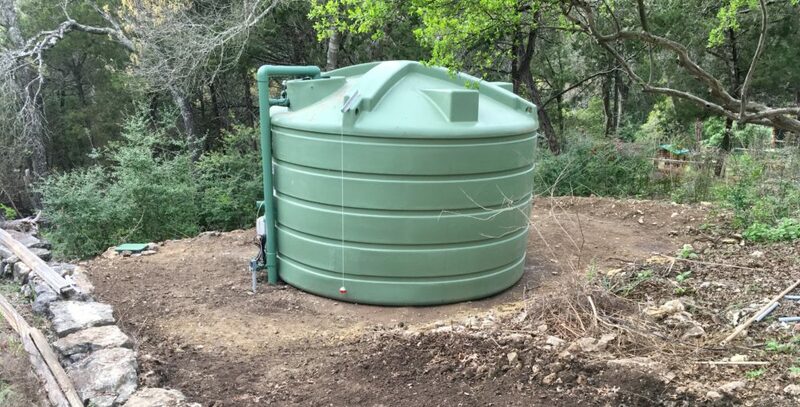 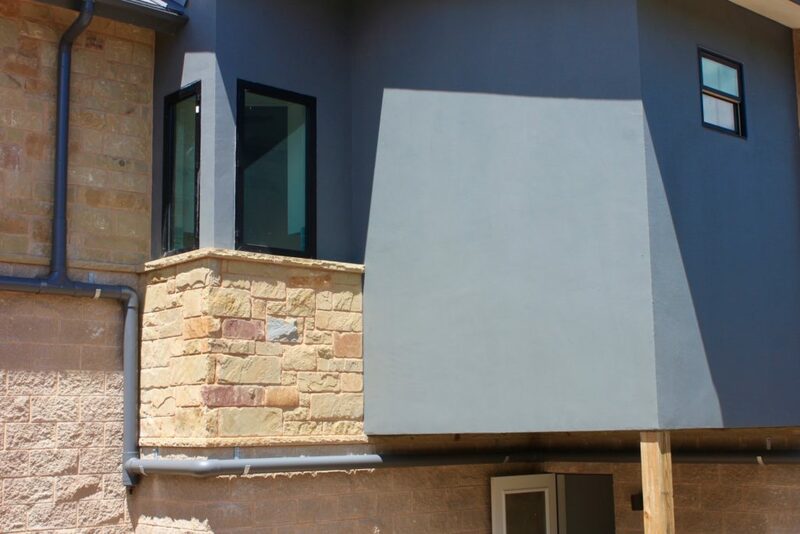 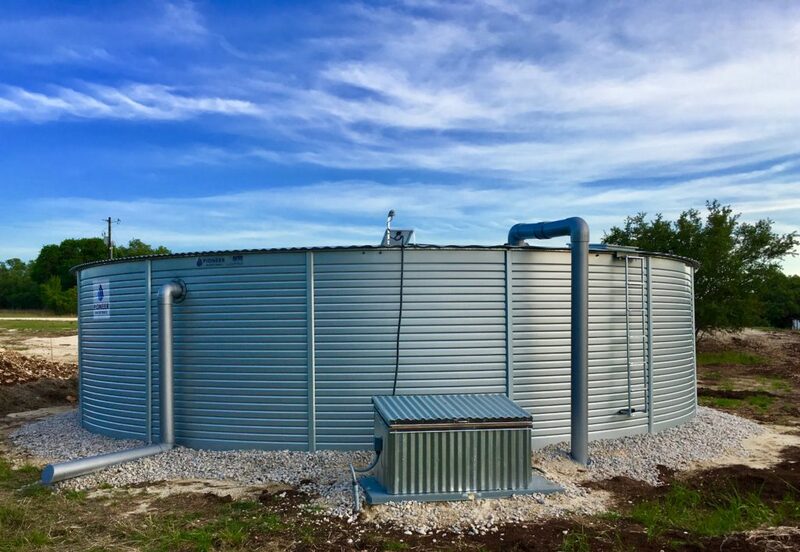 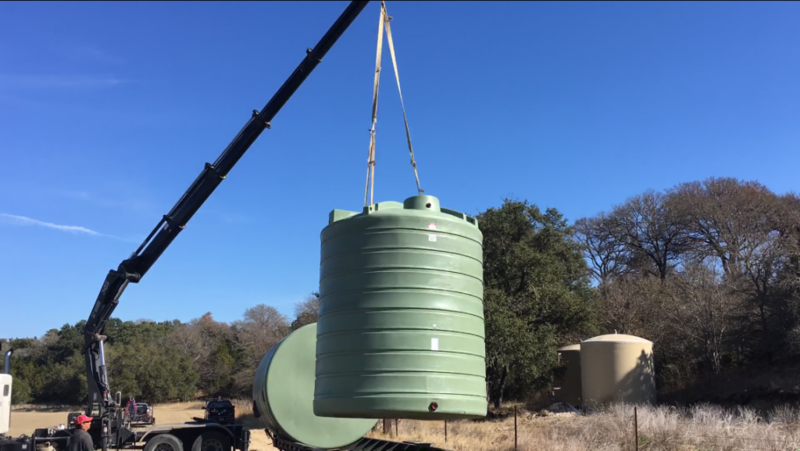 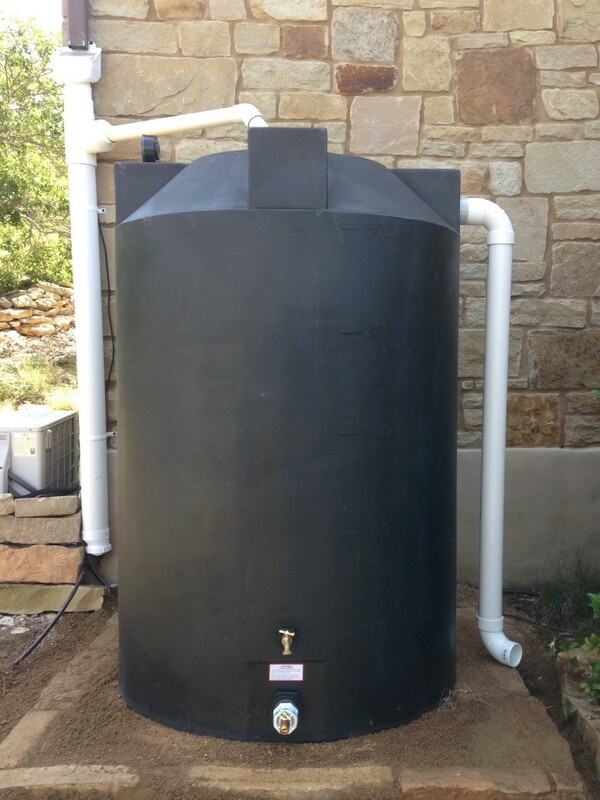 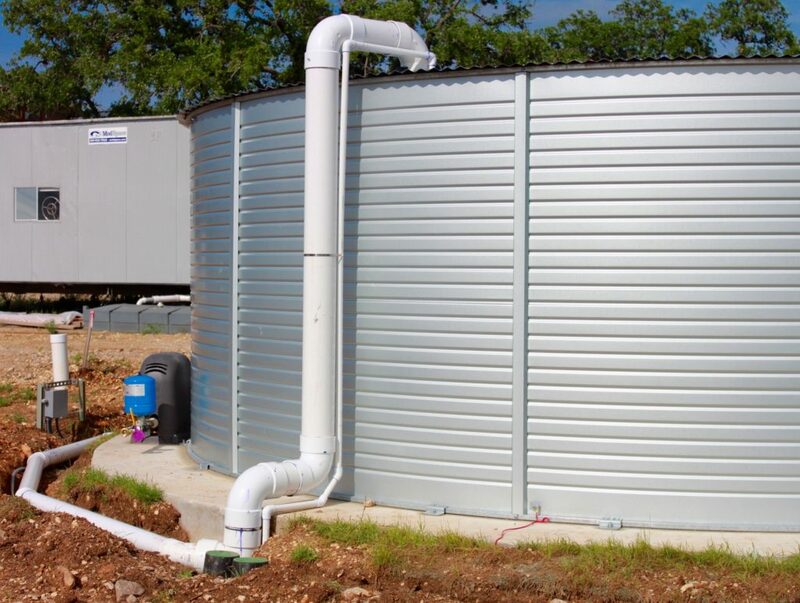 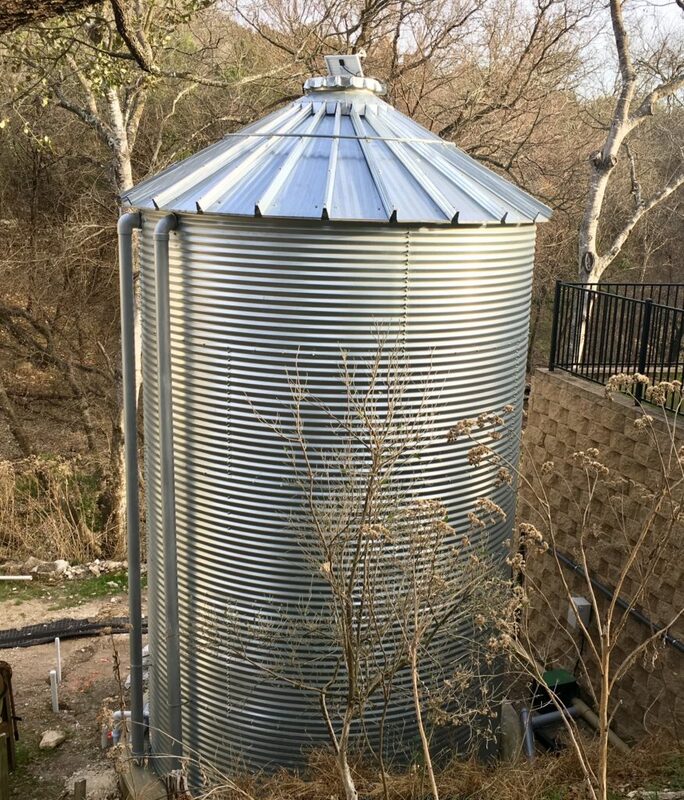 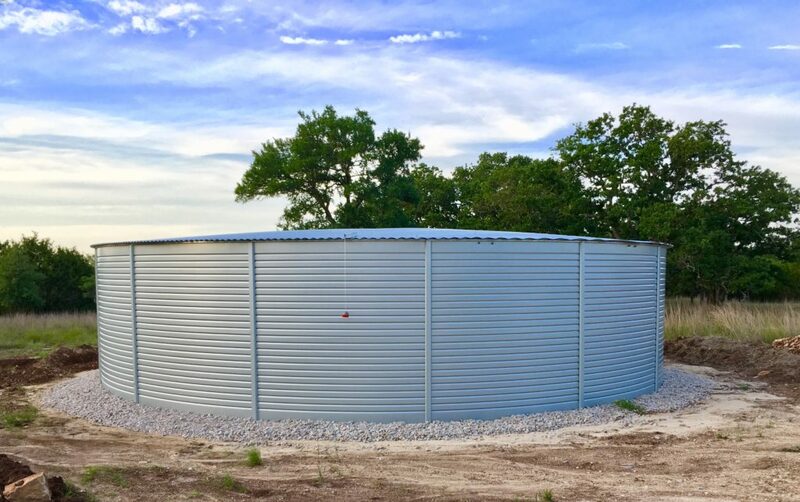 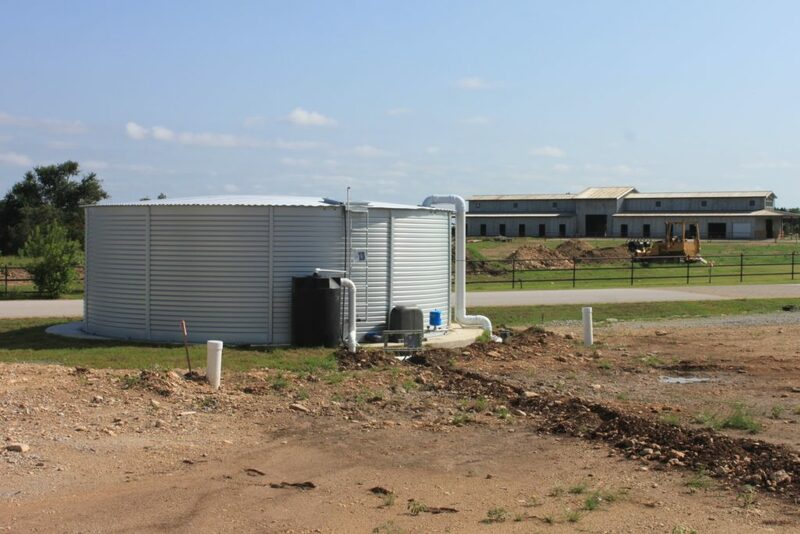 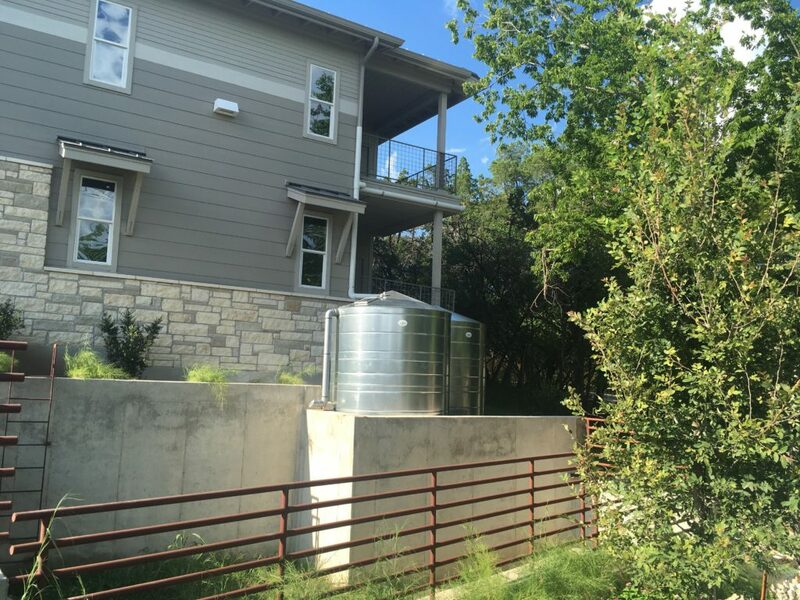 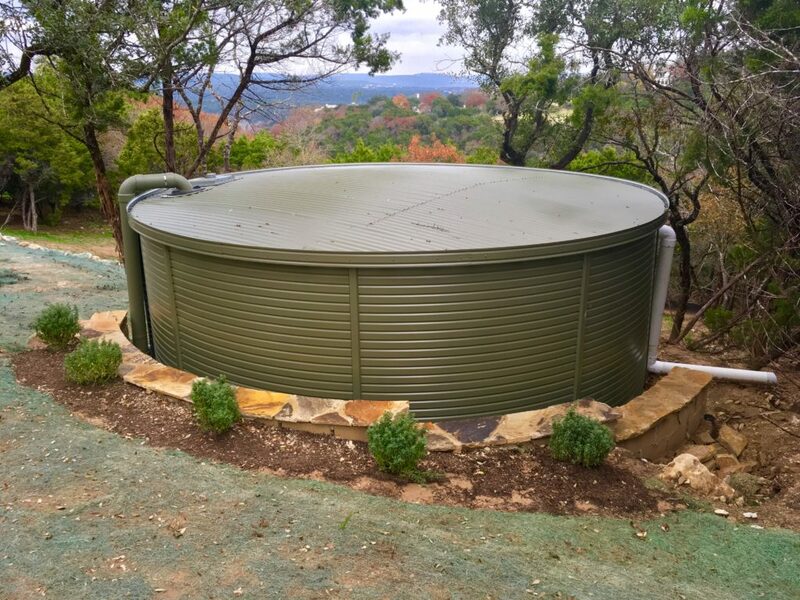 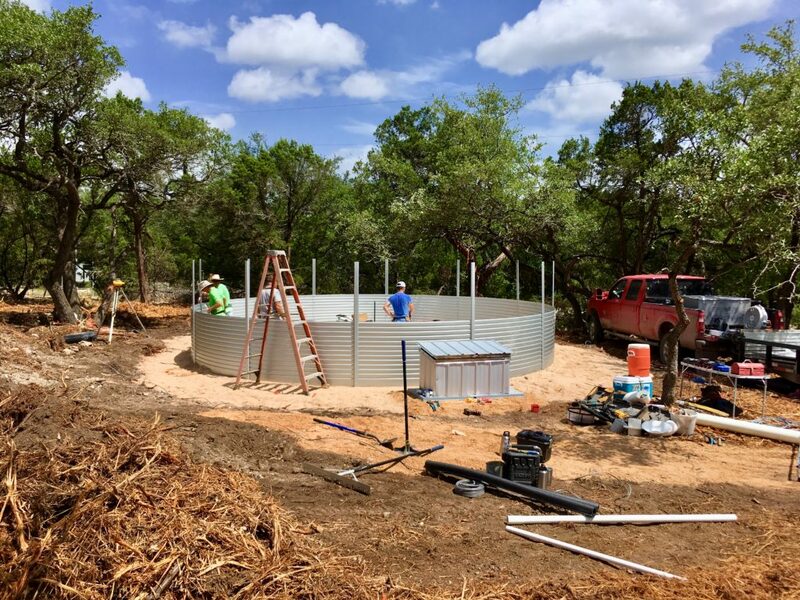 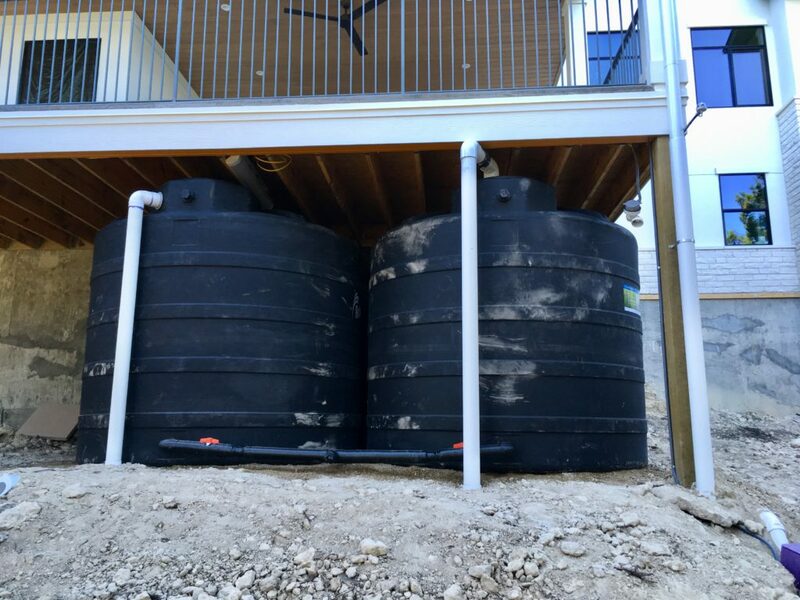 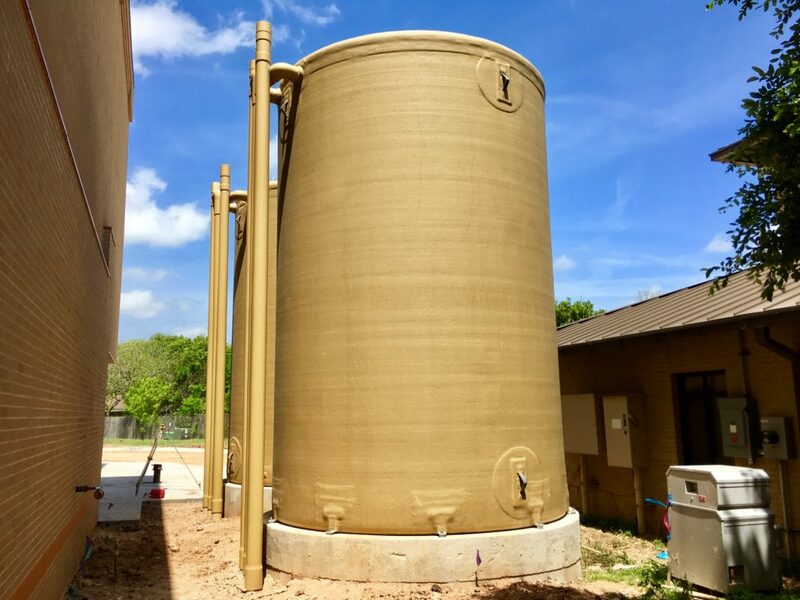 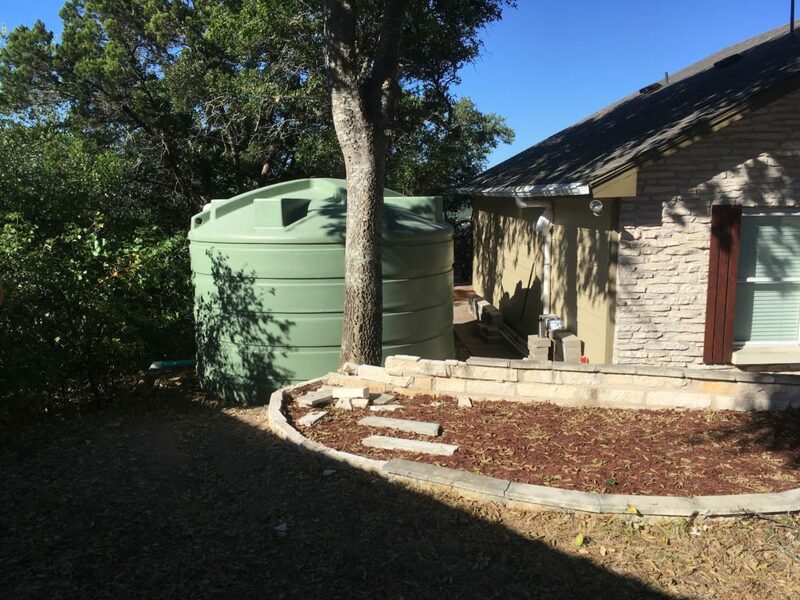 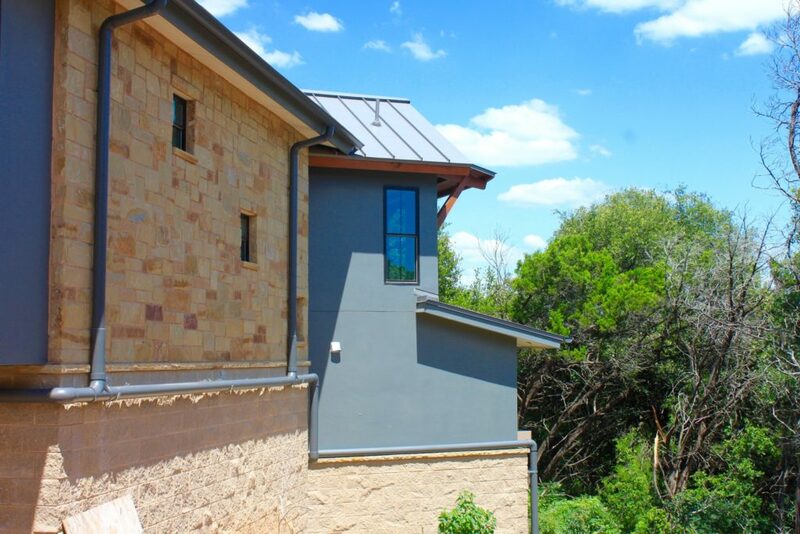 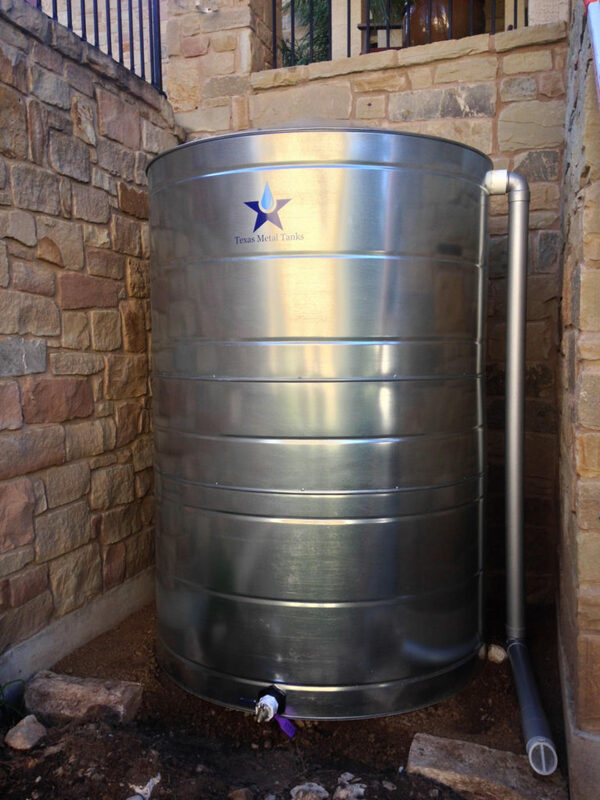 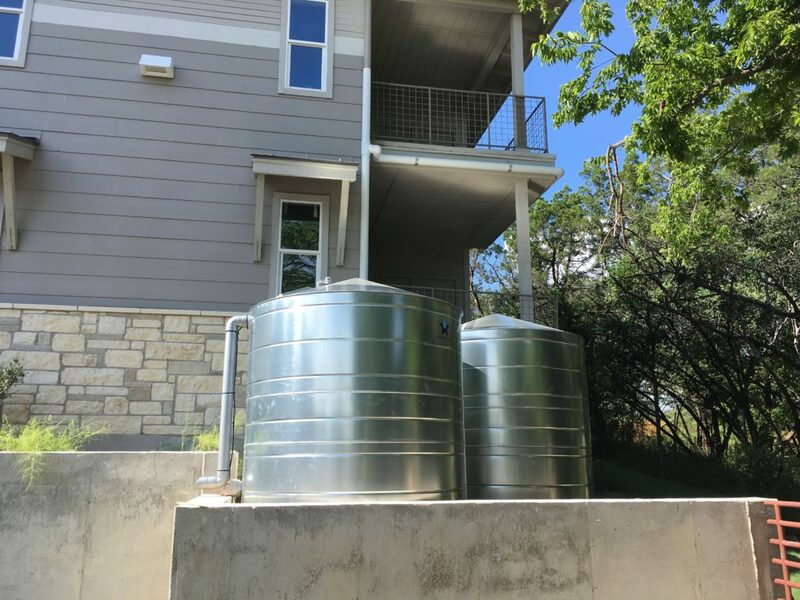 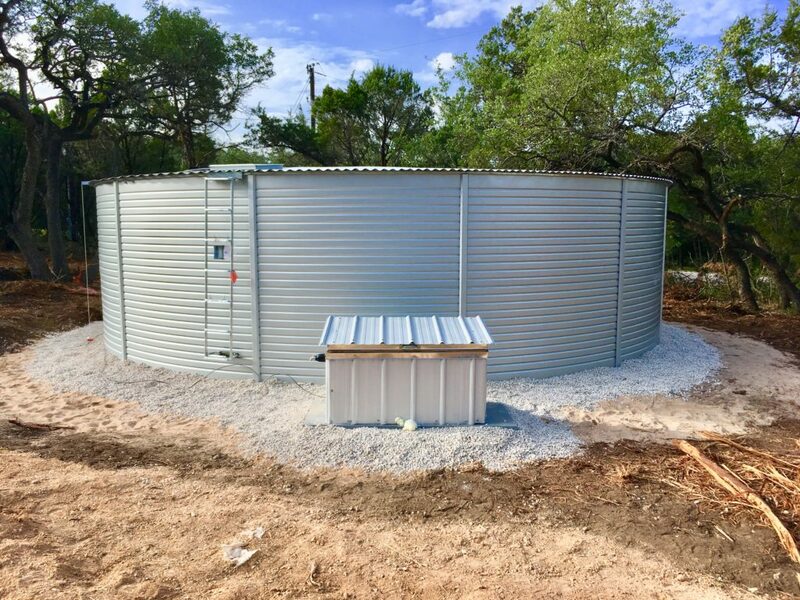 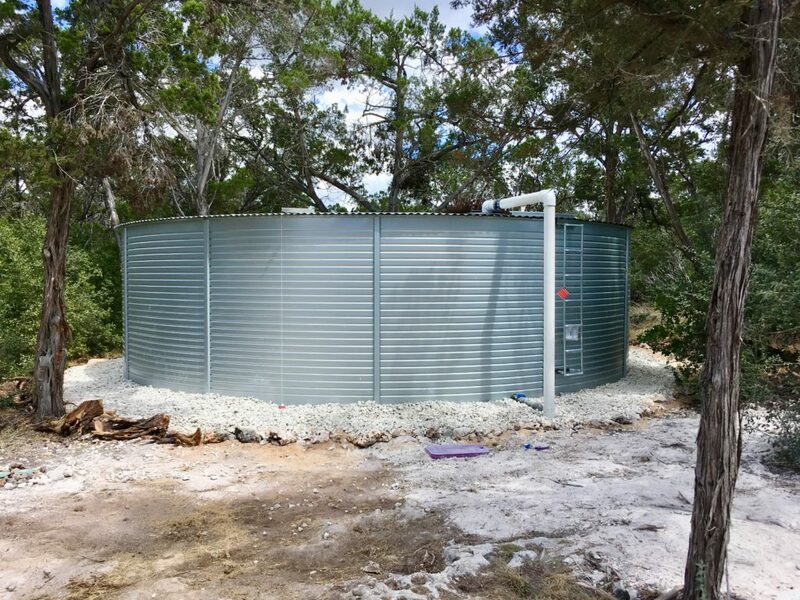 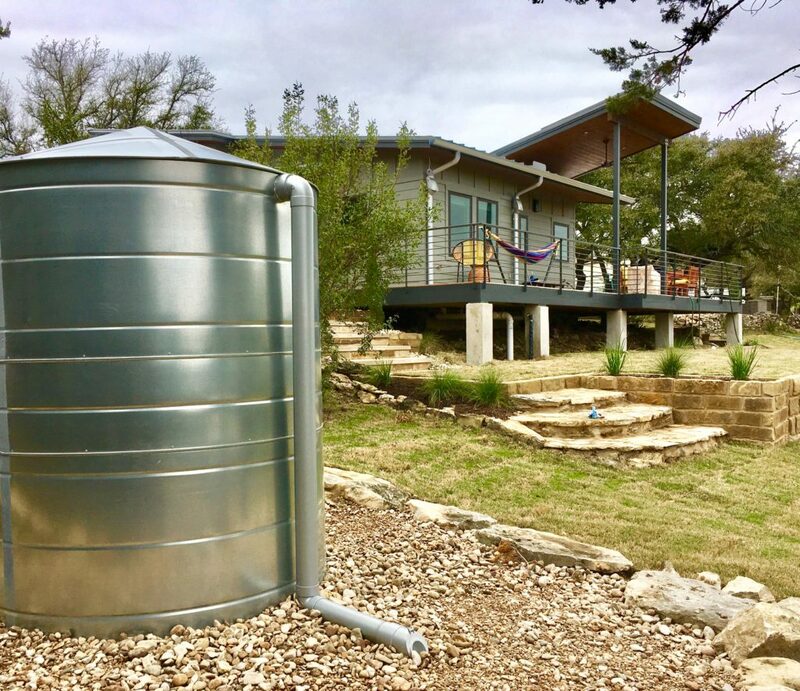 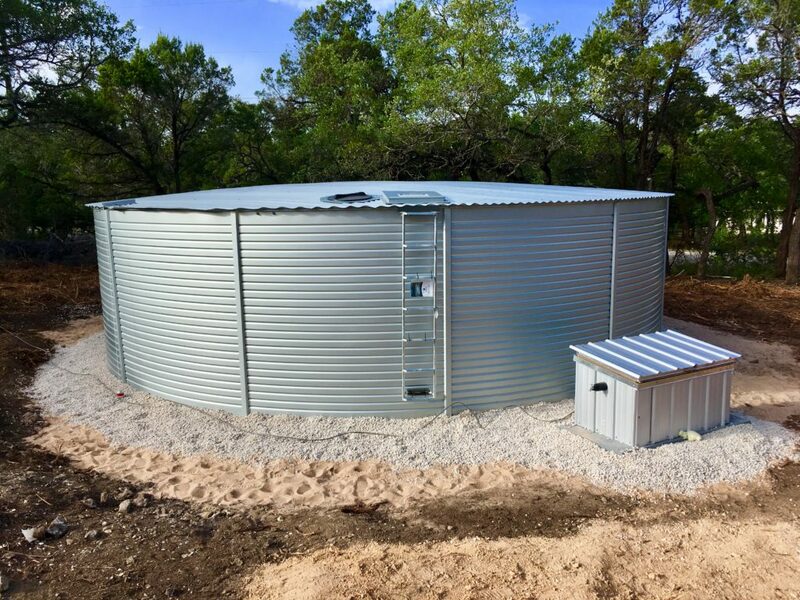 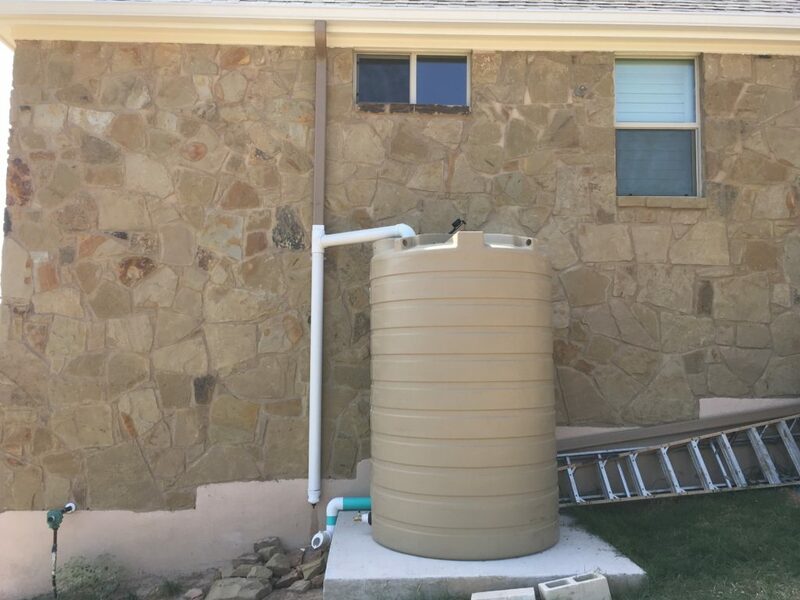 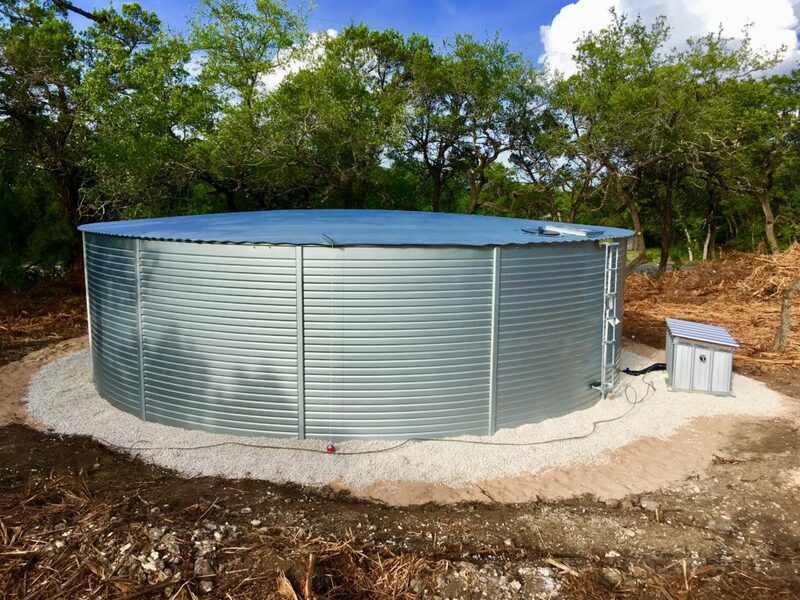 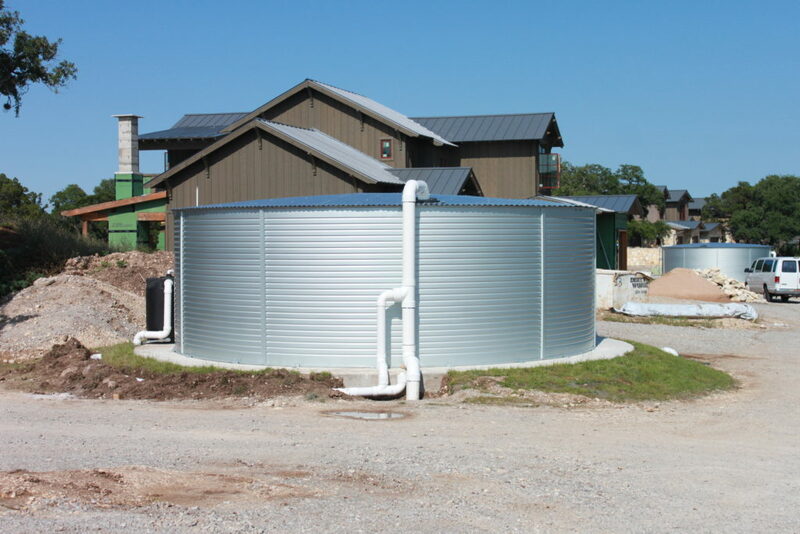 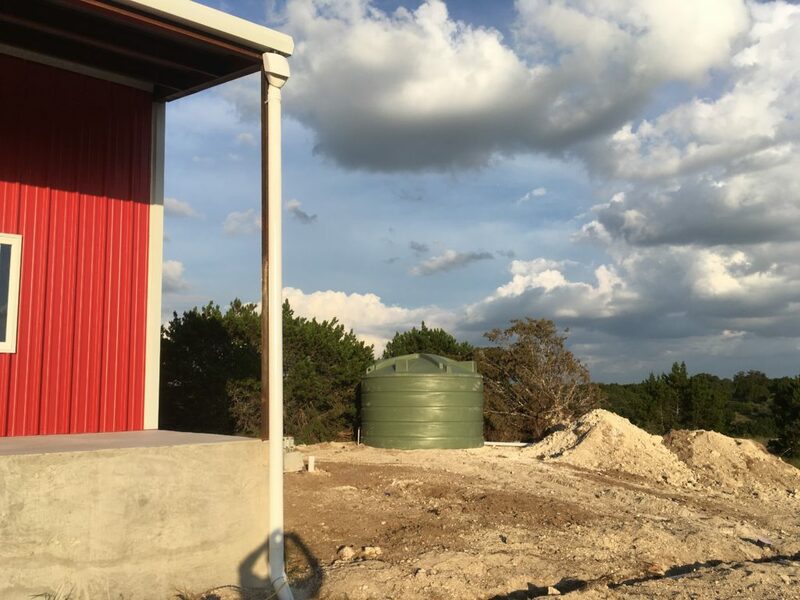 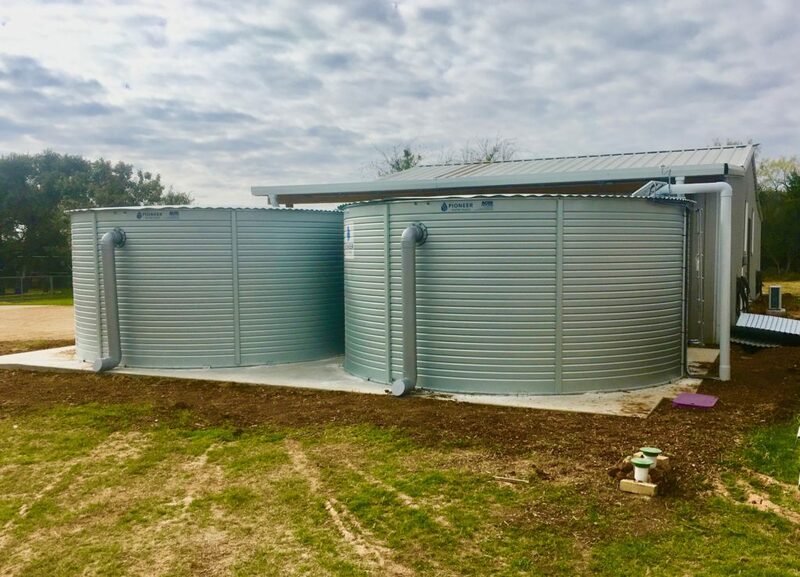 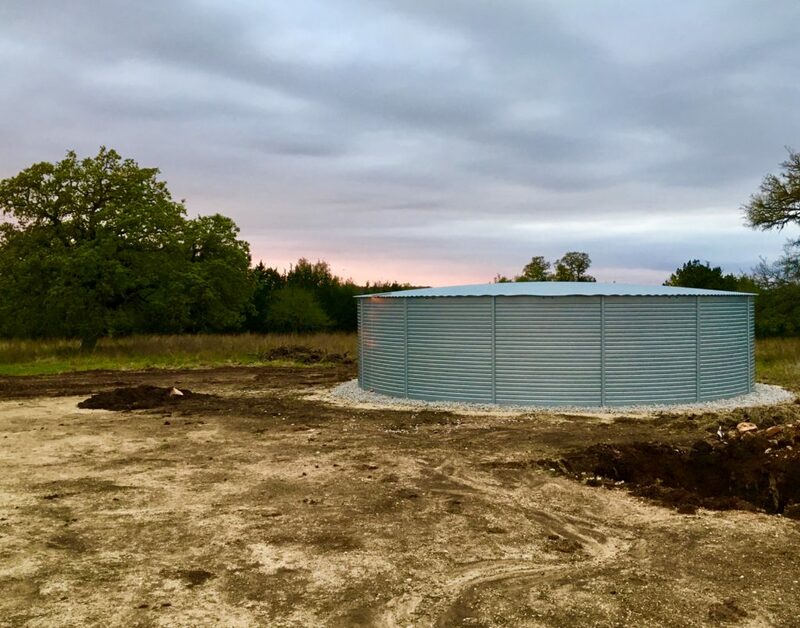 Tall Drink Rainwater Harvesting, LLC is highly qualified in the design and installation of commercial systems for various applications. 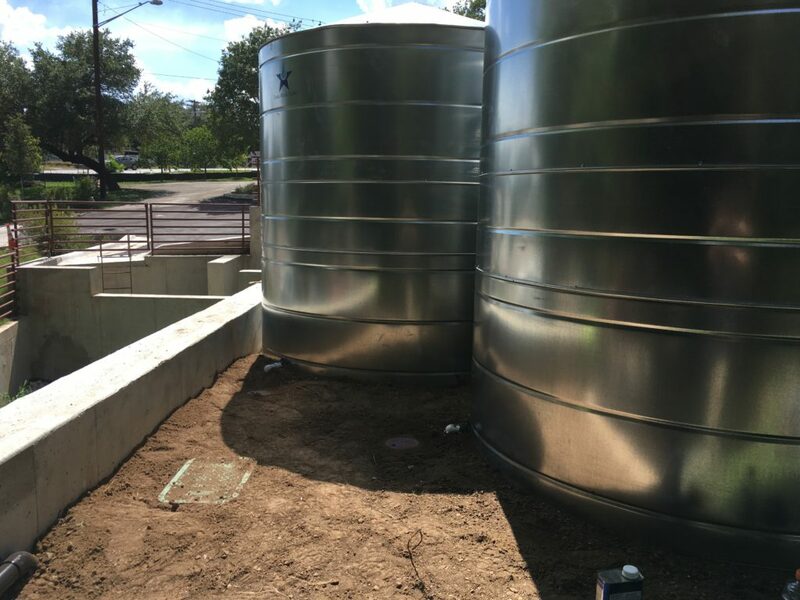 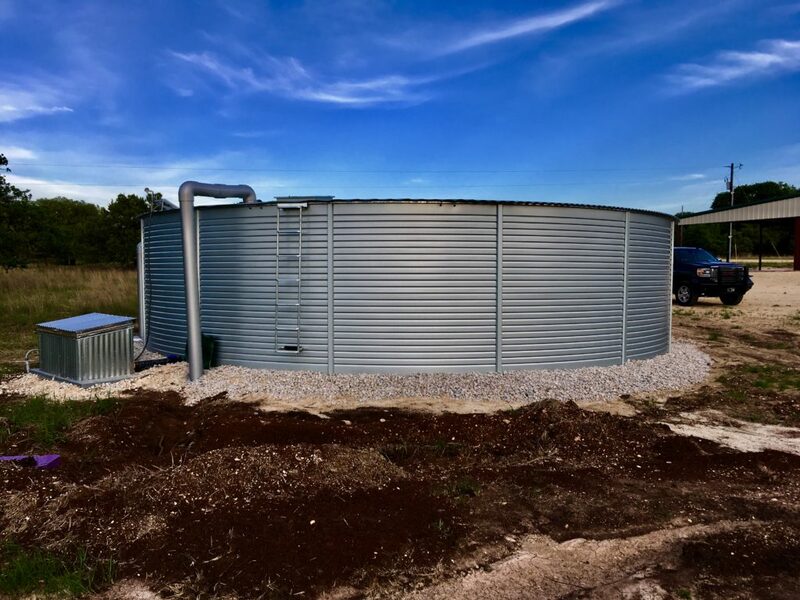 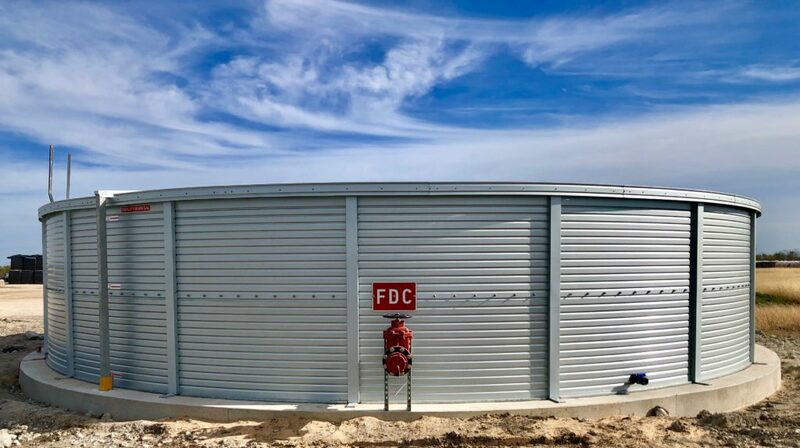 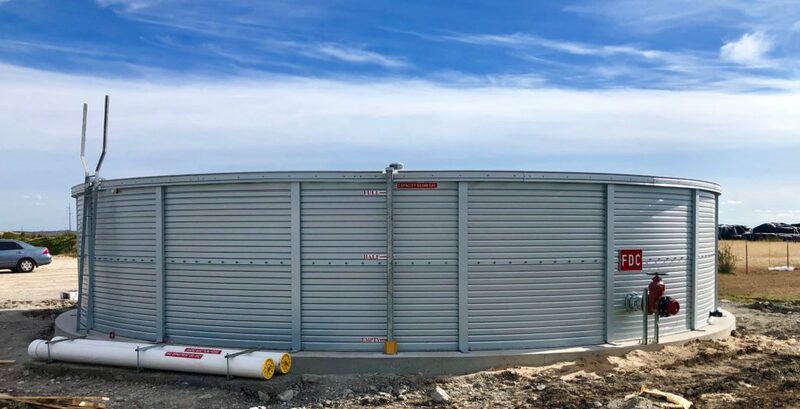 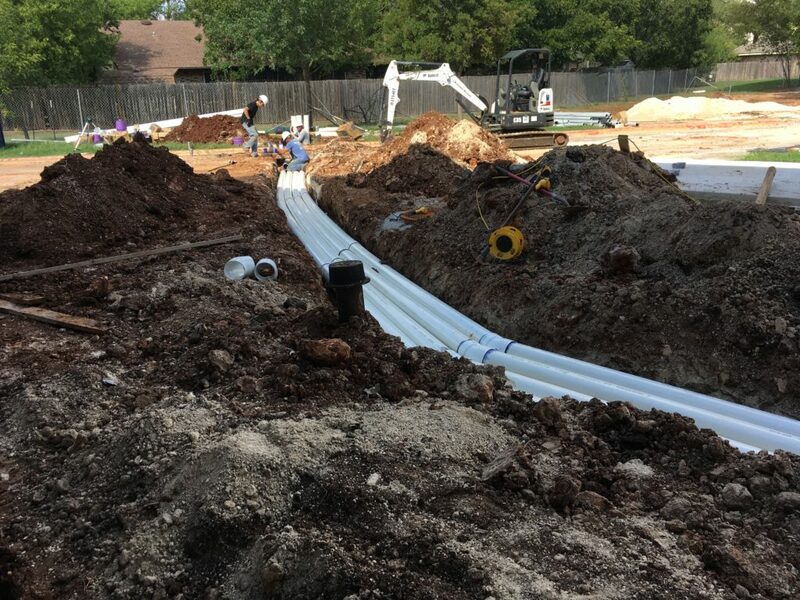 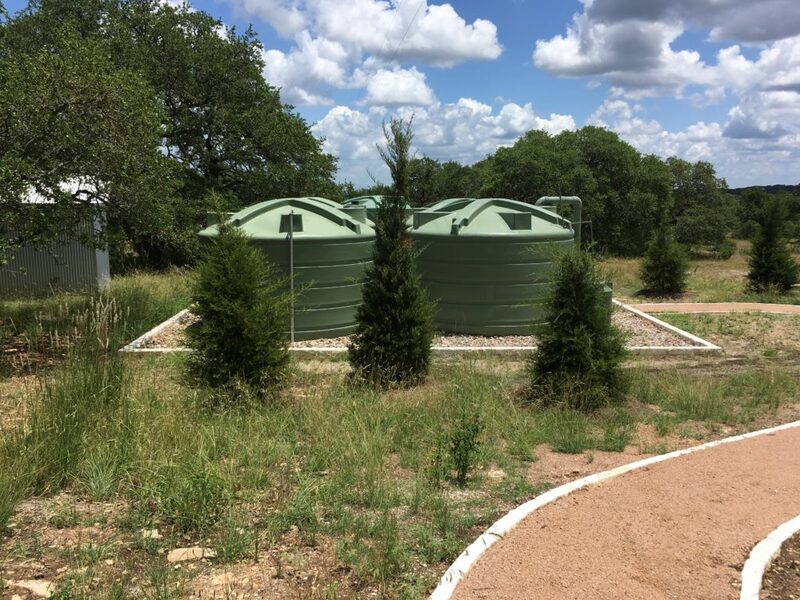 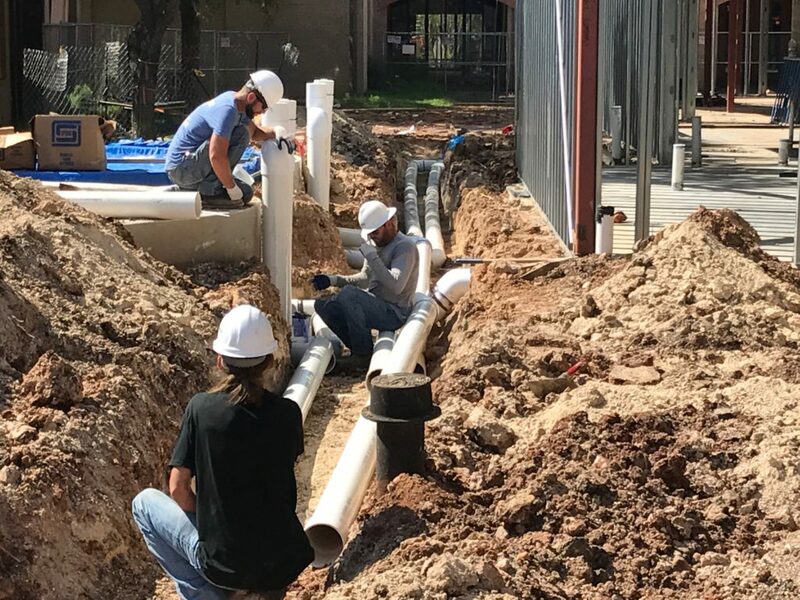 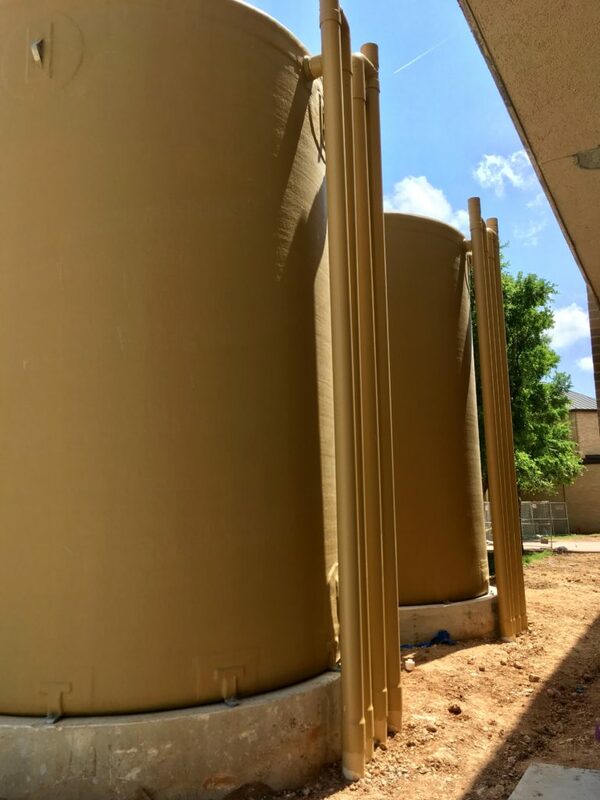 From simple fire protection water supply tanks for FD permits to intricate stormwater control systems for CO permits, we have the experience and resources to implement any design requirements.